We couldn’t even stay one night at the very good hotel because we got up at 12:30am, ate 1am and left there 1:30am for Ben Gurion airport at Tel Aviv. When we were entering to the airport area, we passed the initial security. The guy on the picture has a machine gun. It was just the beginning of very annoying Israeli security. They are paranoid because they know what they’ve been doing. What stupid questions, and why do they care? Because I did not have US passport, I was checked my green card three times. Once they took my green card and went somewhere and came back in ten minutes. The security opened a bag of a girl in our group and checked all the books and literatures and read to see what was written. There is a synagogue in the airport. I thought it is interesting. Are the religious Jews supposed to be in the airport on Sabbath? 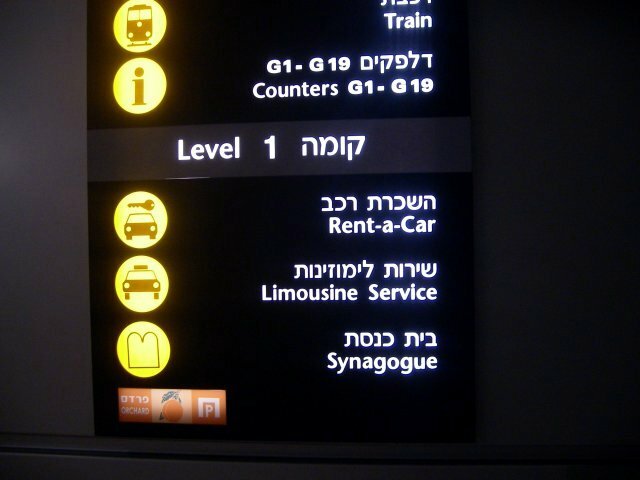 Why do they need a synagogue in the airport? Secular Jews don’t care, and religious Jews don’t come to the airport on Sabbath day. 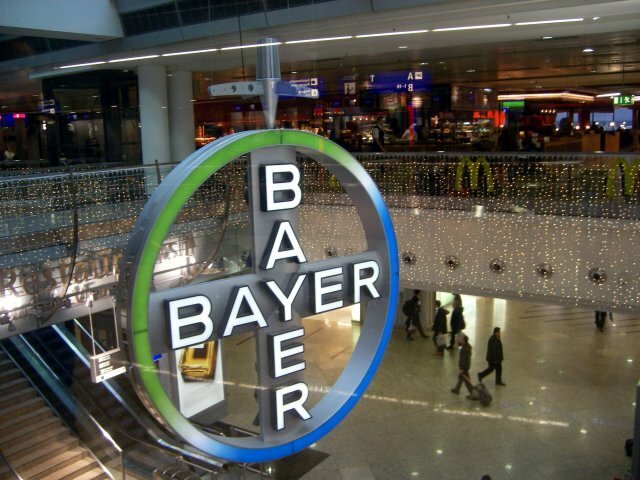 This is of course Germany that we can see huge BAYER sign. Frankfurt airport is so huge, ridiculously huge. We rode an airport bus, and walked thousand miles after that. I do not mind walking a lot, but I do mind the timing. I walked fast and I reached the gate first in our group, and already people were boarding into the plane! Even a flight attendant in the first plane advised us that we may make it to the connecting air plane but we need to move fast. This looks quite interesting to me. 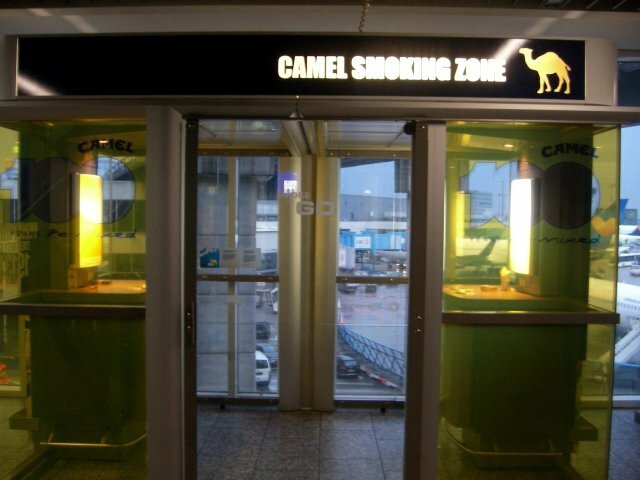 There are many smoking zones in Frankfurt airport, I could not take photos because there were always many people inside the box. 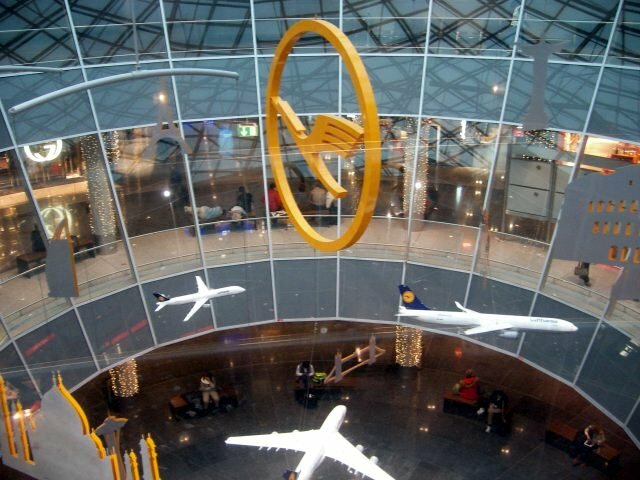 If I remember right, Frankfurt is the home airport of Lufthansa. I don’t like long flight, but I am quite satisfied with Lufthansa. Not like on the way to Israel in Frankfurt, there was no security check this time on the way to Chicago. In Chicago, there were three different immigration gates: one for US Citizen, one for Green card holders, and the other was for everyone else. After long flight, I landed on Chicago O’Hare airport. While the plane was landing, at the right moment that the landing gear began to touch the runway pavement, my wife Hannah called me that she is waiting at the airport terminal 5. She was not supposed to come and pick me up, but she skipped her work. I’ve always driven to Chicago, never landed on Chicago. Chicago. This is what home feels like. During this trip, I saw many things, I felt many things, I learned many things, and I realised many things. But the biggest thing is this: I realised that I truly love my wife, Hannah. Though we have one more day, today is actually the last day in this trip because we will leave the hotel for airport at 1:30 AM. 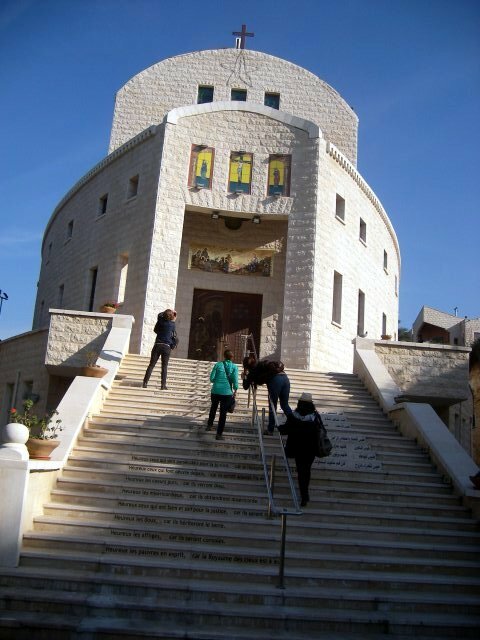 Before we left the St. Gabriel Hotel in Nazareth, I went to the Hotel Church. It was not that huge one, but beautiful one. It is not used currently. Then we went to Mount Carmel. Mount Carmel is not just one peak of mountain but a whole range, and we went to the highest point where the Carmelites are living. 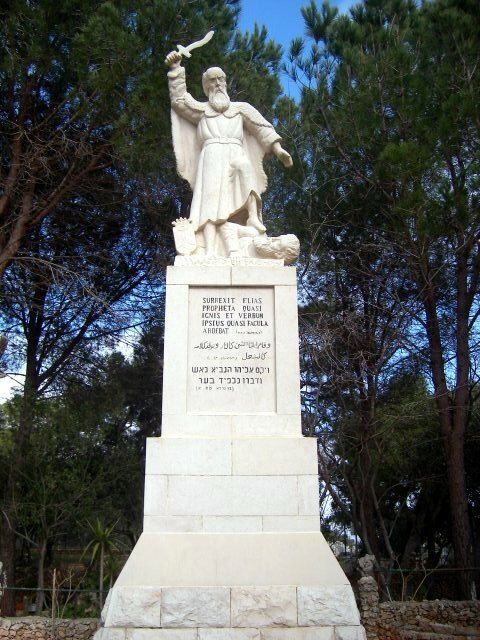 This is the prophet Elijah’s statue in the yard. 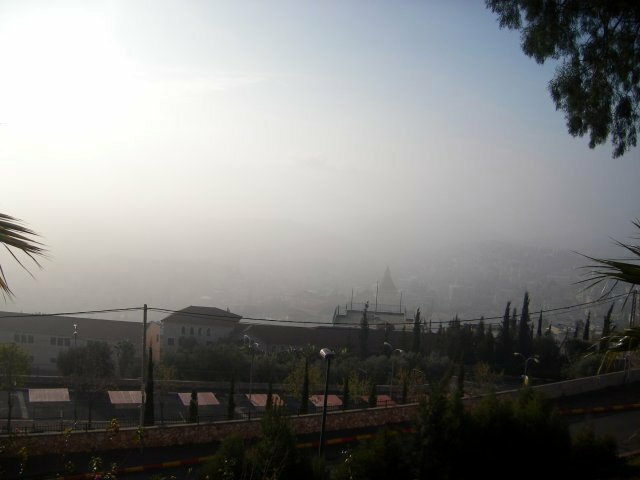 This is the view from the top of the Mount Carmel eastward. 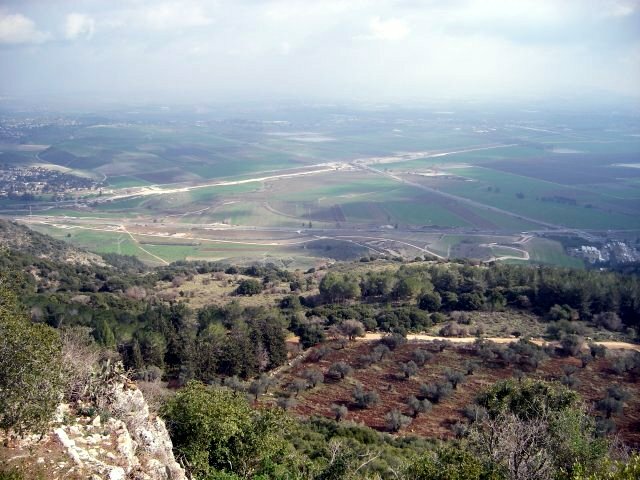 If Elijah competed with other prophets of Baal on this spot, he would have dragged them down to the valley on the picture above (according to Old Testament professor Ted Hiebert). This is such a beautiful view. On clear day, we can see the Mediterranean sea, Nazareth, and whole area. 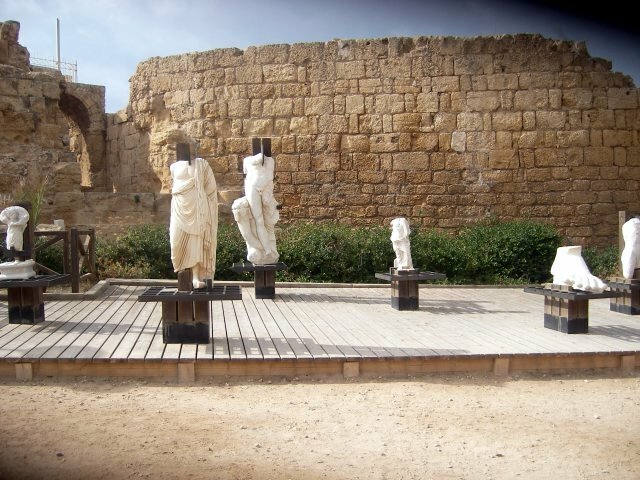 Then we went to that famous Caesarea. Caesarea is built by Herod the great, named after, of course, Caesar. 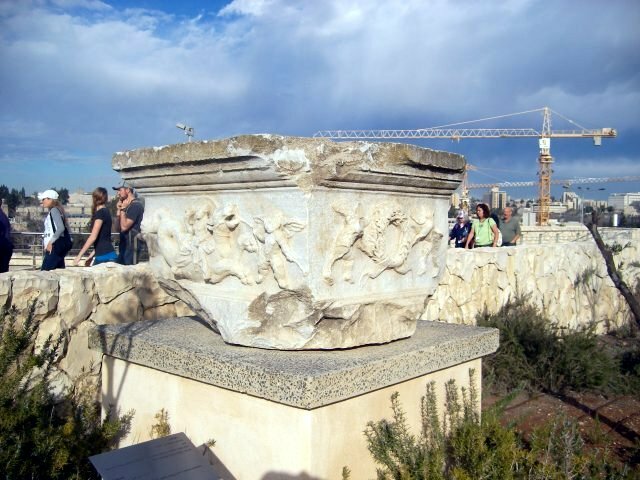 Herod wanted non-Jewish totally Roman city. This is the theatre. 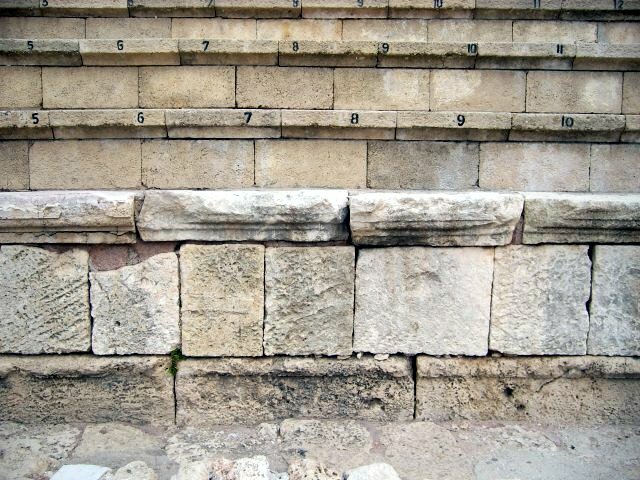 You can see the two levels of seats in the restored theatre, but originally there were three levels, containing total five thousand people. It also has many exits for emergency. And they filled the lower part of the stage and floated small boat for the marine scene. In the picture above, you can easily identify which is original and which is restored seat. 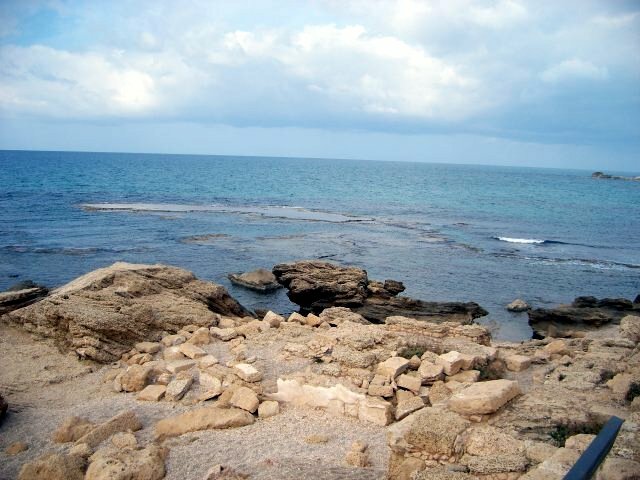 Caesarea is one of the important sites for Christians including Peter’s visiting Cornelius. And there is one more thing for Christians; Pontius Pilate, the name which Christians cannot forget. This is the replica to show what was found. Here we can identify “Tiberius,” the name of the emperor. “…tius Pilatus,” part of the name of Pontius Pilate, and “Praefectus Iudaeae” which means Prefect of Judea. This is the ruin of the ancient harbour. 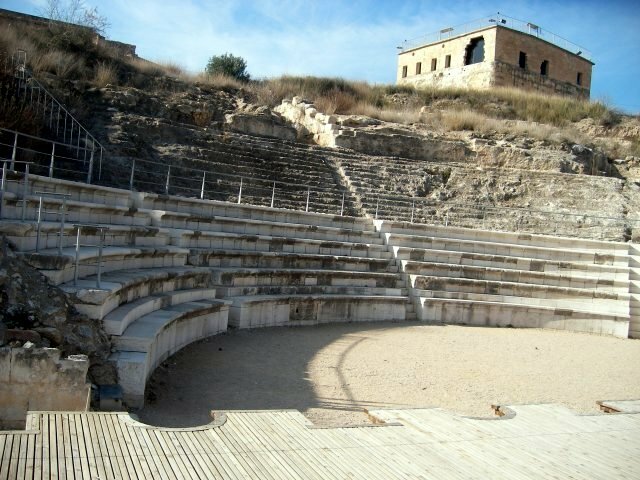 There was one more entertaining thing beside the theatre – Hippodrome, the Formula one in the ancient days. This is very impressive to me because of the movie BenHur. 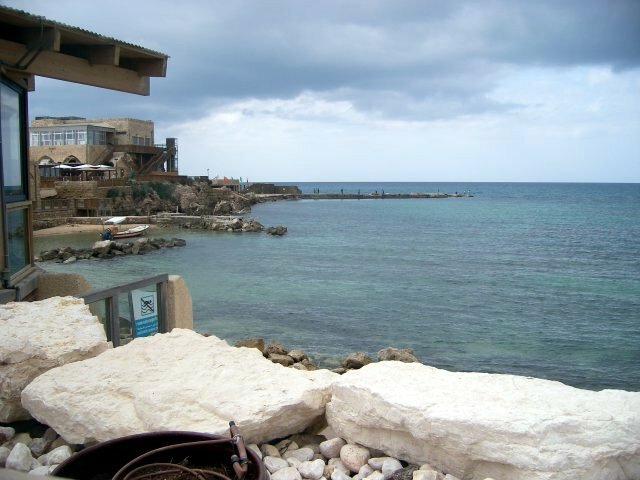 Then we had lunch all together at the Port Cafe at Caesarea, and this is the view from the restaurant. 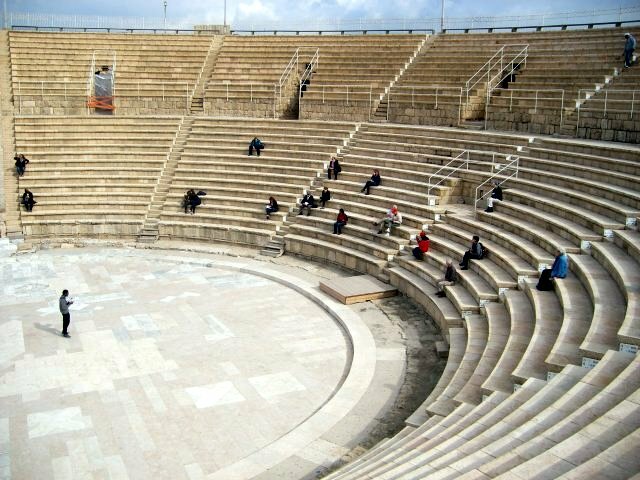 Caesarea was built by Herod, but August borrowed him architects which means this city was not only Roman culture, but also Roman technology. 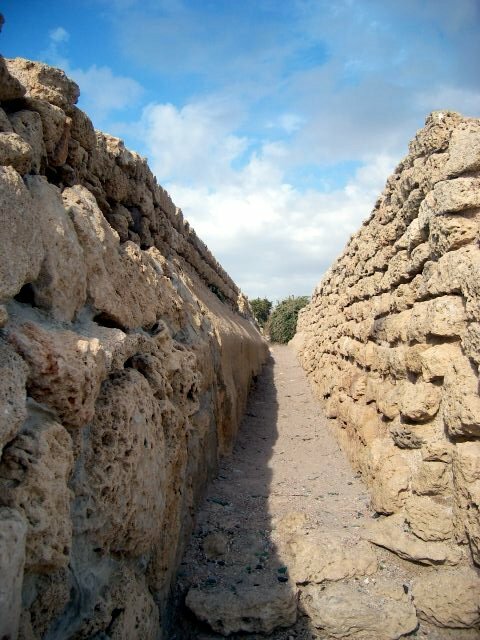 When we say Romans, we always think about two things: Roman Road and Roman aqueduct. 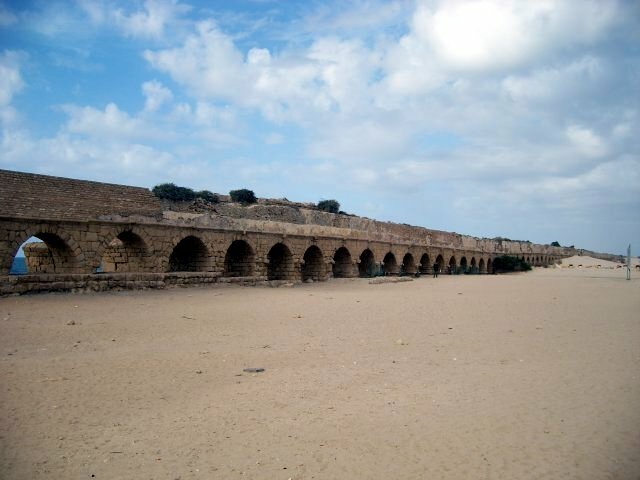 Consequently Caesarea also had two aqueducts. And this is one of them. The aqueduct was connecting the city from the spring in the mount Carmel. And the depth of the aqueduct reaches my waist and if we consider the water was constantly flowing, the amount of water was huge. 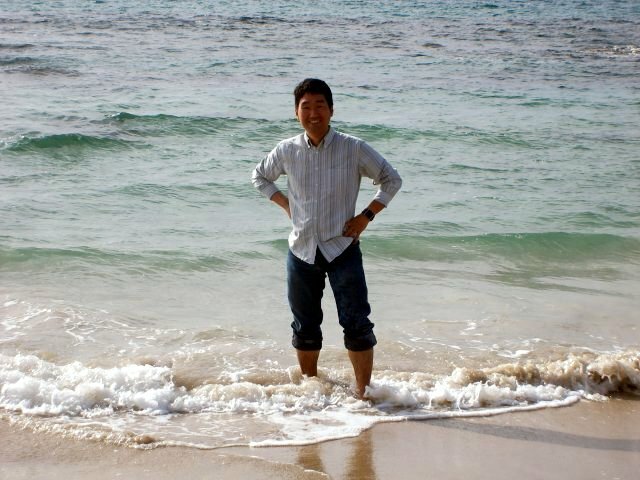 And I enjoyed the beach of Mediterranean sea. Sadly after I came out of the beach, I cut one of my toes on the asphalt. 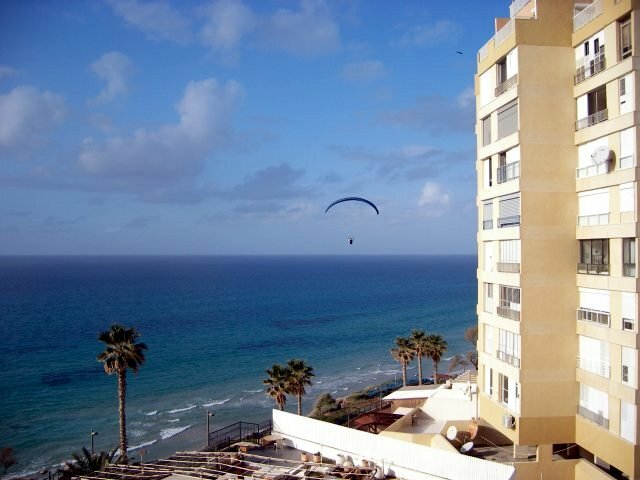 Then we drove to the Seasons Hotel in Netanya. This hotel is very good. 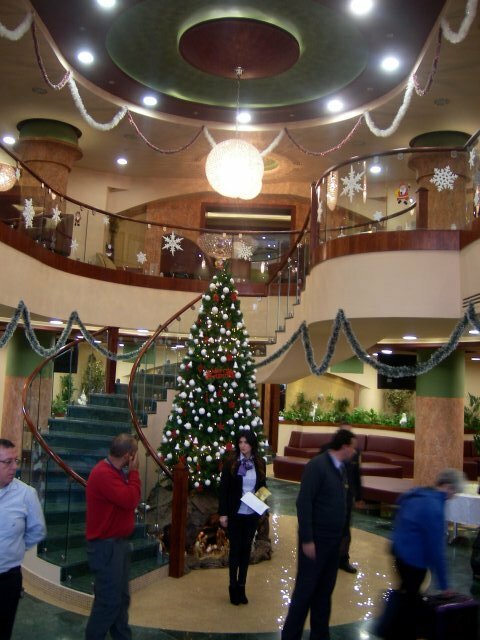 I stayed at crappy hotel in Nazareth for many days, and I cannot even stay one full night at this awesome hotel! This is the view from my hotel room. Today we kind of loose day. We went to Megiddo. Megiddo’s archaeological excavation was done by Oriental Institute of Chicago University, and their job and results are displayed at Oriental Institute Museum in Chicago. 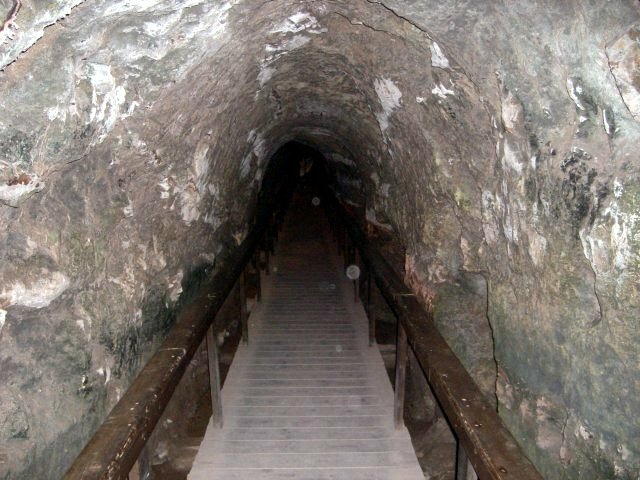 On the way to Megiddo, we went through a tunnel under the mountain which the ancient Nazarenes tried to push Jesus down off the cliff. According to our George, traditional Jewish execution is: to bind the hands in the back, throw him/her from the cliff head down, and pile the stone over the body. 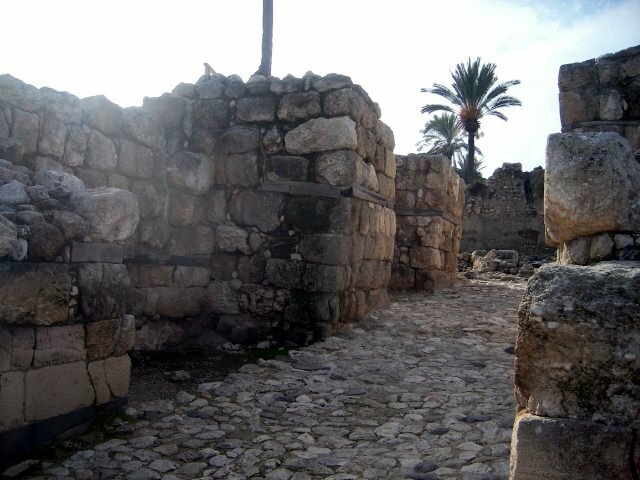 This is the outer gate constructed by Solomon. There is another inner gate by Solomon. Two major builder of this city is Solomon and Ahab. 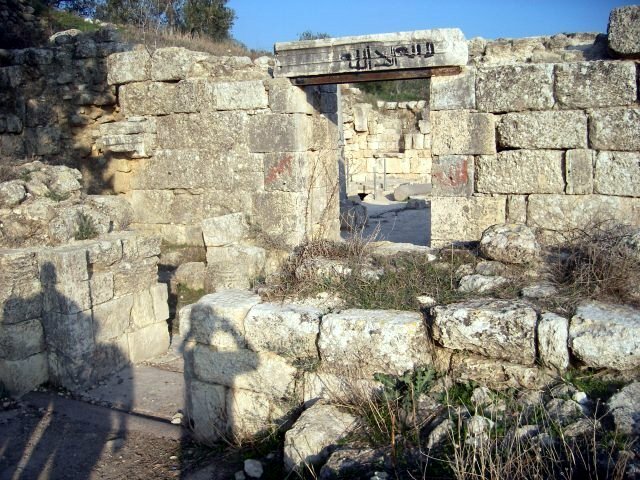 This is the older gate made by Canaanites. 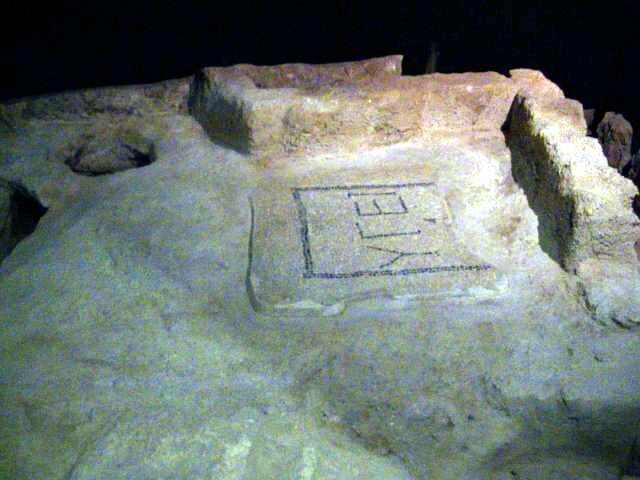 This is the ancient sacred place, and the round platform is at least thousand years older than Solomon. This is the grain storage with two stairs; one for going down, the other for coming up. It used to be covered to protect the grains from rain, dust and so on. Then we went down to the water system tunnel. 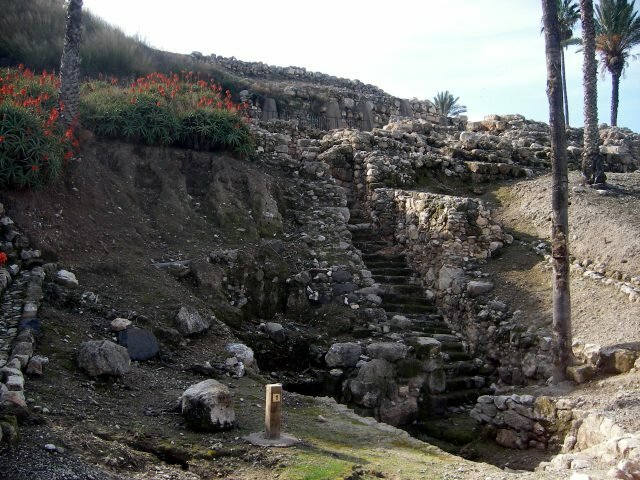 The city of Megiddo had same problem as Jerusalem – the water source is out of the city wall. So they dug the underground passage to the water source. 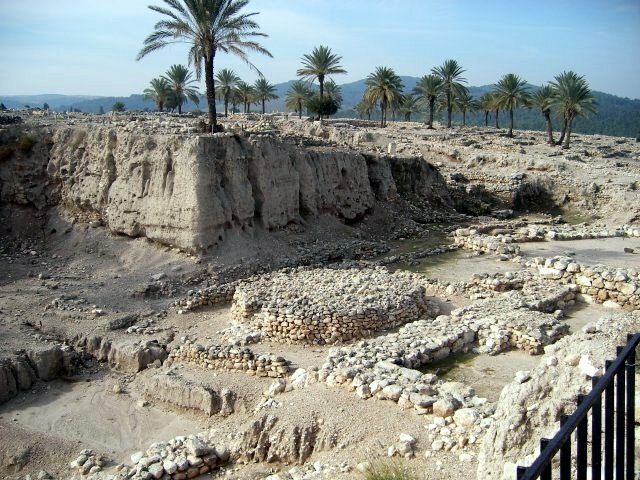 Megiddo has been the key point since the human history, because it is the bridge between Egypt and Mesopotamia. Without crossing here, they cannot go to the other side. 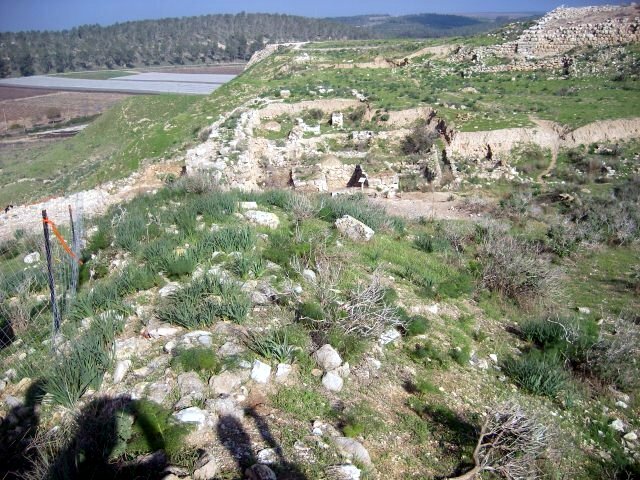 Megiddo comes out a lot in the Bible, and Armageddon in the Revelation is Greek transliteration of Hebrew word Har-Megiddo which means the mountain of Megiddo. The church has two level, and there are lots of arts from all over the world are on display on the upper level. This one is from Japan and the writing at the bottom says Flower / Of / Holy / Mother / Son, and we can say Beautiful Holy Mother and the Son. 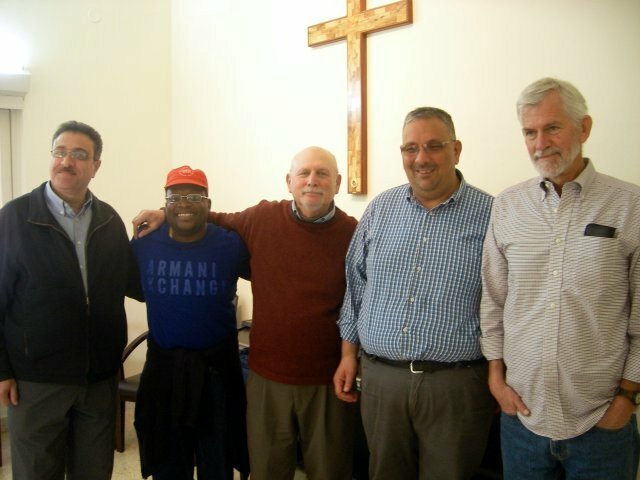 Then some of the McCormick group went to Nazareth Evangelical Theological Seminary, and others enjoyed the first and last free time. The president of NETS is Arab Israeli Christian. 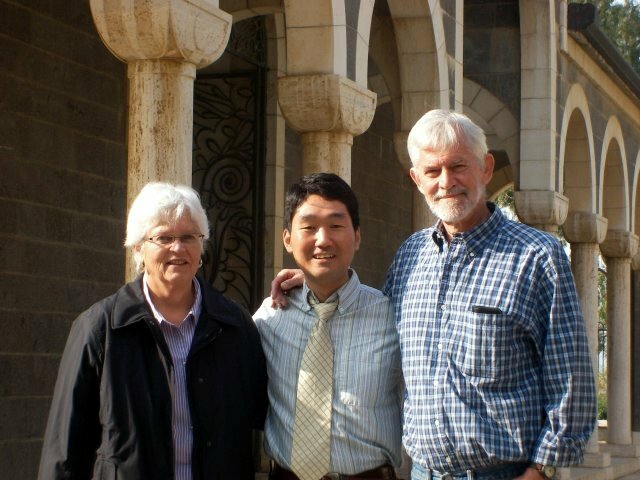 We heard many things, but I am glad that there is Christian seminary in Nazareth. 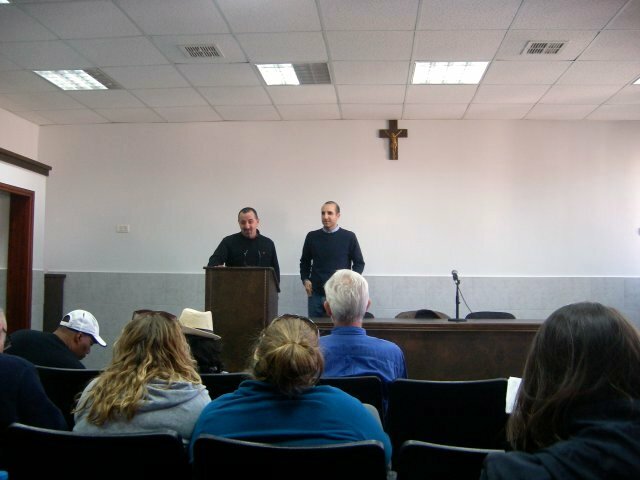 As Arab/Palestinian Christian seminary, they have so many things to do. I hope we can build good relationship between NETS and McCormick. Today, we first went to Zippori or Sepphoris. I have no idea where I can find this in the Bible. This is the water reservoir little bit far from the city. It is very deep and big. 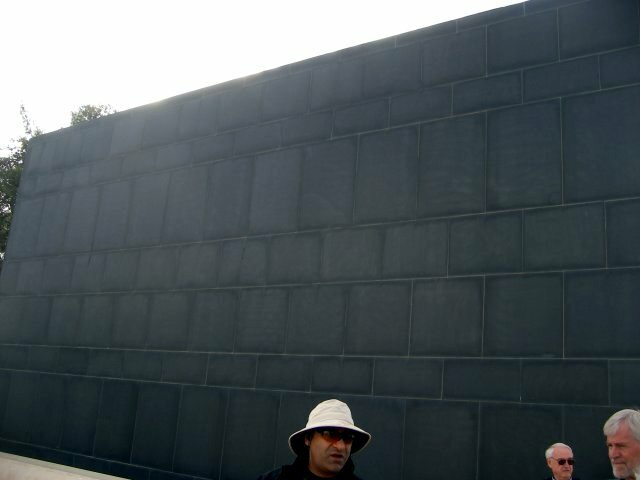 It can contain more than one million gallons of water. 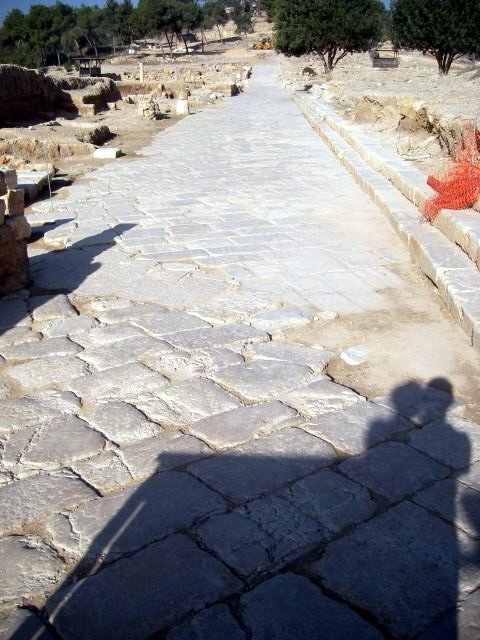 This is Roman paved road, and still well-preserved. 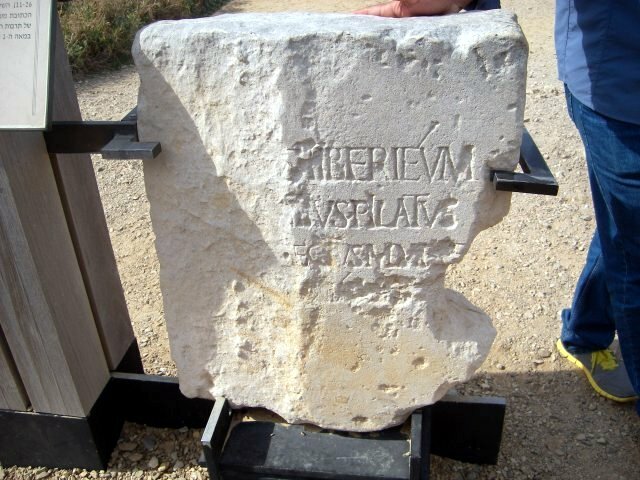 According to Roman recording, there was not even enough space to put needle between the stones. And the road is always two wagon width for the marching of the legions and slightly arch shape so that it can drain water to both sides. Roman architect used to say that the stone is their friend and the water is their enemy. Not only the road, but also there were so beautiful mosaics along the road side. We went into Nile House which is one of the public buildings. It contains so many beautiful floor mosaics. This is a theatre. I wonder if the show was free and open to public or they charged in some way. 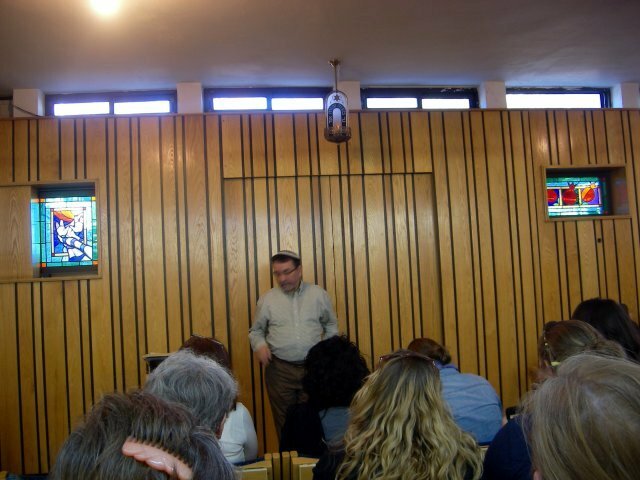 Then we went to a synagogue. It was also very beautiful. 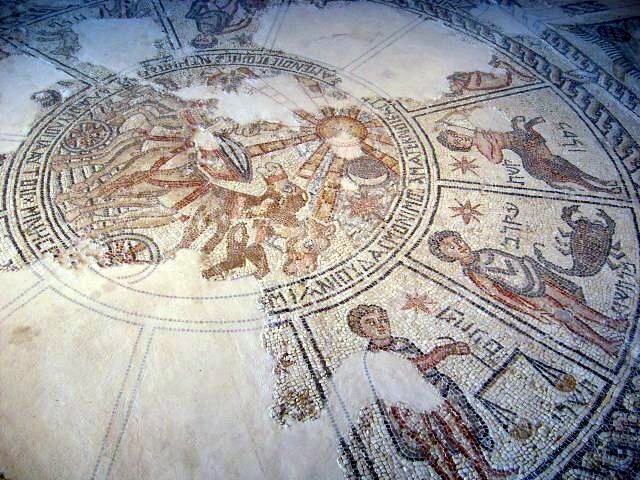 But the zodiac mosaic in the CENTRE of the synagogue shocked me. 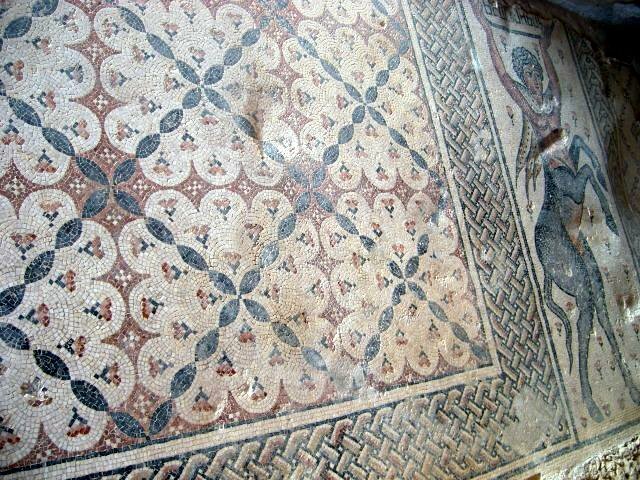 All other floor mosaics are related to Torah and/or Judaism, but why the ancient Jewish people put the pagan zodiac in the centre of the synagogue? The city of Zippori is so well-preserved because it was destructed by earth quake and never rebuilt. And the city of Pompey was also so well-preserved because of the volcano. Same is Qumran. 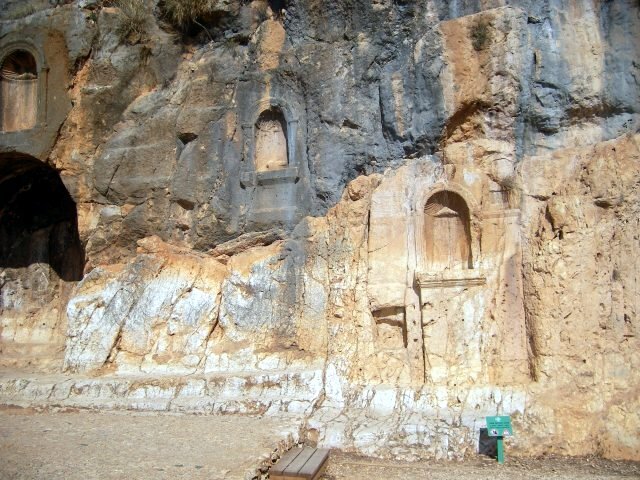 They were threatened, so they put the scriptures into jars and kept them in the caves. The community itself was completely destroyed. It may not proper to say in this way, but their disaster and catastrophe is our blessing. Because of their disaster, many things were able to be preserved, and now we can study them. 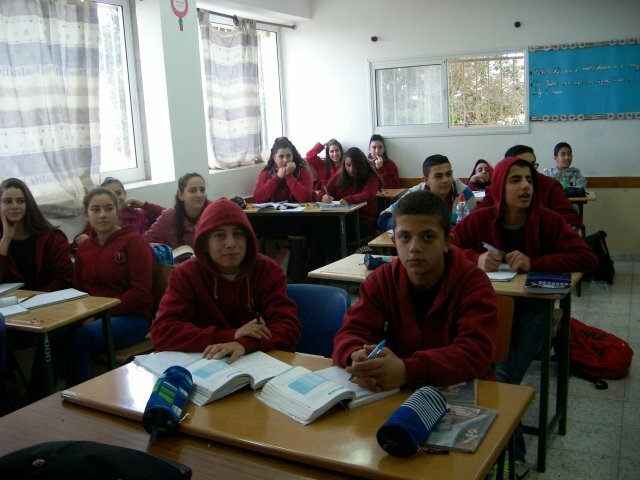 Then we went to Mar Elias school. The Christian school in small town of Ibillin near Nazareth. 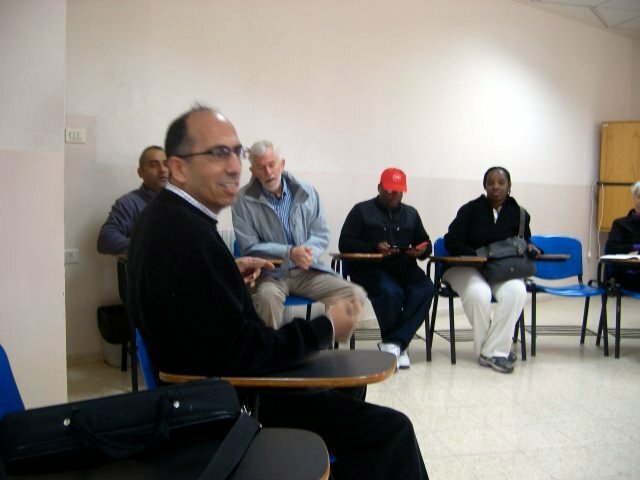 It provides education to any students including Palestinians, Arabs, and so on. They used to have Jewish students too, but none now. One of the building was funded solely by the ex-president Bill Clinton. After we heard from the director and teacher, we went into a classroom. 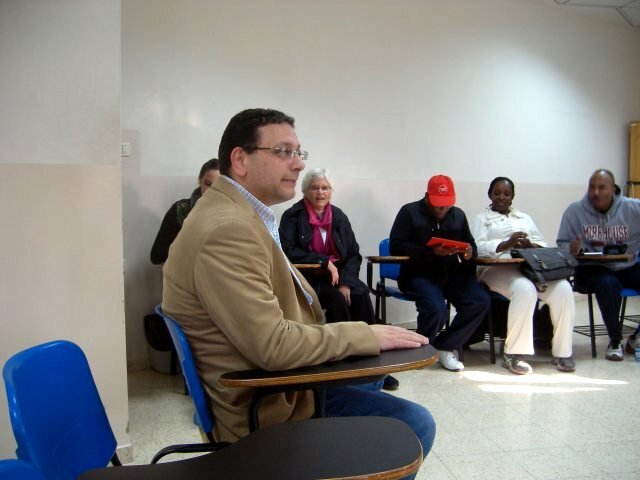 It was Hebrew class taught by Jewish teacher. And I was told that this school is the only one where Jewish and Arabic (or Palestinian) teachers teach together. The kids are typical kids – laughing a lot and noisy, happy. It was my happiest day just watching the kids being kids. When we were leaving the classroom, the girls came and asked me if I am from Korea. I said, “I am from Chicago, but I was born and grew up in South Korea.” They were so happy and asked me to take picture together. And then they talked about a few Korean TV shows and signers which I did not recognise because I do not keep track with the Korean culture. I just felt wow! Then we went to the Church next to school. If you see it from the side, you may recognise it is ark (boat) shape. 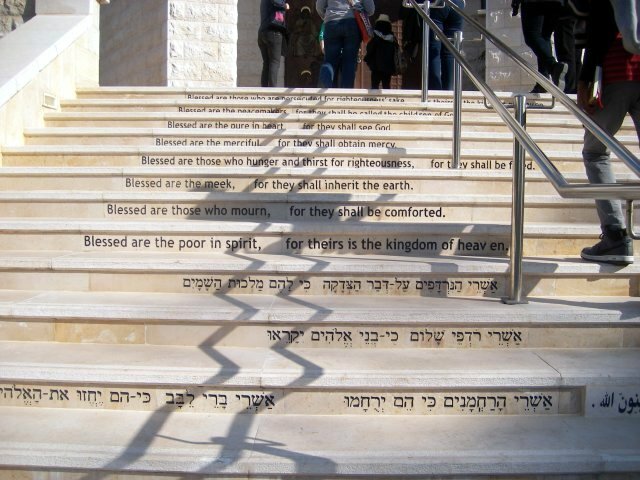 On the stairway, Jesus’ preaching on Matthew chapter 5 beginning “Blessed are…” is written in four languages of English, French, Hebrew, and Arabic. This is the Church door. 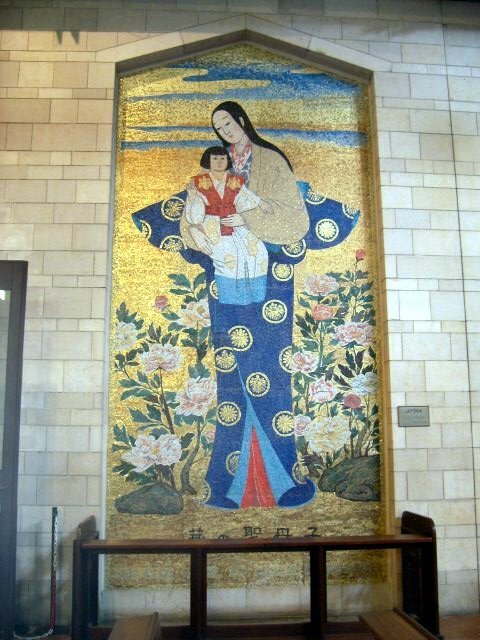 You may recognise the children around Jesus are actually from all around the world. 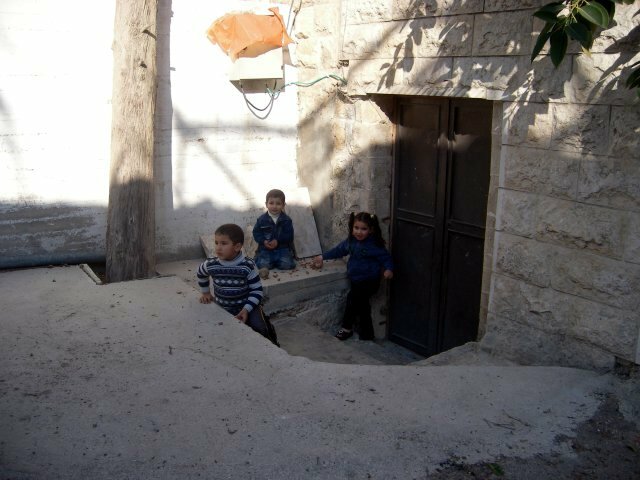 And the two boys standing a bit farther than other kids are a Jewish boy and a Palestinian boy. The smaller boy is wearing Kipa on his head, so he is Jewish. This scene is that the Palestinian boy is bringing Jewish boy to Jesus. 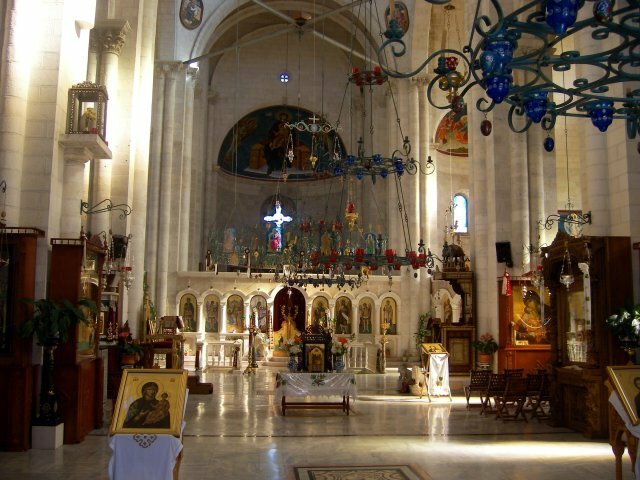 This is the inside of the Church. The church is so beautiful, made out of donations not only money but also talents. Each piece was all made. 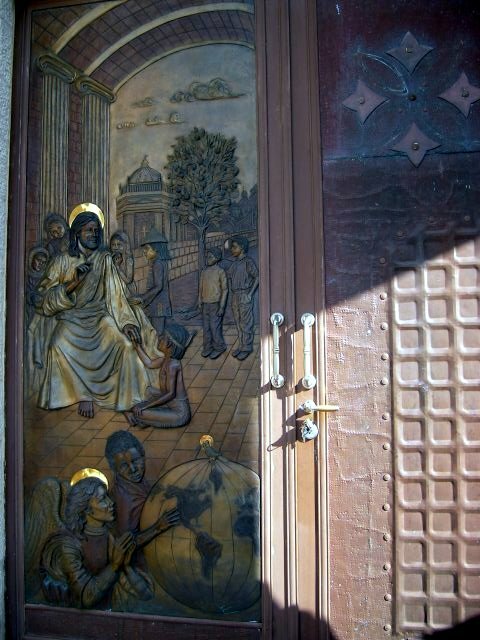 The church has partition which blocks people going to the holy place. It is their tradition. This is the replica of a typical first century tomb. They said that they have actors on the Easter morning, playing the resurrection scene from the Bible. 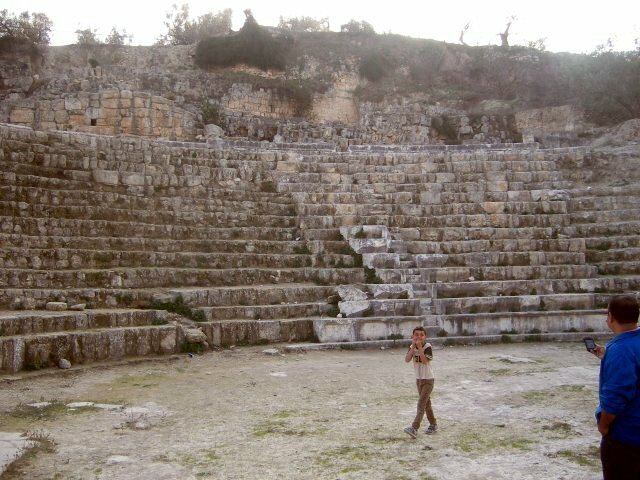 If I have another chance to be in the holy land and if it is during the Easter time, I would be good to come and watch the play. 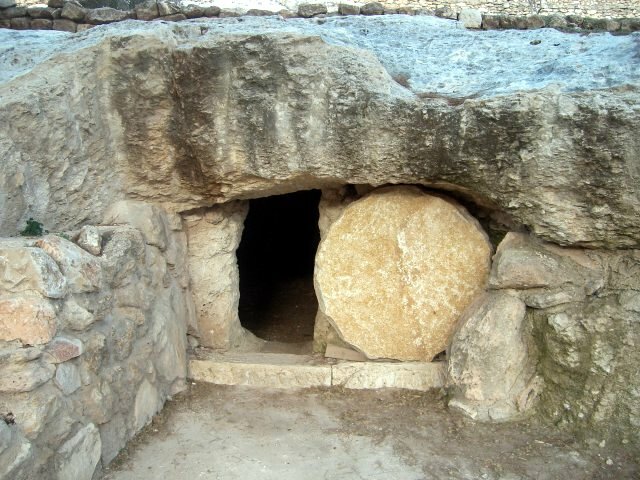 And this is small replica, so the actual door stone would be much bigger. 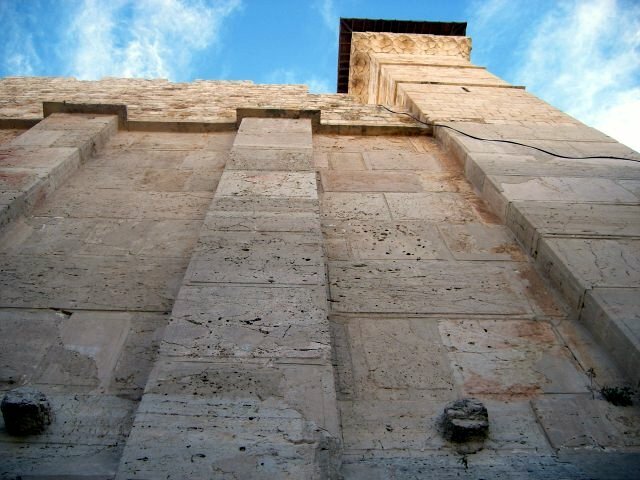 This is typical watch tower in the first century. This is an olive oil press and there is olive grinder next to it. 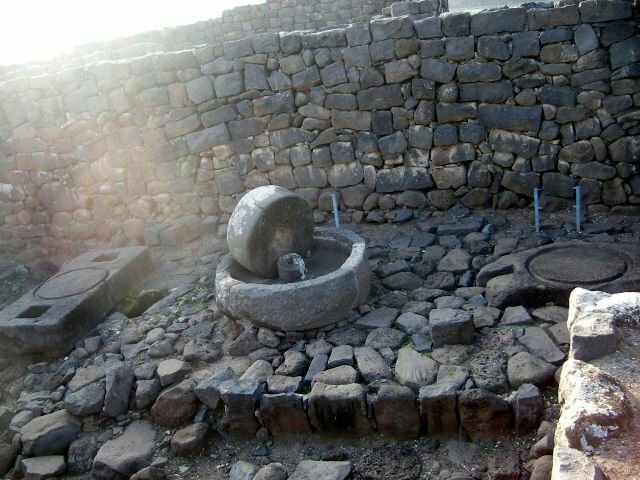 To grind the olive, they used a huge mill with heavy millstone. Usually donkey moved the millstone, but today I volunteered and moved it as if I am a donkey even wearing the yoke. They crushed all the pits because even pits contains oils. You can see three places to tie stones in the wooden arm of the press. They pressed three times, first with just one stone, then it makes best and purest oil sometimes called as virgin oil. 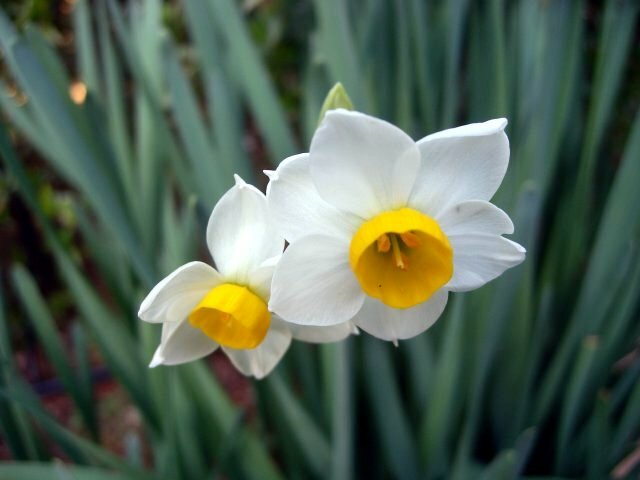 It is cleanest, and they donate them to the temple in Jerusalem. Second time, they use two stones to make not the best but still good oil and used it for human for every possible use. 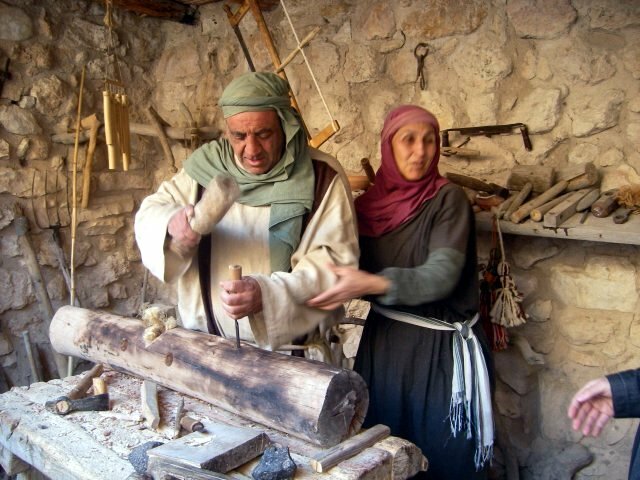 They pressed the olive with all three stones for the last time to make dirty and crude quality oil, not usable for human body but they used it as lamp oil. These people are dressed in first century Galilean. He acts as carpenter and showed us some first century skills. She also showed us how to make thread out of the sheep wool. Her name is Hannah. This is first century Jewish synagogue. Unlike the other later synagogue we’ve seen so far, it does not have the seat of Moses or the scroll place. 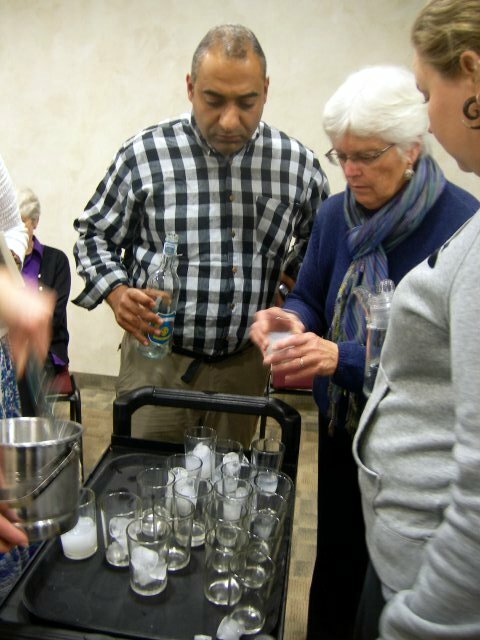 Daniel said that the synagogue literally means gathering, and served like that. People gathers, prayed, studied, talked kind of town centre. 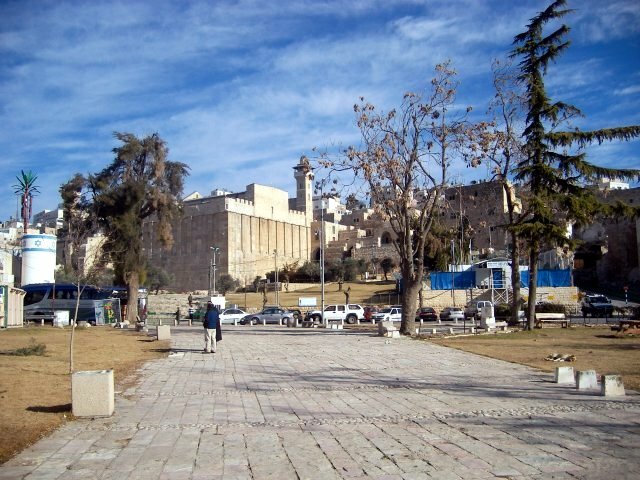 It was not religious centre until the destruction of the temple in Jerusalem. One think I like in the synagogue is the pillar on the corner. The other side of the pillar is 90 degree which makes the pillar heart shape. 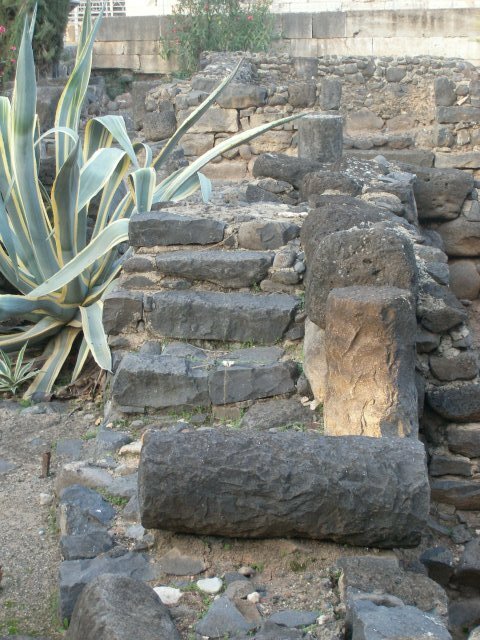 Not only here, I’ve found those pillars in many other synagogues on actual archaeological sites. 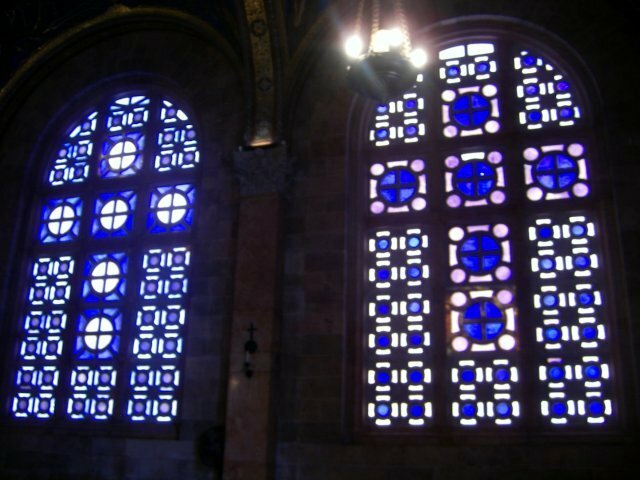 When Jesus or any other disciples including Paul went into a synagogue, they might have seen similar synagogues like this. 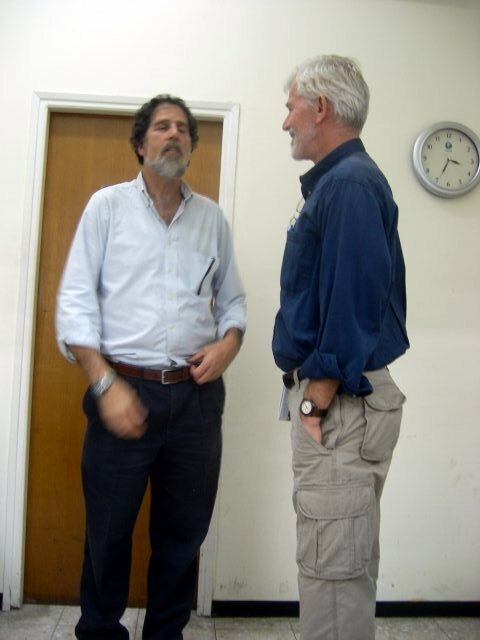 Daniel is kind of interesting person to me being a messianic Jew, believing in Jesus as messiah. George said there are many divisions in messianic Jews, and many of them does not think Jesus as God. Today was field study day without any speaker. We went to Hazor first. 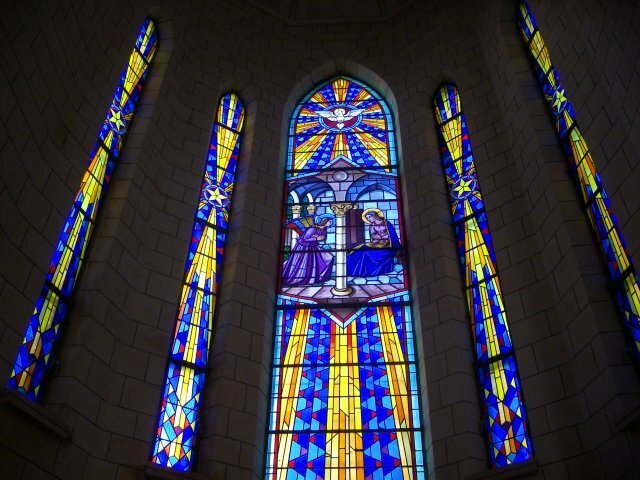 It is one of the strong fortress which Solomon built to strengthen his kingdom. Just as other ancient sites, it is also built upon older town, and it has twenty different layers. Among the layers, scholars found total black layer which means it was burnt totally. Not just a small fire, but total destruction. And the date matches with Joshua’s invasion. These are some of the remained burnt stones. They are very strong stone, but in the great fire, they broke like this. 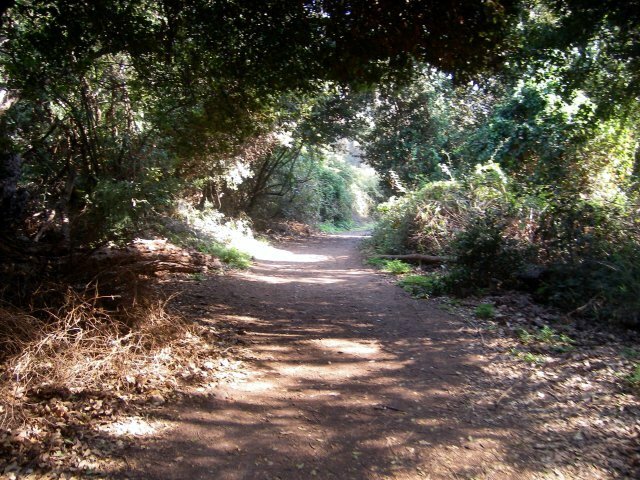 Then we had nice hiking through and along the trees and forest. 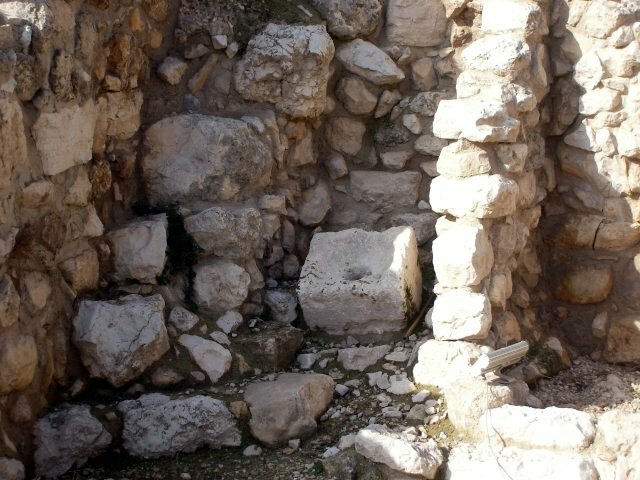 We found the altar and worshipping place built by Ahab, so that people in northern kingdom would not go to Jerusalem to worship God. The iron bars marks the actual size of original altar. It is so huge. And behind the altar, we can see the elevated site where Korean people from Hanaro Church sat. It is like Ziggurat and it is typical to be with the altar. Then we found a Israelite city gate, probably built by a Northern king. 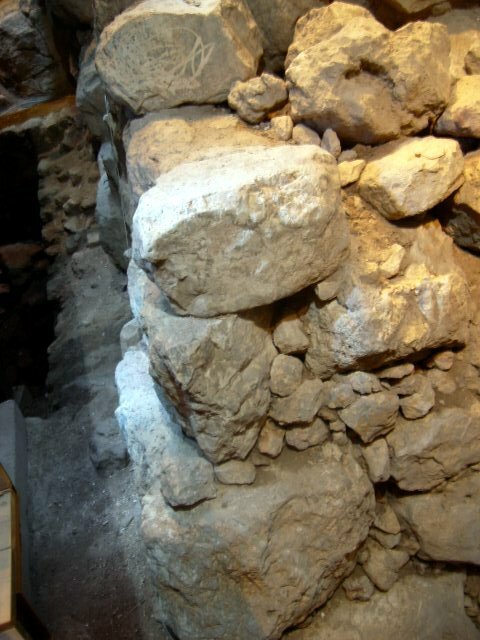 If we go around the Israelite gate, archaeologists found and dug Canaanite gate. 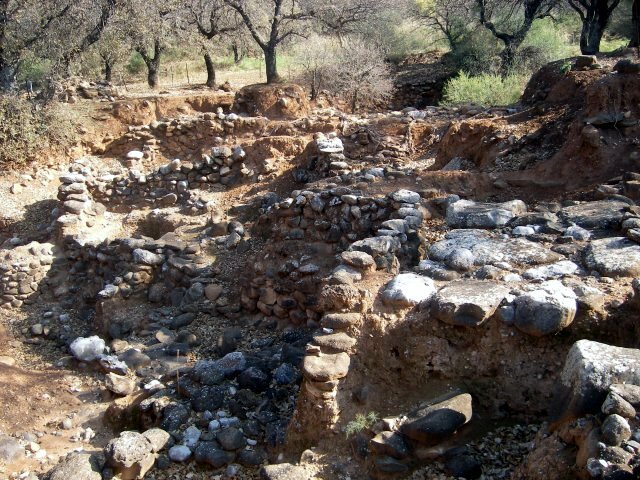 It is at least 1,000 years older than the previous Israelite gate. And possibly Abraham went through that gate. This is mount Hermon. 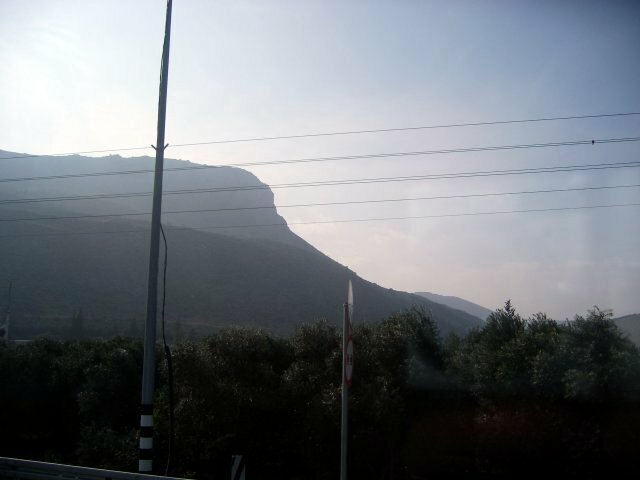 It is Psalm 133.3: “As the dew of Hermon, and as the dew that descended upon the mountains of Zion: for there the Lord commanded the blessing, even life for evermore.” And many people believes that this mountain is where Jesus transfigured himself. Then we went to Banyas. 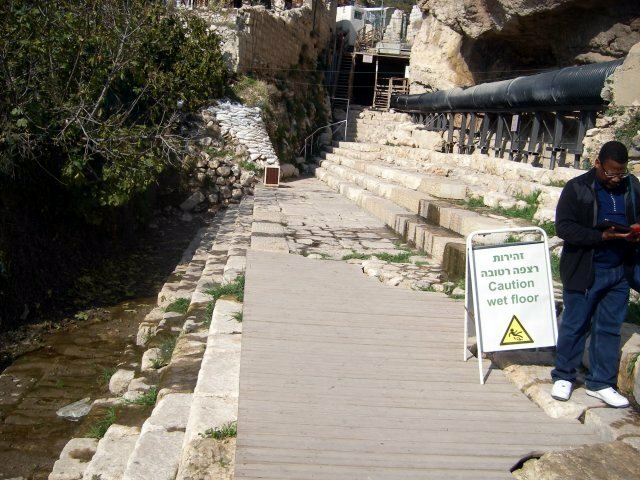 Its name in Jesus time was Caesarea Philippi, and is under the Mount Hermon (so-called Mount Transfiguration) in Golan Height. This is the temple of Zeus. There are many temples for Pan, sacred goat, and August of course. It is built by Herod. Wherever we go, we hear the name of Herod at least once a day. People began to go back to the bus, and I ran farther with D’Angelo and Eileen as far as we can run. 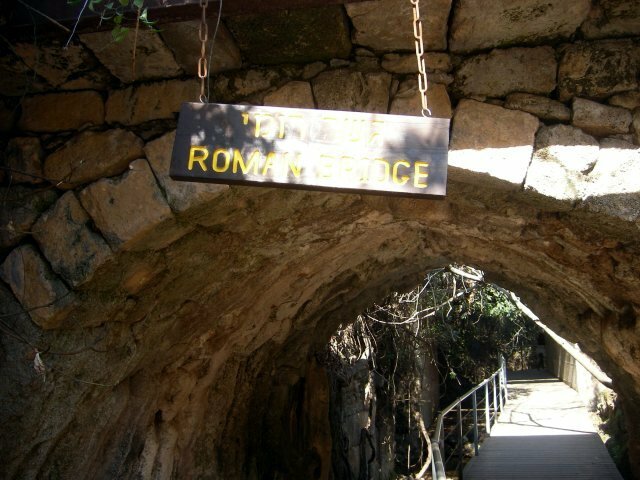 We saw more of the Herod’s structure, and saw this roman bridge. 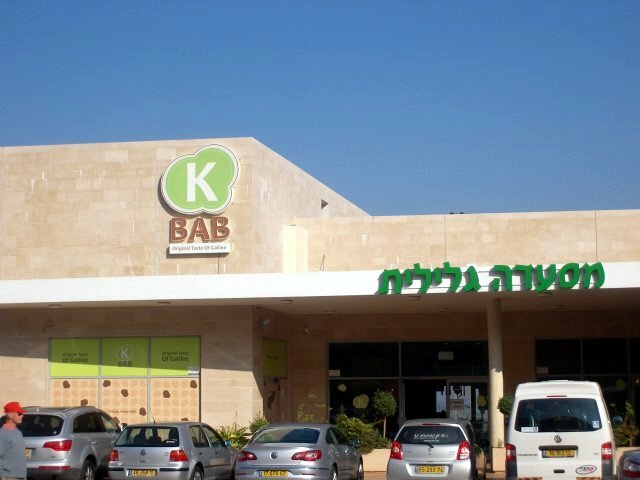 We stopped at a highway rest area and went in K Bab, “Original Taste of Galilee,” to find out it is one of the best restaurants we been to so far. Then we went to the church of the multiplication where Jesus blessed two fish and five loaves to feed five thousand men (without counting women and kids). 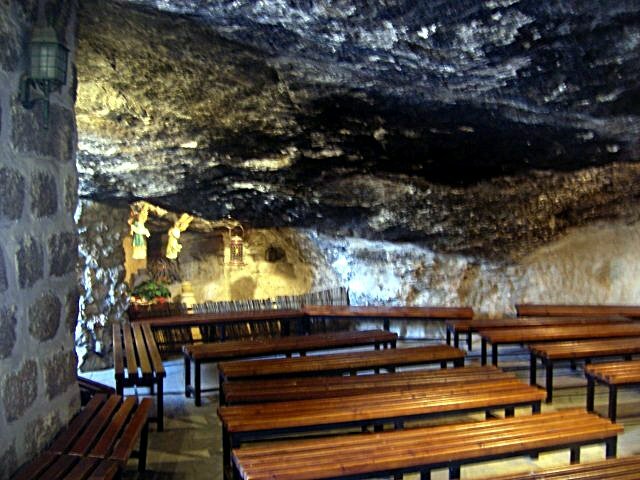 The church was built upon a rock which you can see under the table. And it is believed that Jesus put the loaves and fish on the rock to bless. This is ancient church built upon another church. 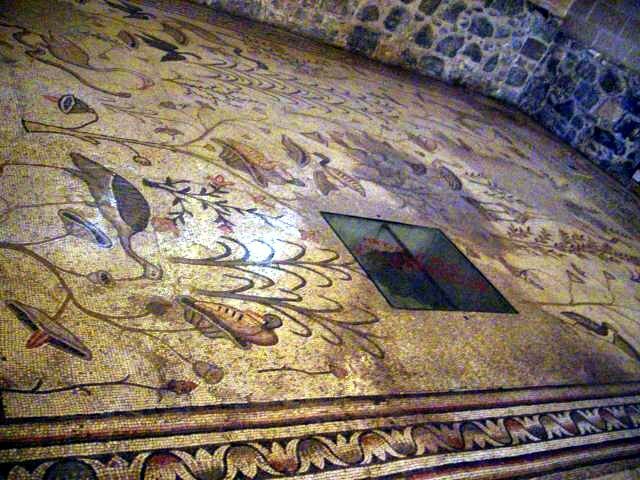 And we found some so beautiful floor mosaics even from 4th century. 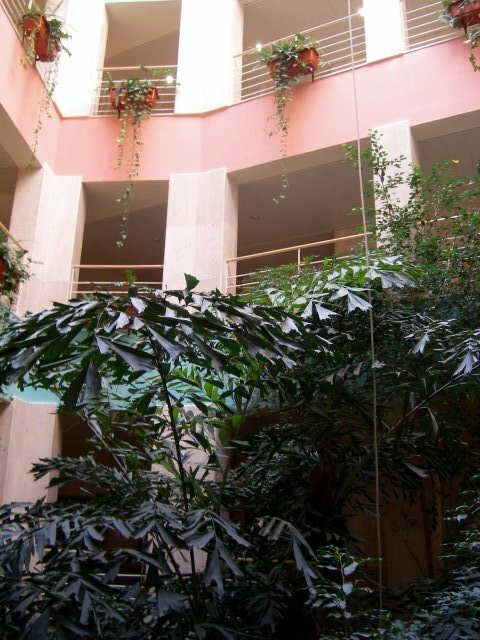 The courtyard was one of the best place to enjoy the peace and meditate. They have an olive tree in the centre, and running water with beautiful sound and lots of Koi fish. Koi is Japanese word for the fish, and at the same time, it means love, too. We found the famous Papyrus in the courtyard too, where the word ‘paper’ came from. 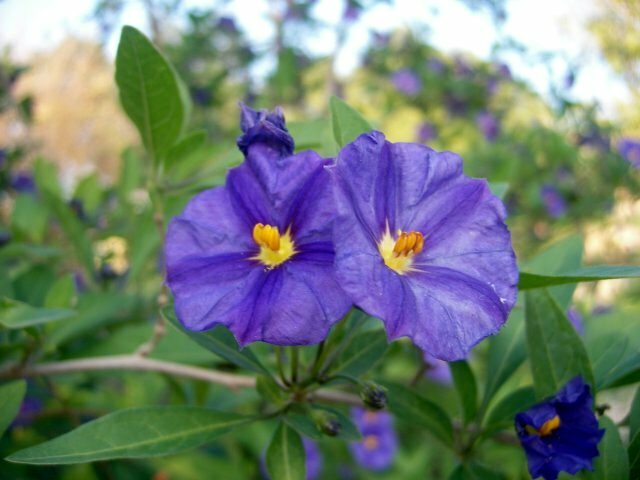 And my favourite – flowers. Today was certainly New Testament Day, and especially Gospel Day. 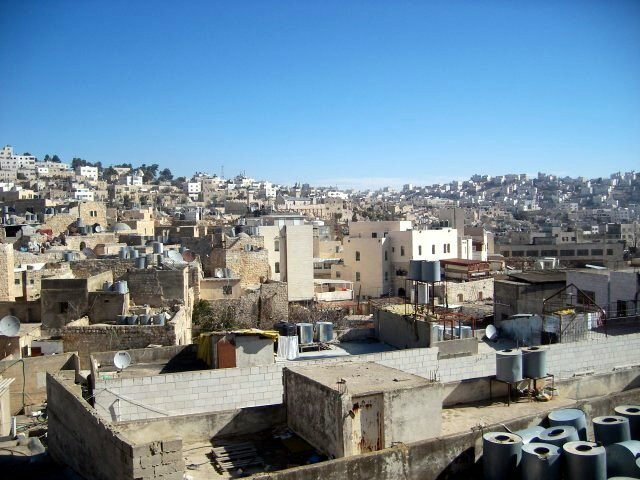 This is the Nazareth view from the hotel. It is quite foggy and could not see far down there. 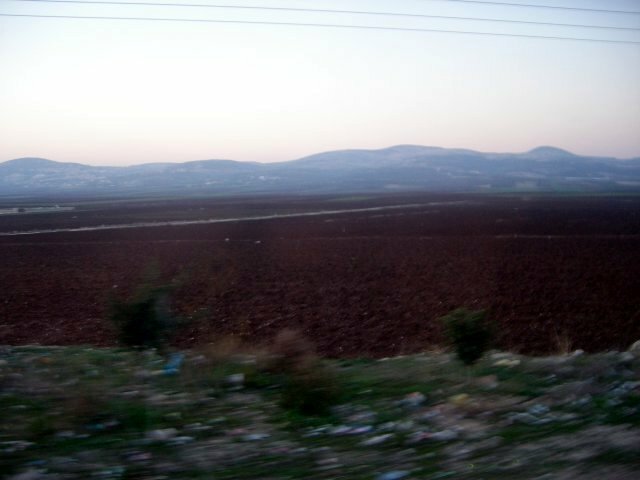 While we were driving down, our local guide identified us Cana where Jesus performed his very first miracle. He said wine is very precious gift because it means one years labour and huge portion of wealth. And if you do not provide enough wine in such events like wedding, it is permanent disgrace to the family. And how much it would be gossiped in that small town. Jesus literally saved the family. And George said that Jesus was not sitting with his mother in the feast because that is the Jewish tradition and culture that time. Even now they are separated in the synagogues. 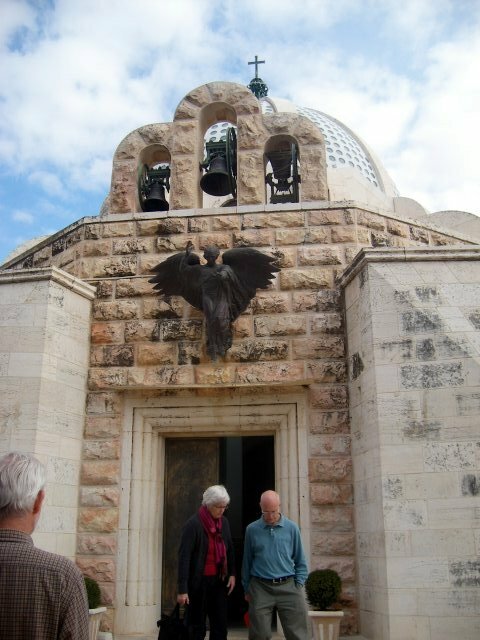 First destination was the Church of Beatitude where Jesus preached the famous sermon on the mountain. 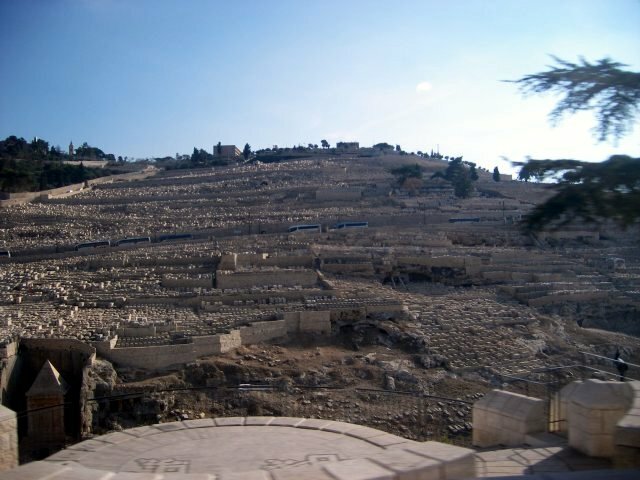 On Matthew text, Jesus was on the mountain top, and it begins with Jesus sitting down. In Jewish tradition, rabbi stands normally, but when he sits, that means he is serious about his on-coming speech. So when Jesus sat down, everyone must have been quiet. 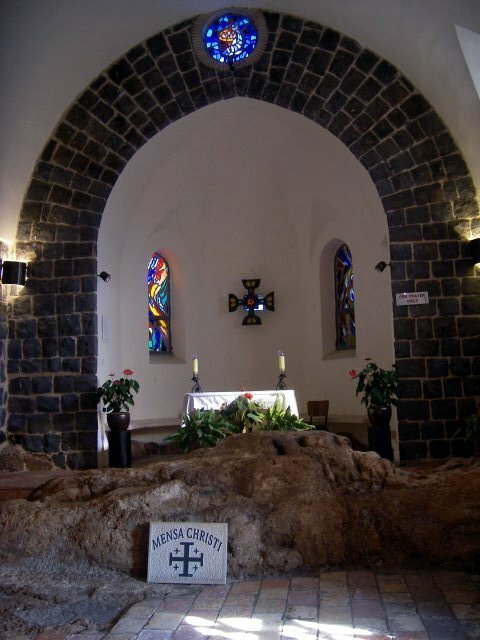 And a beautiful church was built upon the rock which is believed that Jesus preached on. They are my favourite professors at McCormick and they are husband and wife. Such a beautiful couple. 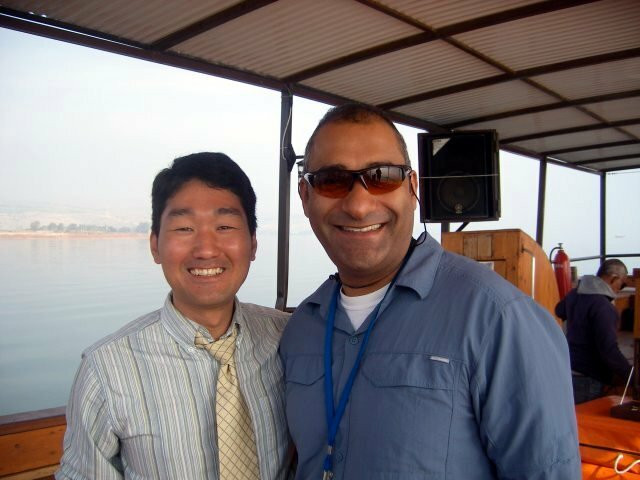 Then we went to Galilee and had worship on the “Jesus” boat. The service was good. We read Psalm 150 in different languages of English, Korean, Spanish, Hebrew and Arabic. Arabic was read by our local guide George. He is the best guide I’ve ever met. 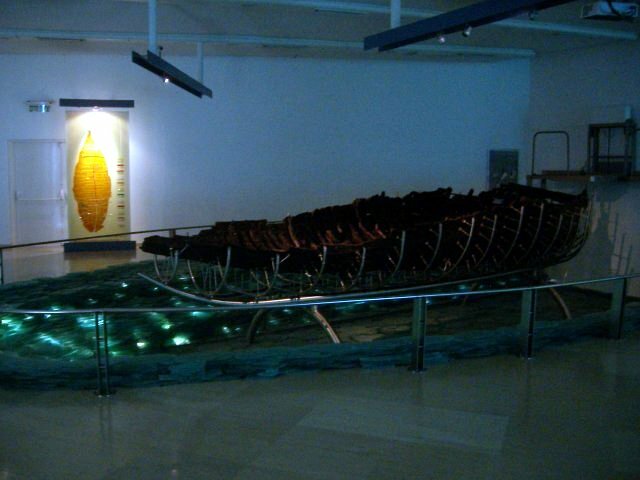 This boat was found under the mud in the Sea of Galilee and scientist concluded this boat is about 2,000 years old. At Jesus days, there must have been so many boats on Galilee, and this is one of them. There is also possibility that Jesus was on this boat at least once. And the boat is made out of twelve different trees. 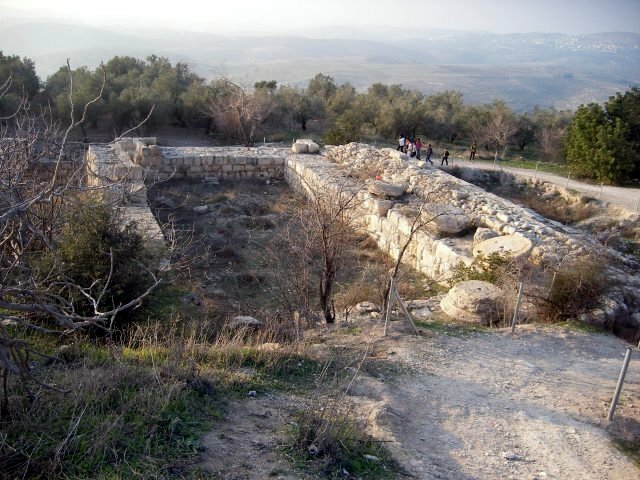 This is archaeological site of ancient Migdal. And there is huge construction is going on to build a Magdalene Centre and resort. 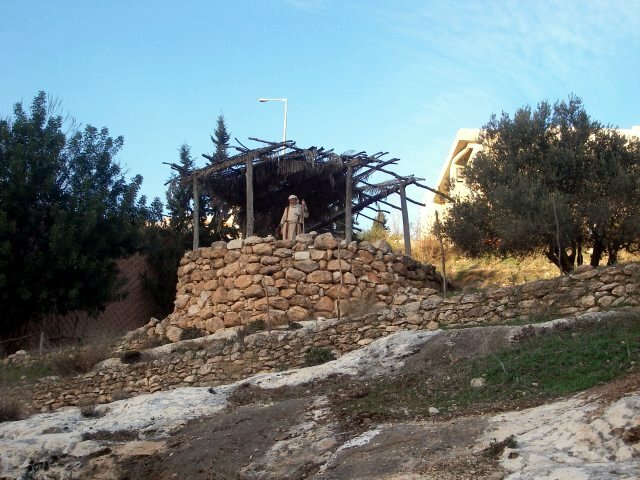 Our famous Mary Magdalene means Mary from the town of Migdal. 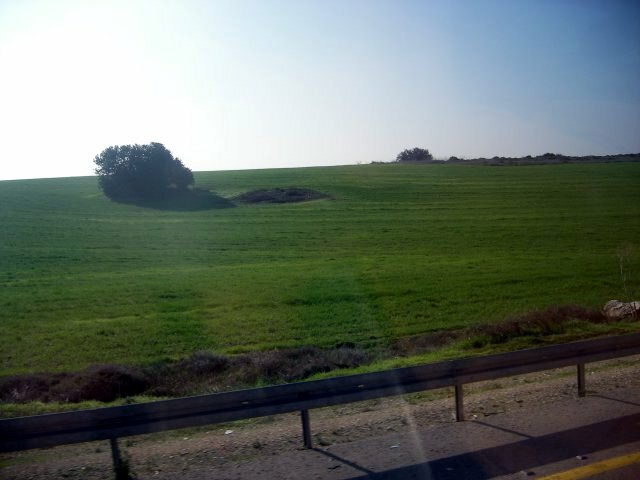 Galilee area is the core place of Jesus ministry. We had lunch here. I forgot the name of this mountain. 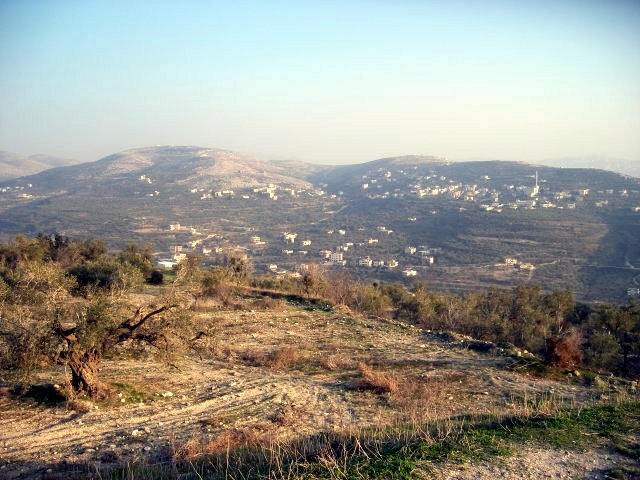 Our local guide said that there was rebel against Herod among Jewish people around here, and they fled to that mountain. 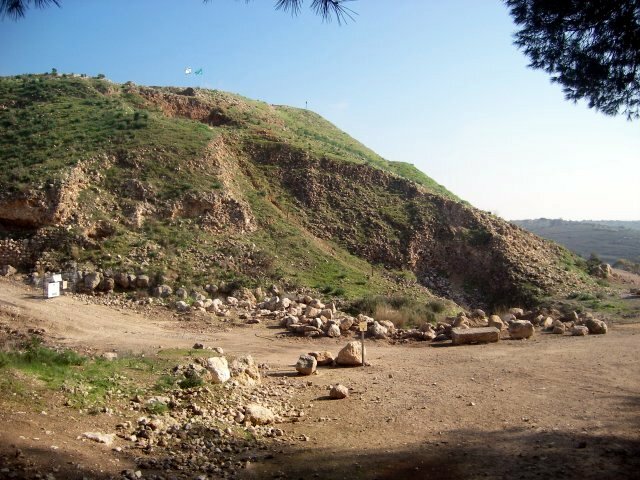 And Herod commanded his solders to push and throw all the rebels off the cliff. And the people in Galilee saw that. And we went to Peter’s Primacy Church. Peter and his fellow disciples came here and were fishing after the death of Jesus. And Jesus came here and prepared the fire and meal. Then John found the Lord and told Peter. After that Jesus asked Peter if he loves him three times. This is the Church built to commemorate it. This area is known as Heptapegon which means seven springs in Greek. We did not have time to go for it, but I ran and found one of the seven springs. Then we went to ancient Chorazin, one of the three towns Jesus cursed. This is small town, and the people here must have been more conservative, and relatively closed-minded stuck in tradition and religion. That is why Jesus came here and worked so hard to change them. 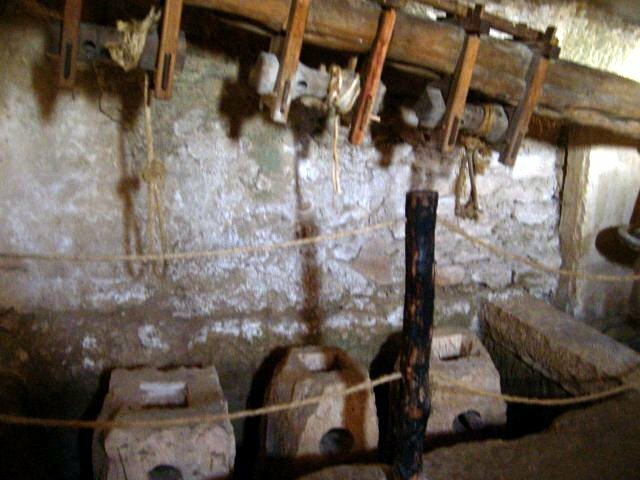 This is ancient olive oil press. This is Peter’s house in the town of Capernaum. 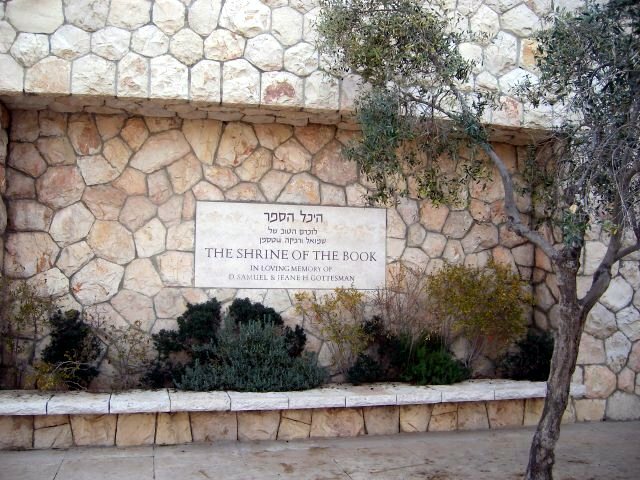 Many of the holy places are just to commemorate and/or the actual locations are in dispute. But this one is 100% legitimate, without any dispute. That means Jesus actually ate, slept, rested, preached, healed and talked there. It is most probable that Jesus walked through the whole town. And there is Jewish synagogue during Jesus time. Jesus went, read scripture and taught there. This is the house next to Peter’s and you can see the stairway to the roof. In Gospel, good friends carried their paralysed friend to the roof and lowered him down. This is how. And the roof is usually covered with just leaves and straws woods. 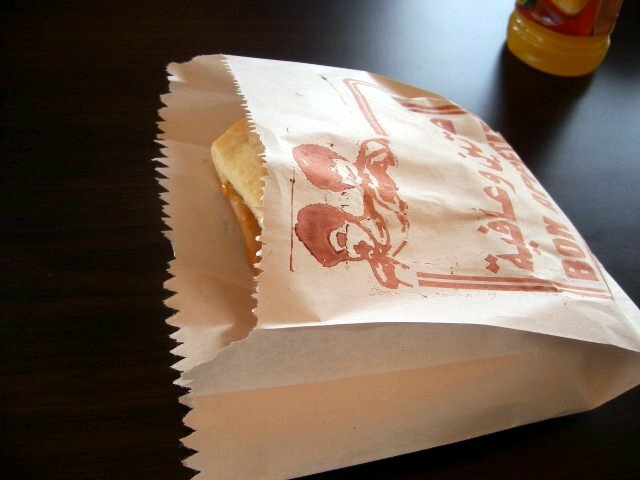 So it is easy to open. This is beautiful sunset. And my crude camera cannot contain the beauty of it. Today we moved from Bethlehem to Nazareth. 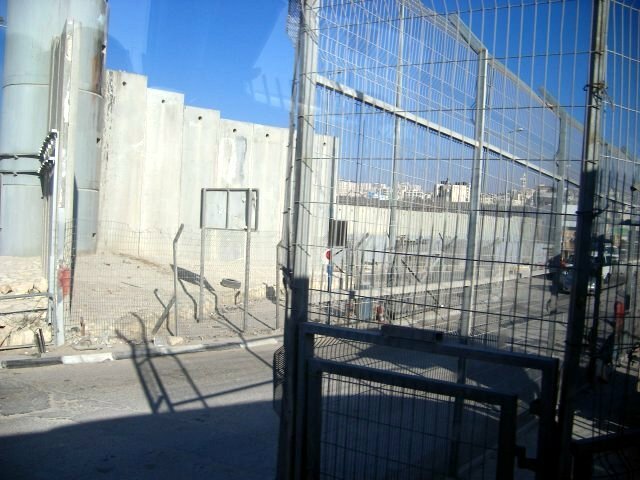 We had to go through the checkpoint because we were going out into Palestinian area. These checkpoints are horrible. But the worst is yet to come. 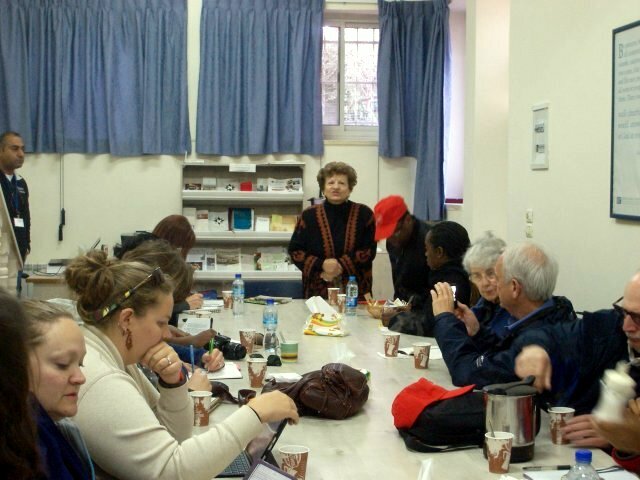 We went to Ramallah to meet Mrs. Jean Zaru. 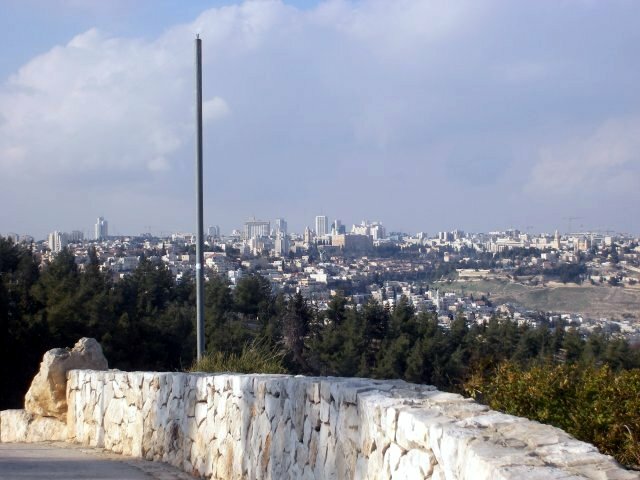 Ramallah is founded by Christians, and still Christians are dominant. And it is rule that the mayor must be Christians from the old days. 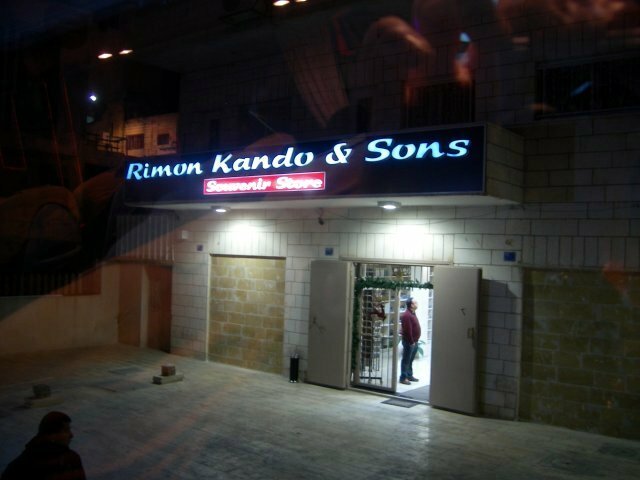 Ramallah also has many industrial and commercial businesses. 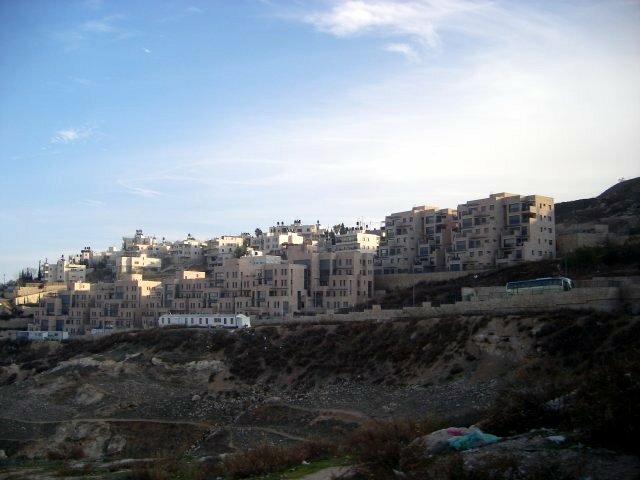 Ramallah also works as the de facto capital of Palestine. 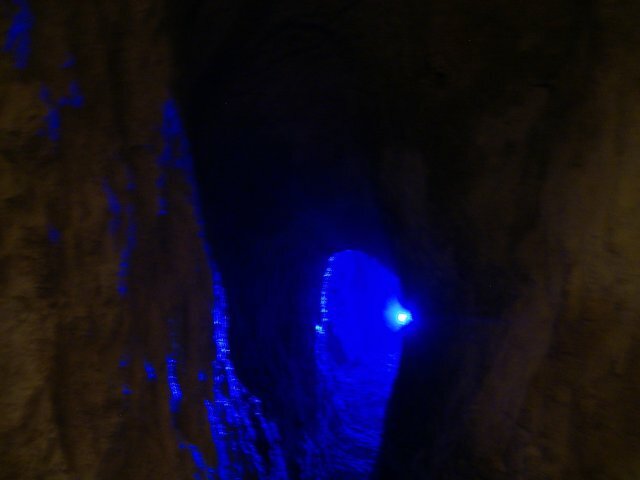 It is not one of the tourist attraction, so people there gave us very curious eyes. Ram means high place and Allah is God. So Ramallah is Divine Heights. Mrs. Jean Zaru is a Quaker. She is very active for the human rights of Palestinians, and also for the Palestinian women. In that way, she is kind of unique. People we met so far work for the general Palestinian, none for the specifically women. But as we all know, women tend to be weaker in many ways including physically and sexually. Consequently if women are exposed to same level of violence as men, they are way more vulnerable. And that is way we need to protect and help them more. Some people believe providing numerically same thing is fair, but I do not. Providing different things so that everybody can live equally is fair and that is my social justice. I would like to write about it later. When we passed by on the bus, our local guide George identified us many different places. This one is land of Gibeon. It comes in Joshua 9. The people here deceived Joshua as if they were from the land of far far away. This is Bethel. Bethel means house of God, and the story comes in Genesis when Jacob fled from his brother, he slept here and saw a ladder or stairway reaching to the heaven and the angels up and down. 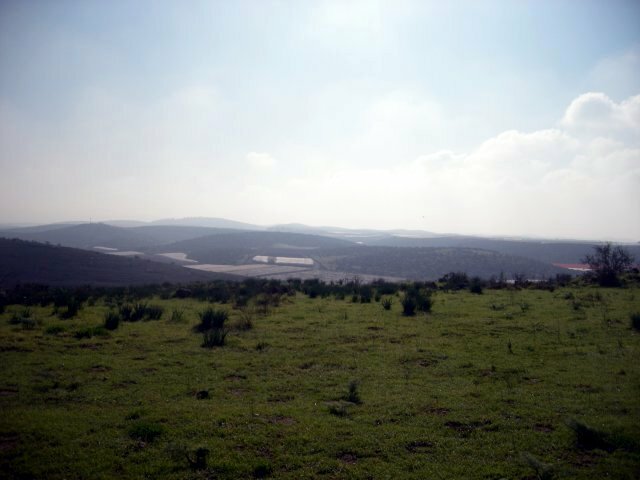 This is Shiloh where Samuel stayed and ordained two first kings; Saul and David. And most importantly this is where the ark of covenant stayed. Shiloh means ‘his’ in Hebrew, and was dedicated place to God. 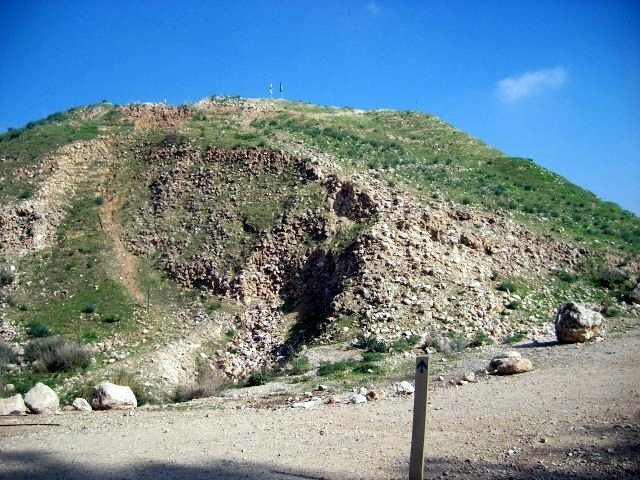 This is two mountains of Blessing (on the left) and Cursing (on the right) which Joshua summoned and arrayed people there and asked them to choose which God they would serve. This is in the land of Shechem. 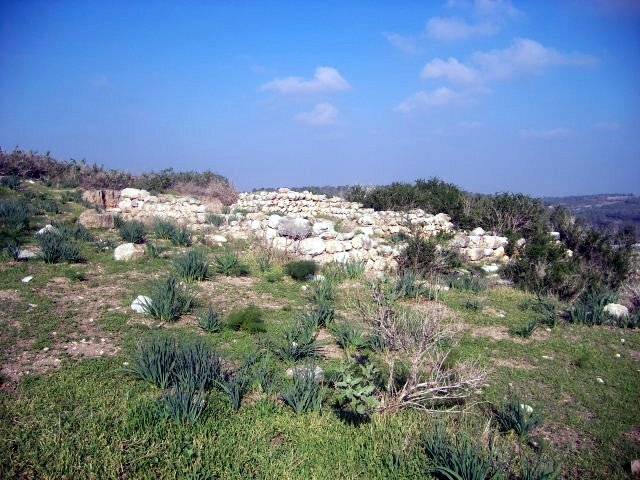 Ancient or Biblical Shechem is now called Nablus. 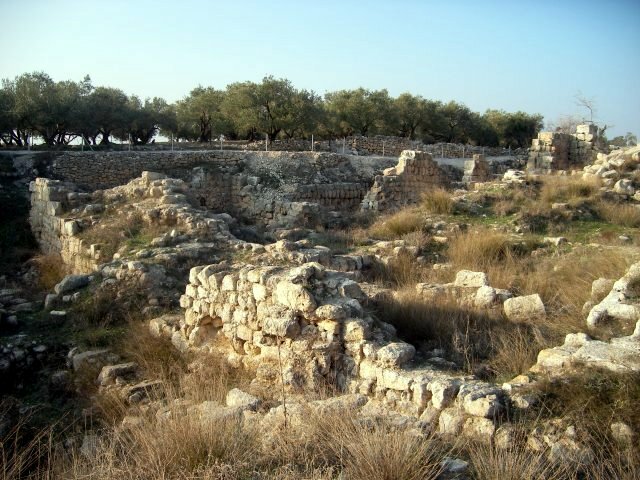 Romans built this city at A.D. 70 after they conquered Jerusalem and named it Neopolice, new city. 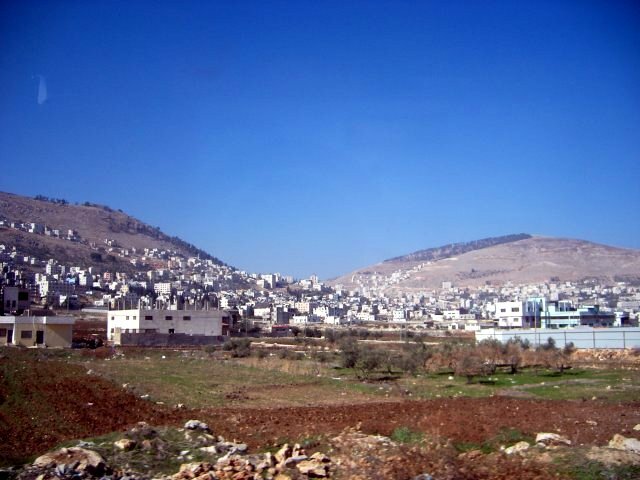 And the name became Nablus. In the place where the Jacob’s well is, there is a Greek Orthodox Church and is so beautiful. Under the Church, we found the Jacob’s well. And just in case you may not know, the photo-shooting is forbidden. And again, our McCormick group got special permit again. I think God is really with us. I drew some water myself and tasted. It was good and I was amazed the well is functioning well even after 4,000 years of time. 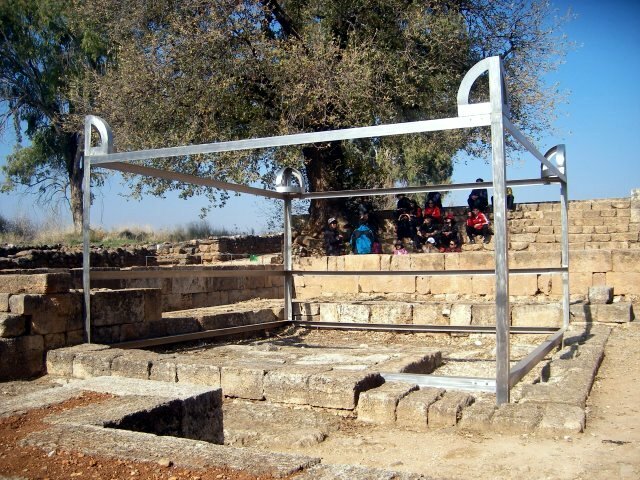 As you may know this is the well that Jesus met a Samaritan woman and talked. Then we went to Joseph’s tomb. 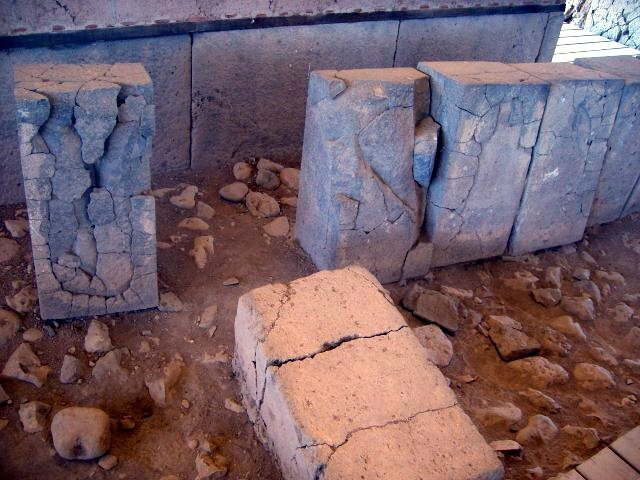 There is no archaeological evidence on this as usual for holy places. But it is said by tradition. 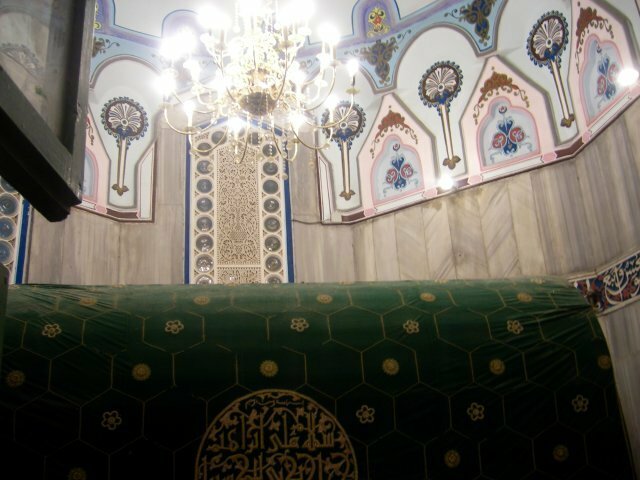 And the tomb itself is covered with nice stone, and nobody knows what is in there. 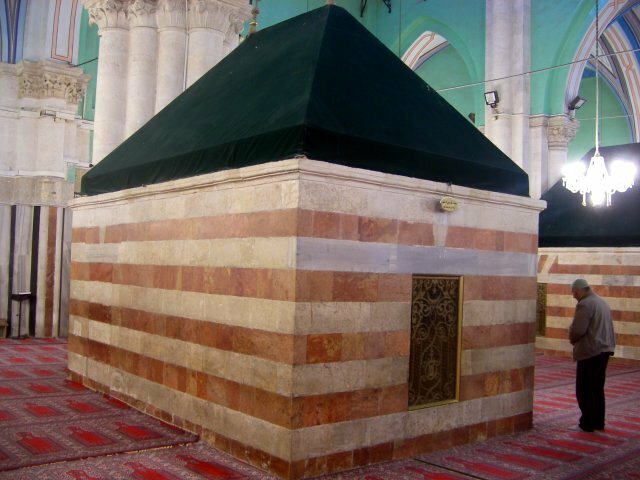 The stone is supposedly built by Muslims because its direction is toward Mecca. 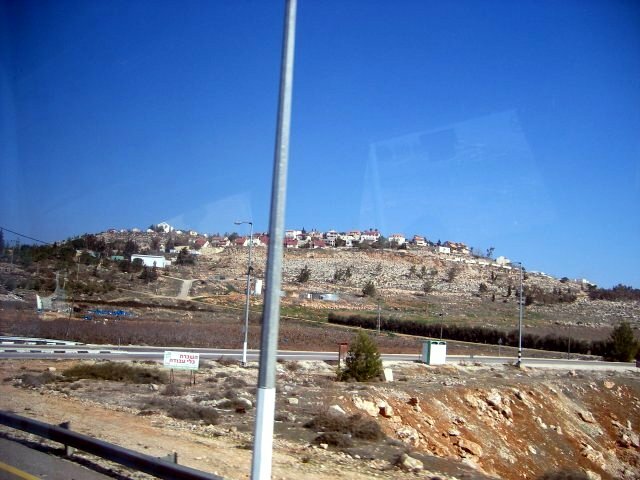 Then we drove to Samaria, the capital city of Northern Kingdom of Israel. The original capital was another place, but the famous evil king Omri moved the capital to Samaria, and Ahab also reigned here. Our group had lunch there but I skipped the lunch and walked around the village. And I sat there and thought watching the mountains around: Some place are identified and marked as holy, and some not. Why and what makes the difference? The holy rock does not made up of some holy molecule. I think that is holy because someone did some holy action. We people makes some place holy or evil. Our action and our deed is most important thing. 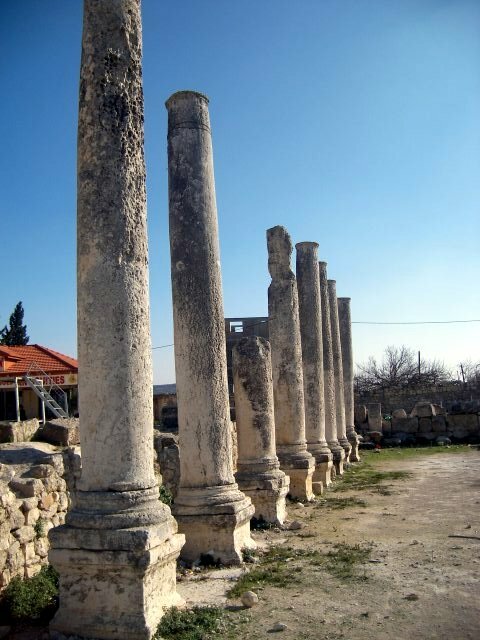 Herod the great built a roman city in Samaria and named it sebaste – August in Greek. 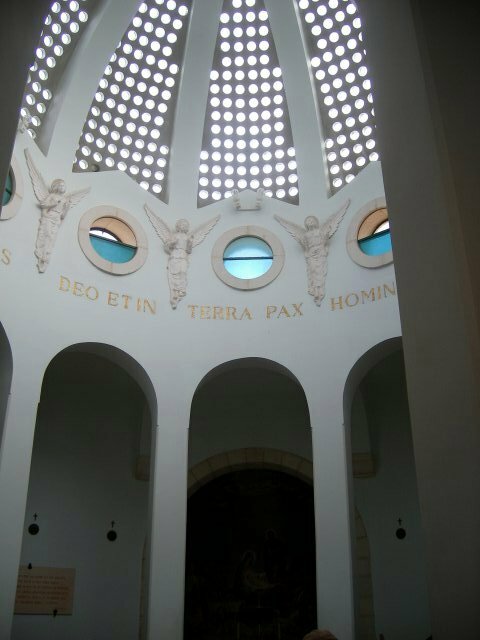 This is roman style Basilica where people gathers and do some business. This is theatre. 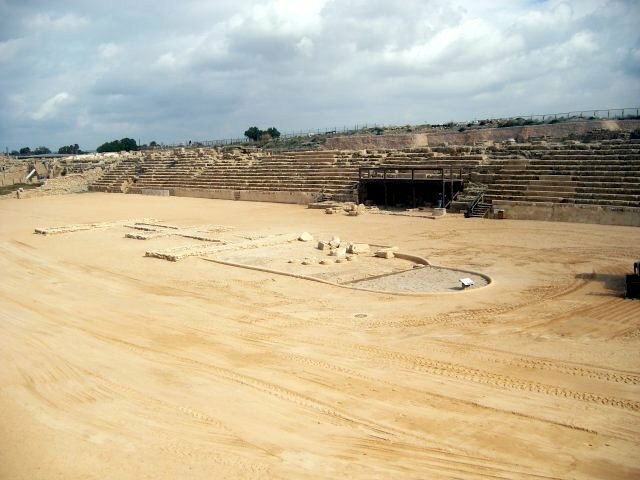 And there is ancient horse racing track built again by Herod (not in this photo). The track is now just a flat field. 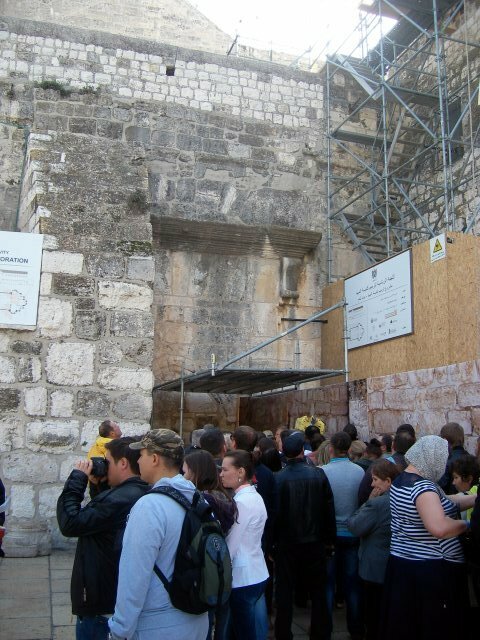 By tradition, it is believed that John the Baptist’s head is buried here, and crusaders built a Church for him. 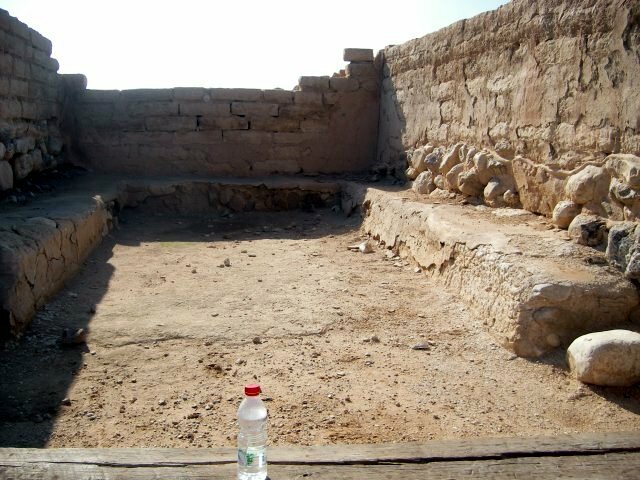 This is part of the Palace where the evil kings of Omri and Ahab lived. We went to the top of Samaria so that we can have some nice view. According to a boy from the village, we can even see the Mediterranean sea on clear days. In biblical times, all and every important place is always the highest point in the whole area. This is the August temple which Herod built to flatter August, the roman emperor. August is a god, and a son of god (which is Caesar). 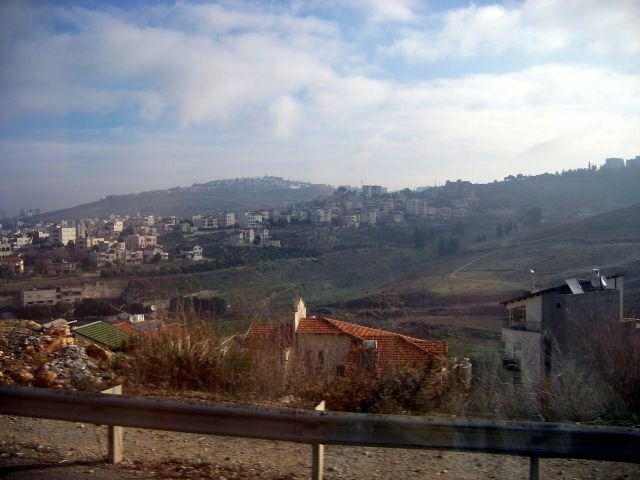 After the Samaria, we moved to Nazareth. And at some point, our local guide said that we are running on the same road where Jesus met ten lepers. 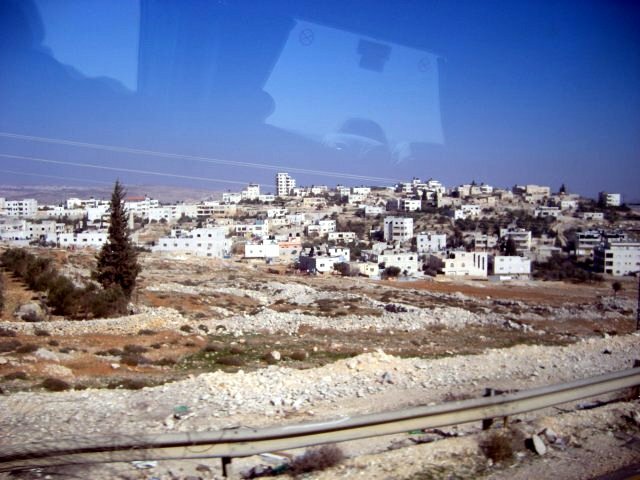 Until now we were in the West Bank, and Nazareth is in Israeli land. 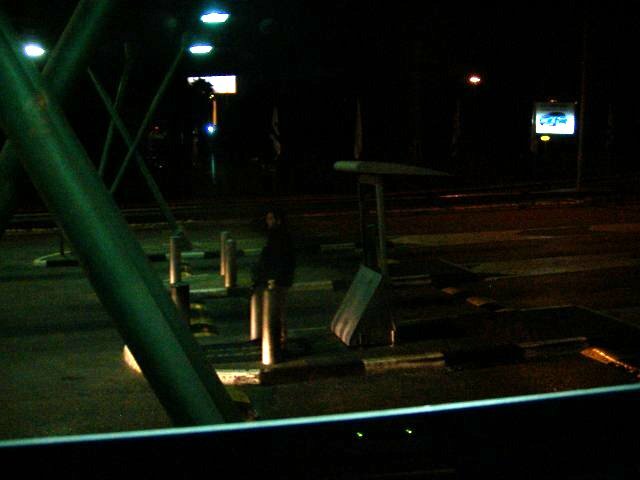 And there is a checkpoint (we may say it border). And it was horrible experience waiting and stuck in the traffic. And when we got there finally, three soldiers with machine guns came up on the bus. They asked our local guide and Ted many questions in separate place. And they also checked everybody’s passport with actual face. They were not that kind, but I believe it was their maximum kindness. They would act way more horribly to Palestinians. I am glad that I experienced this at least once and I cannot imagine the lives of Palestinians who go through this everyday and even twice a day. Today was another lecture day. 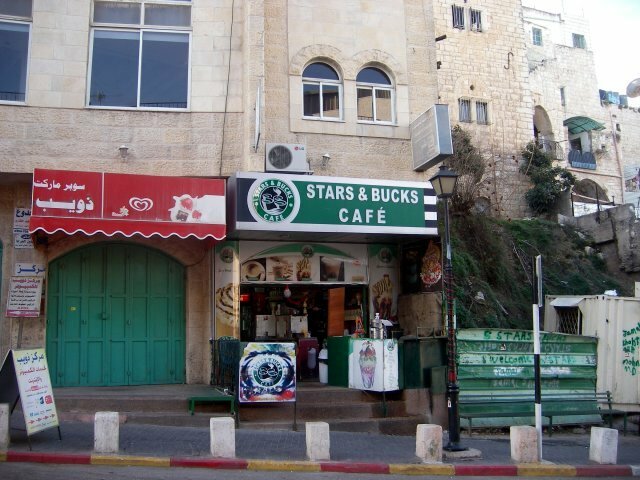 We walked to the Nativity Church from the bus terminal, and I thought I found on the way ‘Starbucks.’ But it was not. 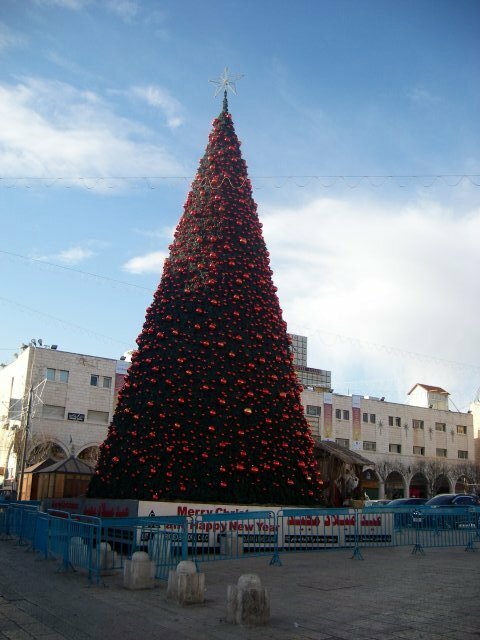 In front of, or between the Bethlehem Peace Centre and the Nativity Church, there was a huge Christmas tree. I wonder if it lights up at night. I saw so many tourists here from all over the world; I could recognise some of their languages such as Chinese, Korean, English, French, Spanish. And there were more languages that I could not recognise. I just thought how much Jesus has been contributing to local economy just by being born here. This is the Church of Nativity, basically built by Helena, the mother of Constantine the Great (Personally, I don’t like ‘the Great’ part). 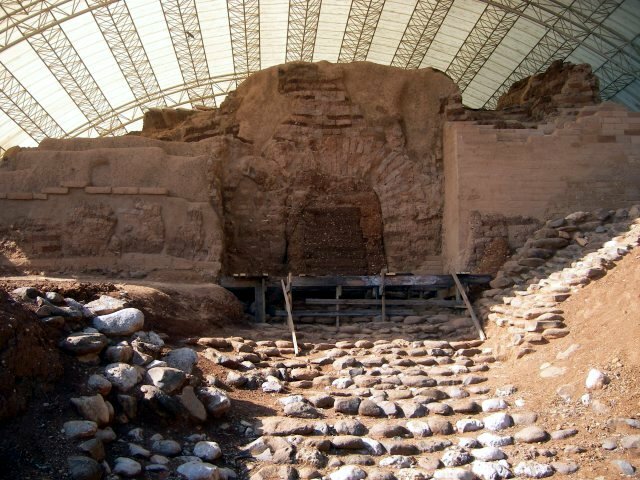 Helena built this Church, and later Persians came and destroyed all the Churches over 95% of them. 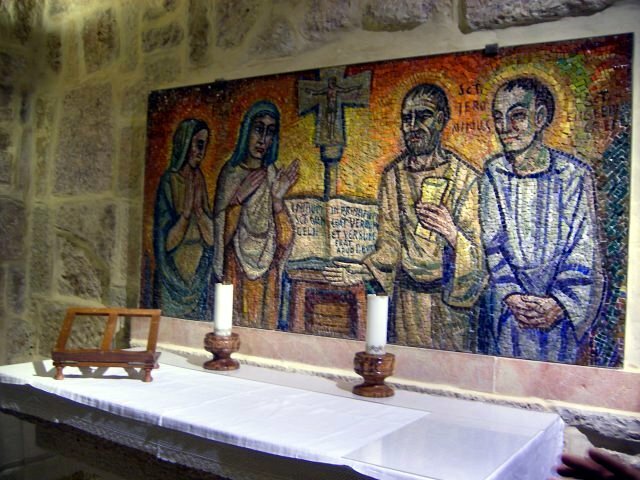 When they came to this Church, they saw a paining – three magi offering to Baby Jesus. And the magi were dressed as typical Persians. And the army thought, ‘Wait a minute… this building must have something to do with our ancestors.’ And they left it. This story reminds me how cultural diversity is important. If you see the three pictures, you can see the original huge gate at first picture. And then little bit smaller but still cargos can go in and out. Last one is current door and is low so that everyone bows down whenever they go in and to be humble. 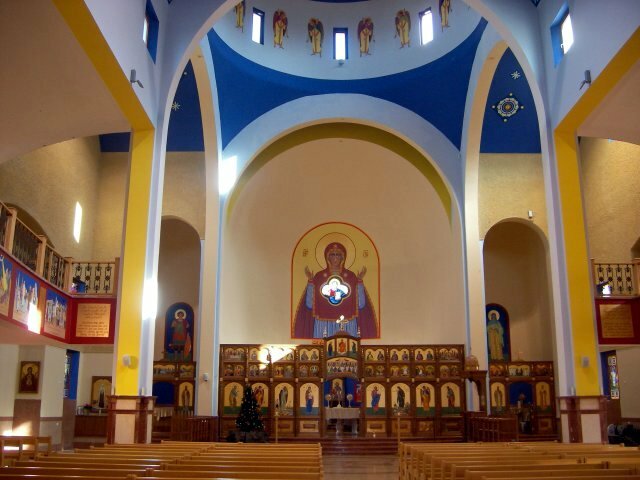 The original place built by Helena and repaired by Crusaders is owned by Greek Orthodox. And next to it, Catholic Church is attached. 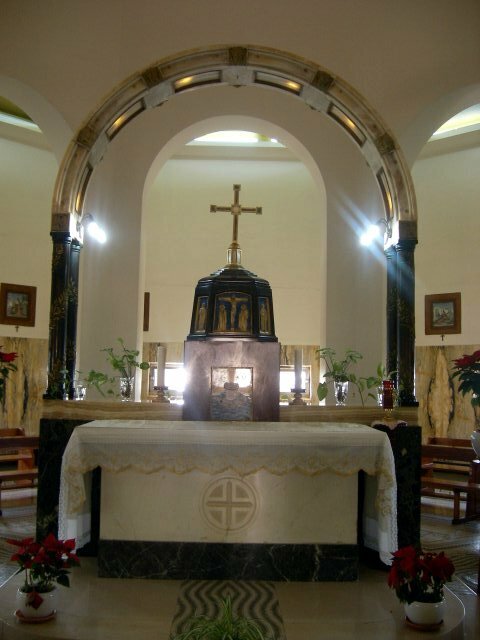 Catholic Church is of course commemorate the birth place of Jesus. But they also has another purpose – Jerome. If you go down to the basement, you can see the rooms where Jerome stayed and worked. In the picture, Left two persons are Paula and her daughter, the helper of Jerome. Jerome is the only Church Father who studied Hebrew in order to translate the Bible into Latin. And to help him, Paula and her daughter also learned Hebrew and Greek, and eventually they became or fluent in both language than Jerome. This is one of the refugee camp. The key on top of it means the key to going back home. On the wall, there are lots of graffiti. And the streets are so dirty with overflowing garbage. On the wall, along with other graffiti, I found John 3:16 in Korean. It struck my head. Yes, God loves them so much. God loves these persecuted people so much so that He sent his only Son so that they can live. There is Lajee Centre. I don’t know what exactly is this, but they have a library for children (where we were sitting), and computer lab, and a few more. Surprisingly, they have whole volume of American history. They are surrounded by separation wall. Out of the wall used to be their farming field, and work place. But they most of them lost their job. 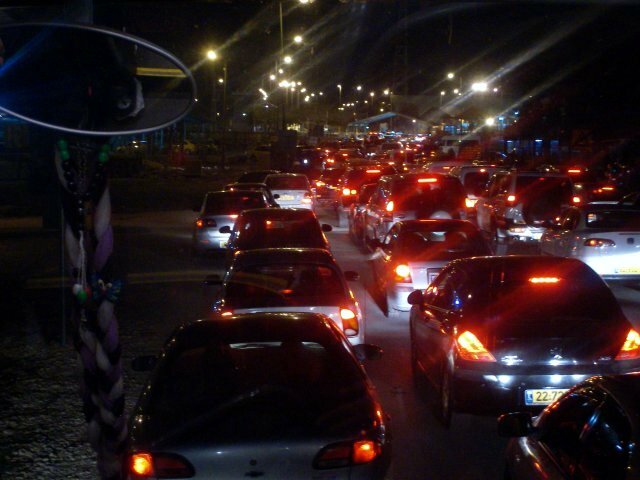 To Jerusalem it used to take 10-15 minutes and now it takes more than 2 hours thanks to the Israeli checkpoint. We went to Bethlehem university. It has beautiful buildings. 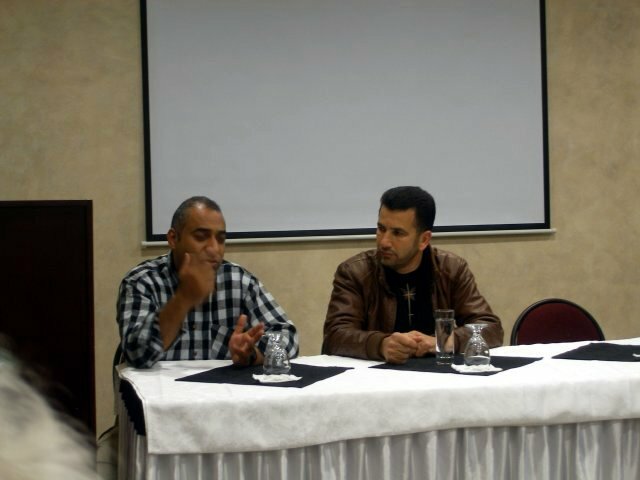 Dr. Mazin Qumsiyeh spoke about his perspective of Palestine’s future and history. Interestingly, he is biologist and biology professor. He said if American government moves in the right way, the illegal occupation of Israel would end within two weeks. Well, that might be true since US government give about 2 million dollars to Israel every single day. But the thing is American politicians cannot live without the money from the Jewish lobbyists. And if Obama calls Israel to stop it, he may not be a president the next day. After lunch where we had before on the day of Shepherds’ field, we came back to school for another session. Mr. Raffoul Rofa is a lawyer, working at St. Yves, a Catholic centre for human rights where 20 staffs working including 8 lawyers. They’ve been working for people with family reunion issues and house demolitions, and the likes. For house demolitions, they’ve got only one permit so far for fifteen years with thousands cases. And even the one was a school building built by US Aid. US Aid pressured the US federal government, and US government told Israel government. This is why they’ve got permit not because they fought in the court. And then we had some time in the souvenir shop. I also bought something. Today was kind of lecture day. We had three speakers in a day: one from religious Jewish, one from Christian group, and another from Muslim Imam. 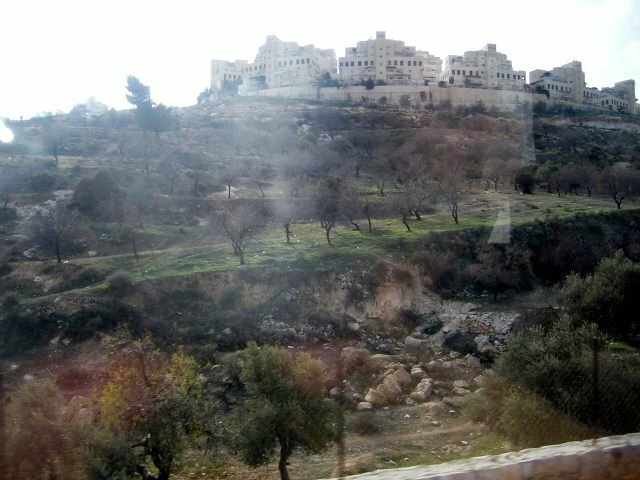 When I’ve got up in the morning, I went out to the balcony and took this picture – the Bethlehem from the hotel. And we went to Machbelah in Hebron. 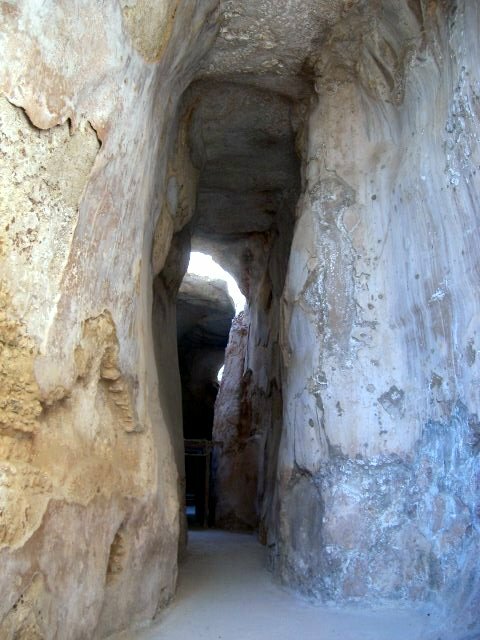 Machbelah is the burial cave originally Abraham bought for his wife Sarah. 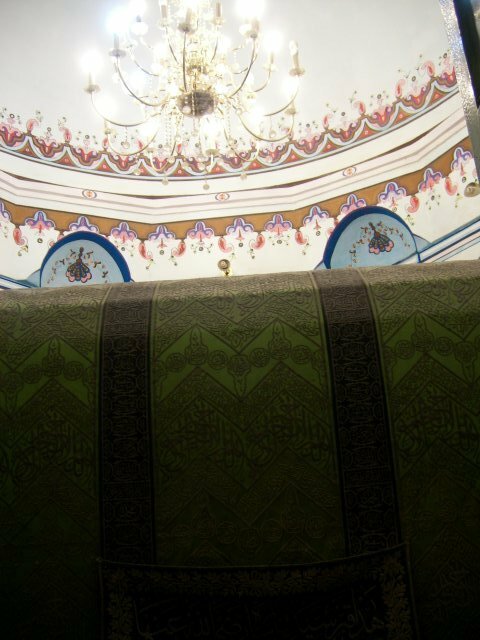 All the most important three generations of Patriarchs with their wives are buried here (by tradition). The only exception is Rachael as you know from the Bible. 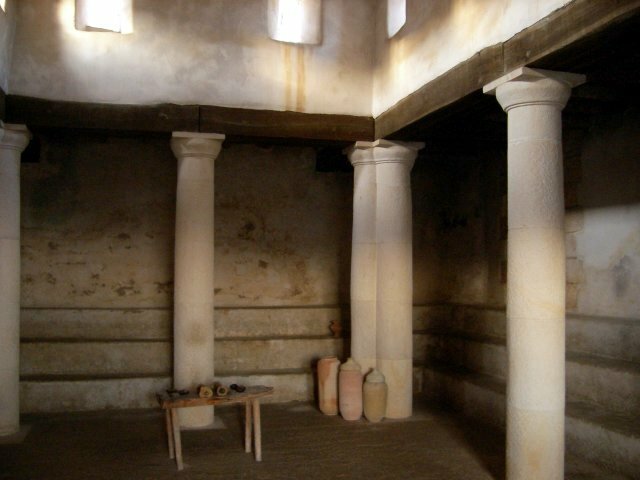 This tomb building is built by Herod. Even though Herod is cruel and did many bad things, there are so many things he left. The stone are recognised by its distinctive frame pattern. The upper part is built by Mamluk. 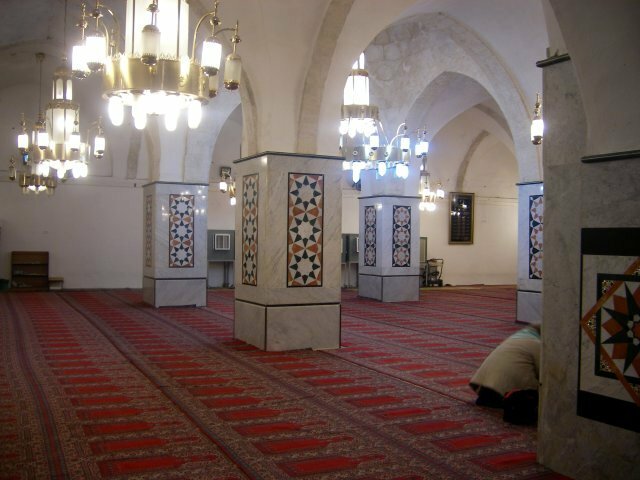 This site is fourth most holy place for Muslims, and before Israeli government came, it was of course Muslim’s. 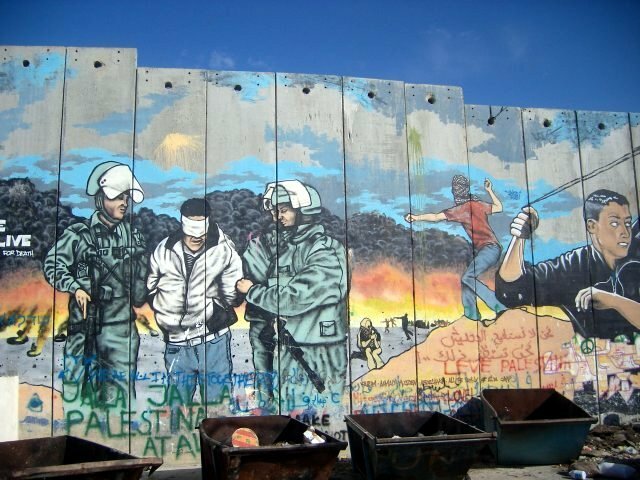 When Israeli army came, they divided it into two sections; one for Muslim, and the other for Jewish. This is muslim side mosque. Just like other mosques, this one is so beautiful too. About the division, Abraham and Sarah are shared by both sides. They both can see it only though the caged windows. Muslims have Isaac and his wife Rebecca. Jews have Jacob and his wife Leah. Jews got what really matters to them because Jacob is the top common ancestor and is exclusive to them. But for the Muslims, Isaac is not the most important person, but Ishmael. As I already wrote in previous posting, you will know where is the direction towards mecca in any mosque. 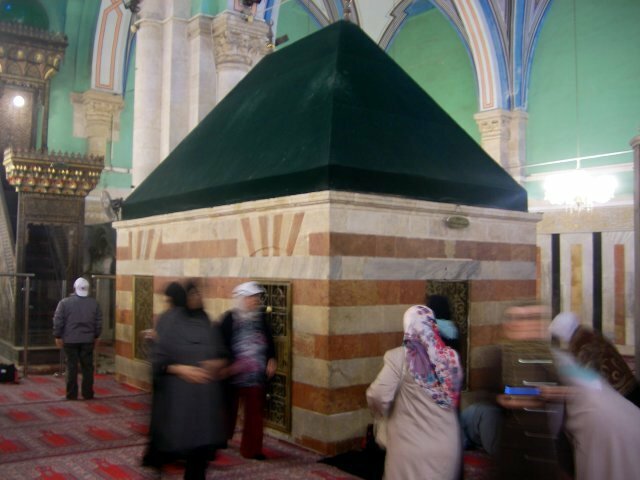 When you go into the muslim side of the Machbelah, the very first you would see is Sarah. 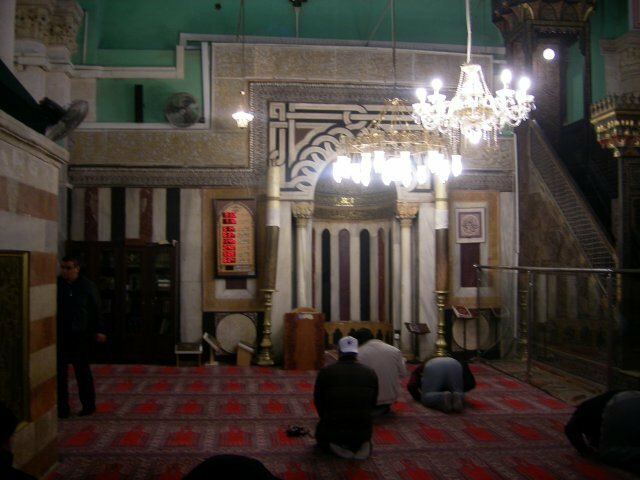 Then inside the mosque, you can see the Rebecca next. Isaac is by Rebecca but little bit further. If you turn around, then you can see the Abraham. We came out of the muslim side, and some of us went into the Jewish section. 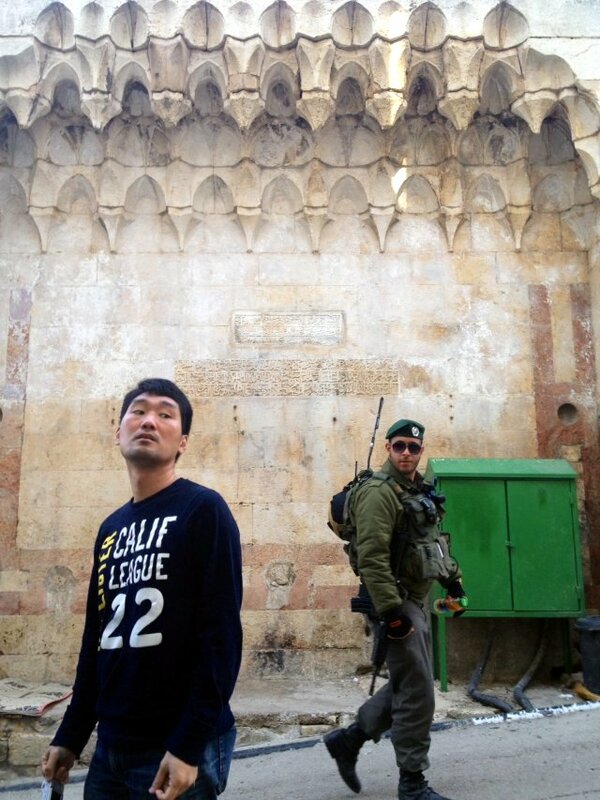 We must have gone without our local guide because even though he is Christian, the Israeli soldiers did not let him through. It is very stupid. They know he is law-abiding good citizen and just a tour guide. 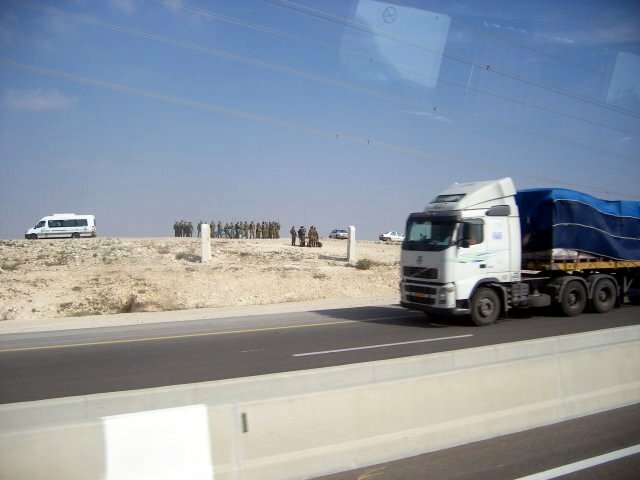 As you can see in the picture, Hebron and around the Machbelah area is very tensed and so many soldiers and military vehicles are always circling around. In the Jewish section, there is partition and writing “Women” in hebrew. The closer side which is right is Abraham and Sarah. The farther side which is the room on the left is their grandson. When you stepped into the room, Leah is on the right, and Jacob is on the left. 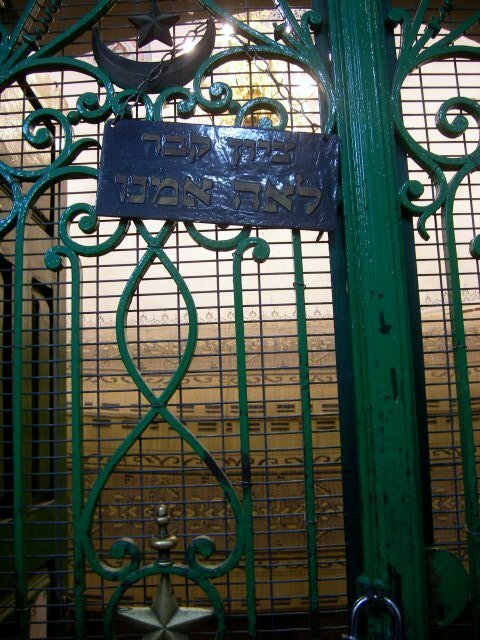 There is no English signs at all either muslim or Jewish side. In the muslim section, local guide read us the Arabic. In the Jewish side, I was able to recognise the Hebrew names. 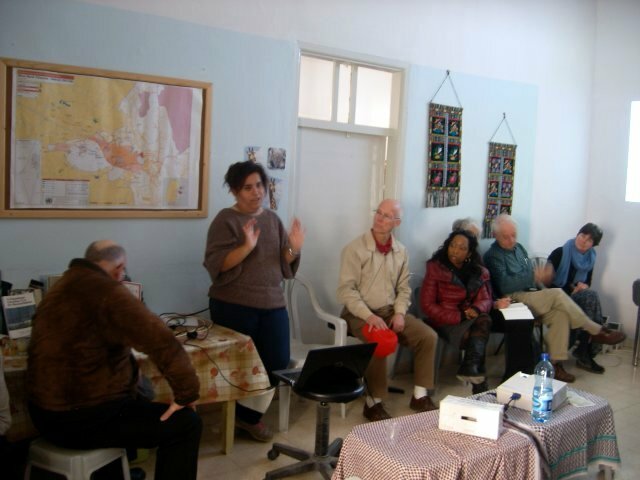 Then we went to the Christian Peacemaker Team whose office is in old town Hebron. They have a lot of difficulties working for the persecuted Palestinians, and even one of them were killed. But they still standing on their ground and working, sacrificing for others. 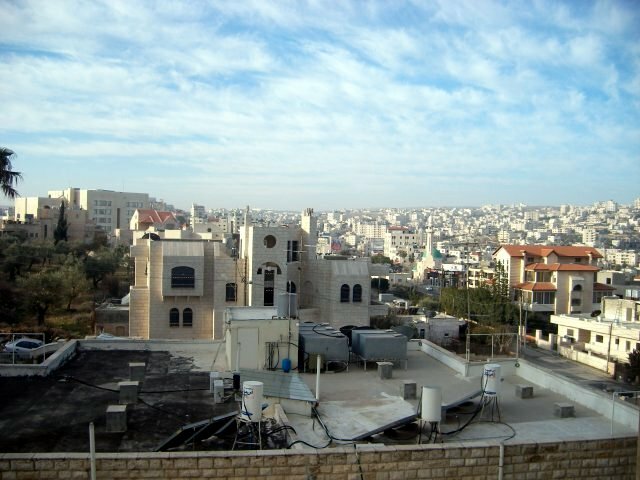 This is the Hebron view from the Christian Peacemaker Team office. 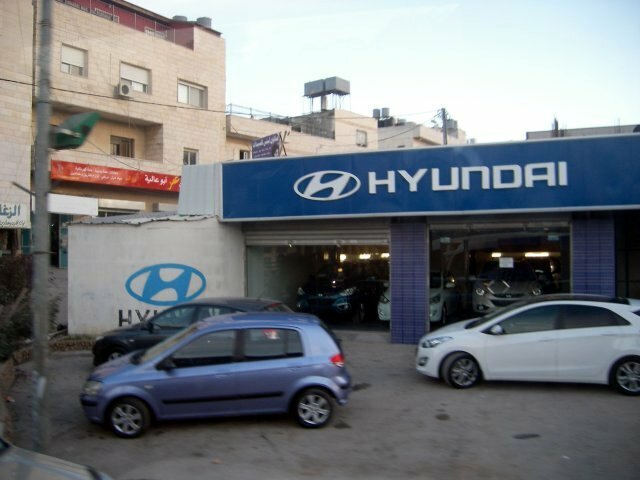 In Bethlehem, I saw Hyundai. 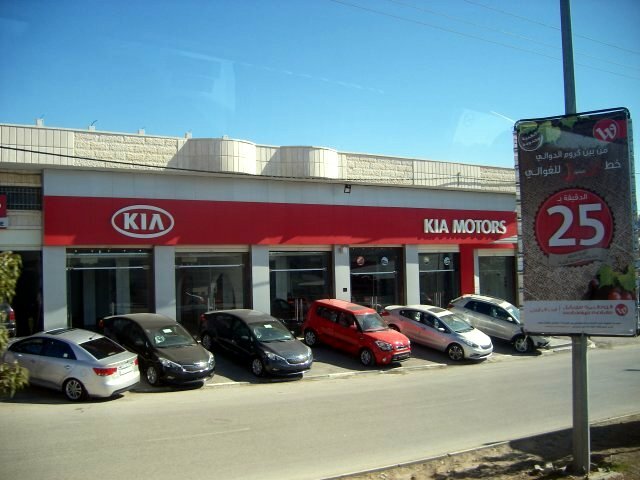 And in Hebron, I saw Kia – another Korean auto maker. 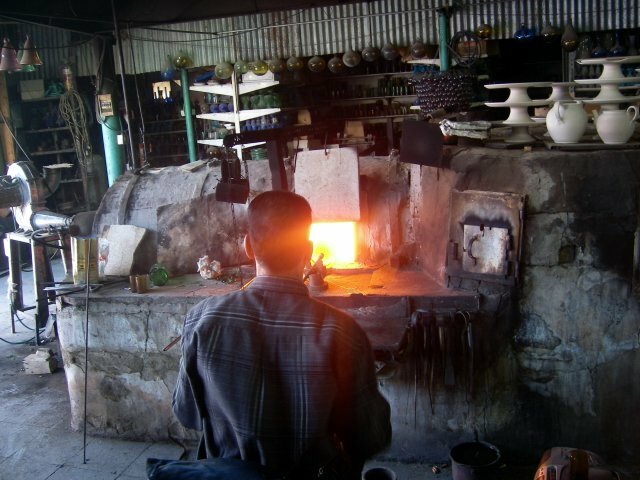 Then we went to famous Glass Factory. Two were working on each side of the furnace. They presented us great show while they were making glass vases. It is amazing and when they do it, it looks so simple. Do you see the horse? It is not for tourists, nor fun. They use it as mean of transportation. 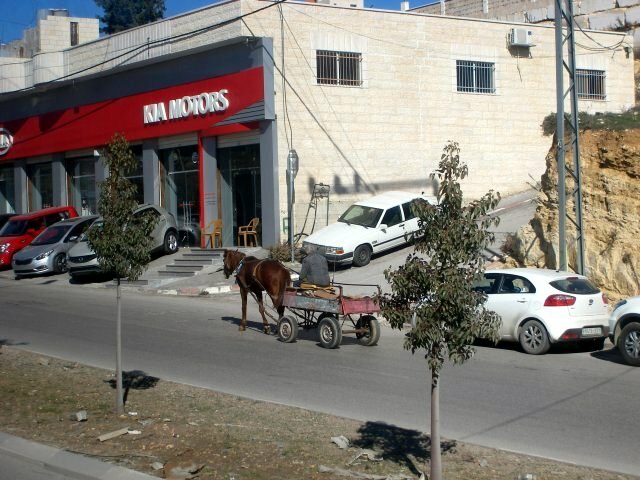 I’ve seen some people use horse or donkey as mean of transportation only in Palestinian area. What does this mean? Downtown Hebron is crazy place with tons of cars, buses, trucks and horses too. 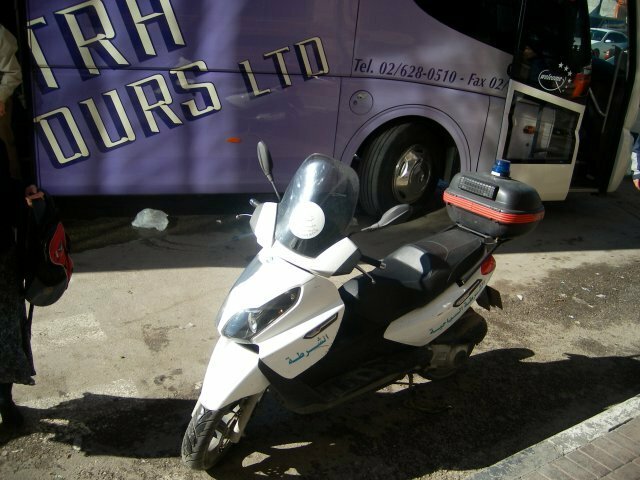 I’ve never known that there is such thing like Tourist Police. But the officer came to us and guided the bus, sometimes stopping other traffic. How nice to us, the tourists. We went to a very nice restaurant in Hebron whose name is ‘Hebron Restaurant.’ I ordered sheep neck. It was not bad, but ao tender and mild. The meat just melted as soon as my tongue touched it. Speaking of tongue, I ate beef tongue for dinner. 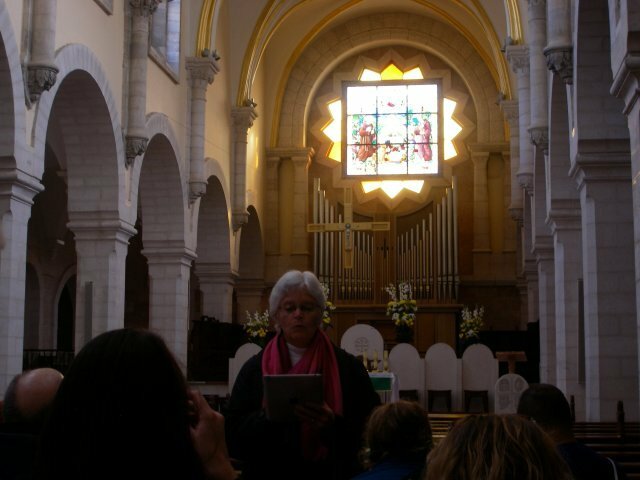 Then we went to nearby synagogue and listened to a religious Jewish settler in Hebron. He said many things, but I guess it was not that impressive to McCormick group. One of the things he said is that Israeli government built hospitals, schools for Palestinians and many of them are thankful for that. When he said that, I was confused if he is Japanese speaking to Koreans under Japanese occupation. 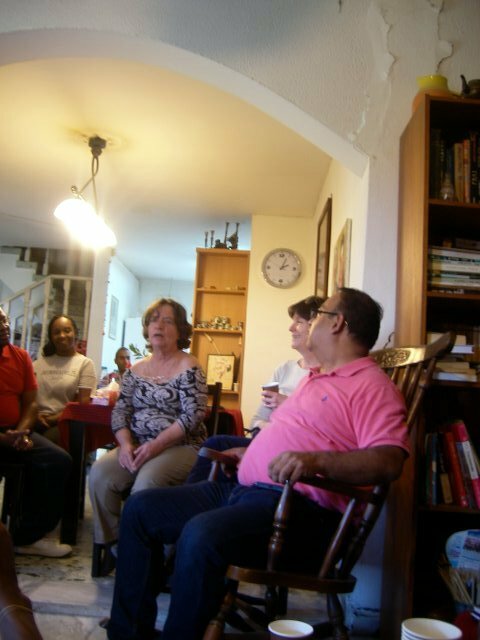 At the evening, we invited Imam Maher Assaf. Imam is a title for Muslim religious leader. Our local guide sitting next to him translated Arabic into English. He is liberal muslim, and most of the muslim does not think like him. But he is quite interesting figure to me. At the evening session, our local guide George was with us and he introduced us Palestinian traditional (very strong alcoholic) drink. I forgot the name, but we mixed it with water and put some ice. Of course I did not drink it. Today, we left the White Sister’s guest house and brought everything into the bus. 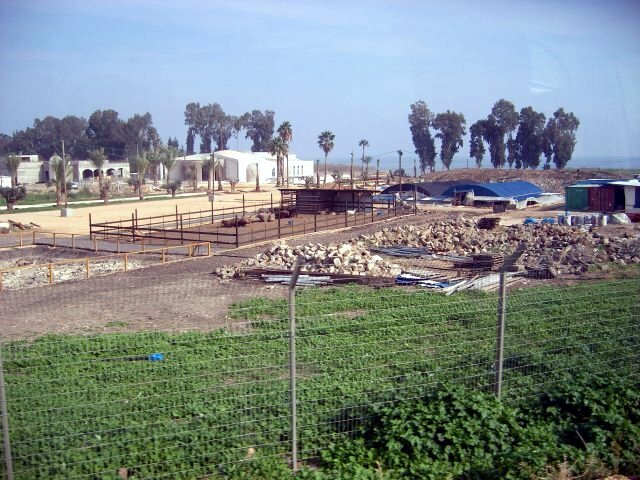 Our first destination was Lachish. On the way, the local guide told us that the picture above is where the ark of the covenant stayed for 18 years in the time of David. You may remember that when the ark came back to Jerusalem, David danced and became (half) naked. Then we also stopped at a point where David and Goliath fought. 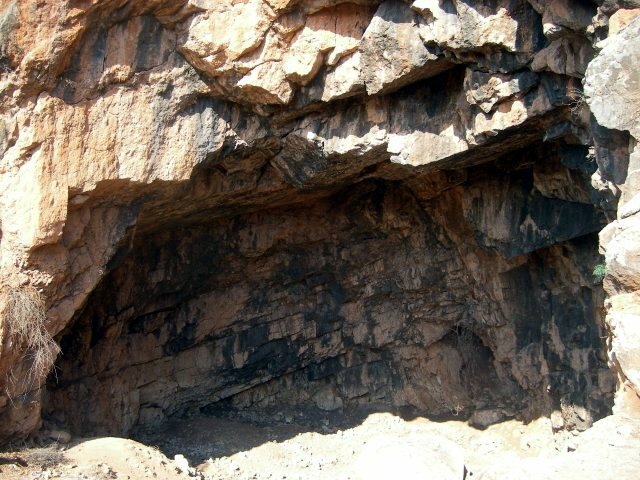 The picture above is where the Israelites were camping. 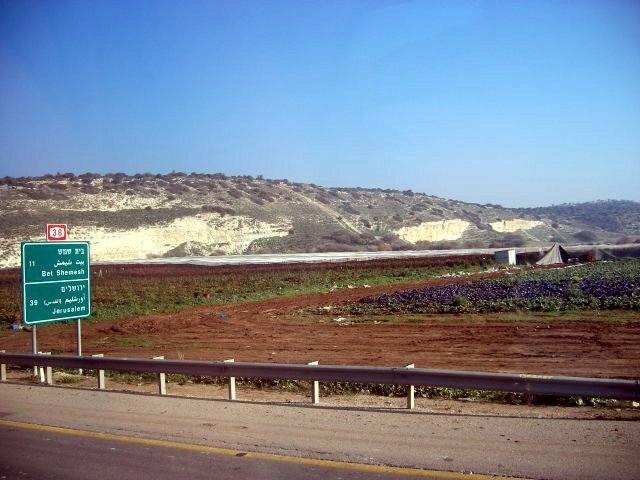 So far, I’ve never seen the west of hill country before because we went to east side only such as Qumran, Jericho, etc. And first day when we landed on Ben Gurion airport, it was already dark so I could not see anything. On the east side, everywhere is almost wilderness. And today, I was so surprised that the west of hill country is so green. It is such great contrast. At last we went to Lachish. 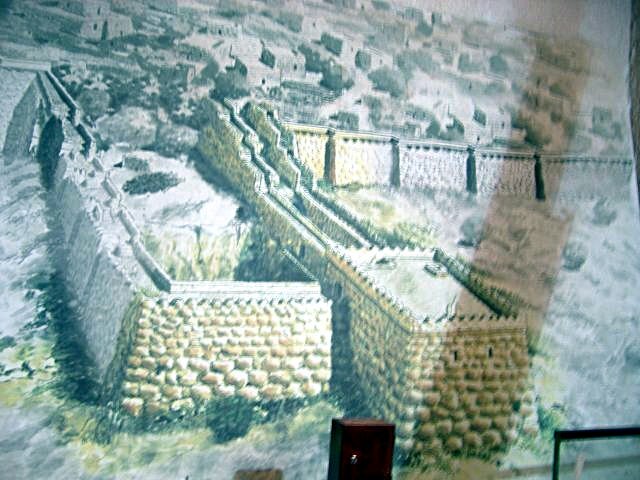 Lachish is the city at the border of Southern Kingdom of Judah, and was conquered by Assyrians in the time of Hezekiah. If seen from down under, it is just another same hill. It is not impressive at all. But you need to go up to find out why it was very important place. On the way up to the Lachish wall, we saw the temple of Sun built by Canaanites before Israelites came. 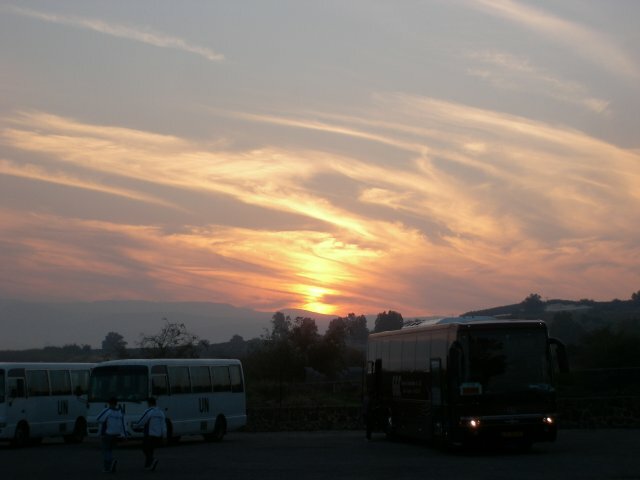 Once you come up to Lachish, you know why it is so important. You can have 360 degree view which means you can control the area. 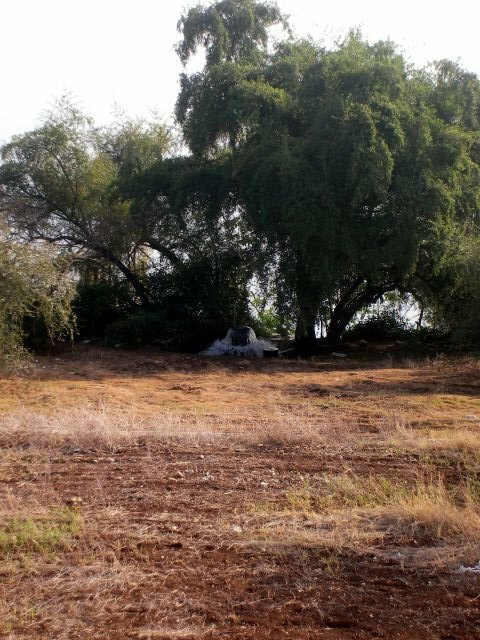 It was Judean military camp and after it conquered, it became Assyrian military base. And even geographically, it is the connecting point between Mesopotamian and Egypt. It is very important place for strategical purpose. This is the city gate of Lachish. 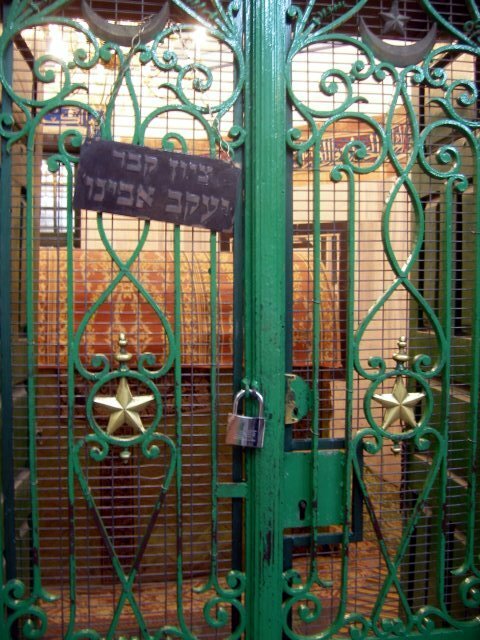 It has three gates and a few chambers where the elders were and where people brought their issues to them. 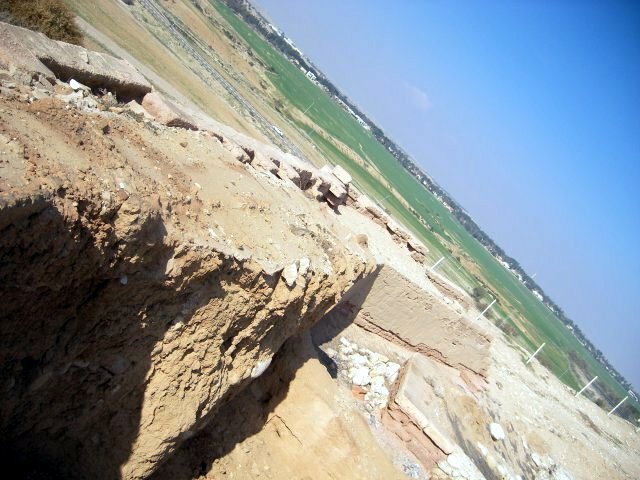 This is the remain of the Assyrian ramp. 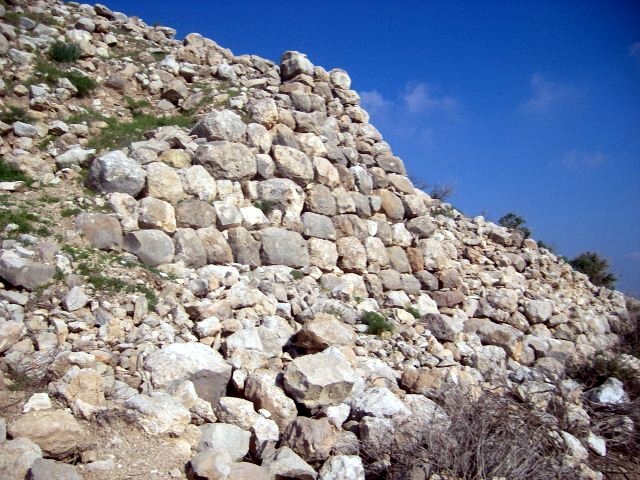 I wonder when the Israelites in the Lachish looked down on the Assyrians working and building the ramp, what would they have felt and thought? And what would they prayed for? And then we went to highway resting area where McDonald’s is with other restaurants. 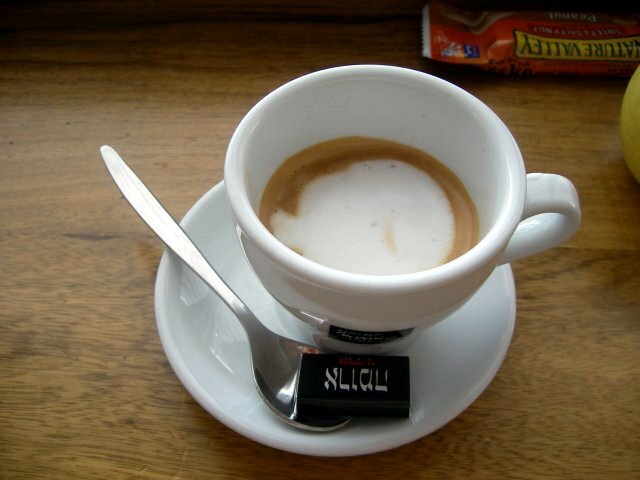 I just had an Espresso coffee. It was good and it was 10 NIS, but it was really small. That cup is half-size of my palm. I saw the military training or doing something a few times. In the resting area, three or four Apache helicopter was hovering around. I even saw a tank travelling on the highway. Of course, this is the land of conflict. 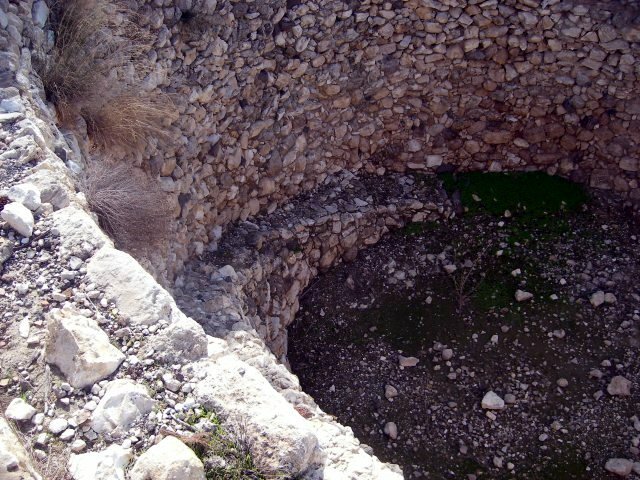 This is the well of Beersheba where Abraham made treaty with the people there, basically saying, “I’ve good to you. So be good and nice to me and to my descendants.” So it is mutual treaty to be nice each other. Now where is the mutual treaty gone? This is the bench between the city gates in the time of Boaz. This is the bench where Boaz sat with ten elders of the town. 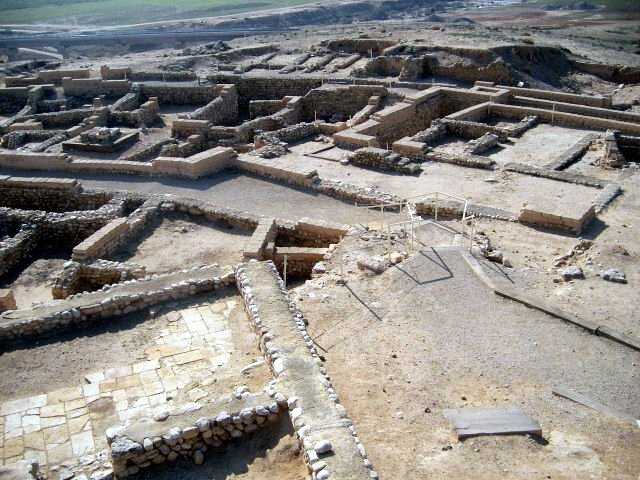 This is half or one thirds of Beersheba from the higher point. 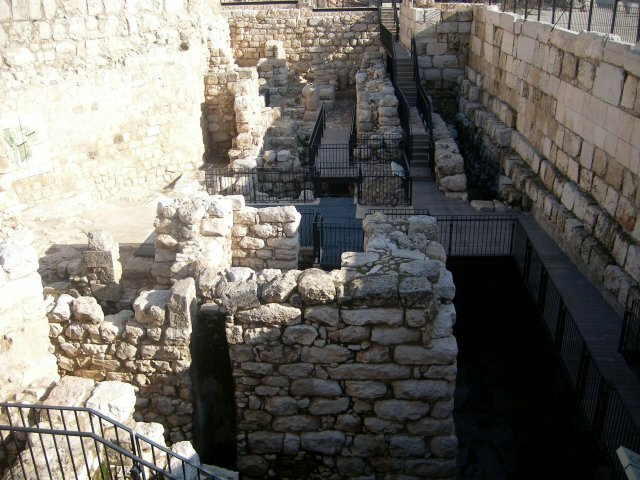 This is the remain of the house built upon the city wall of Beersheba. 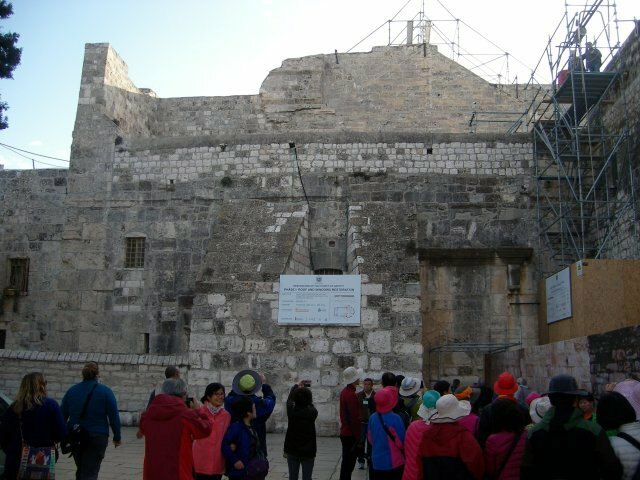 Rahab in Jericho also had a house on the city wall. I think marginal people would have lived on the city wall because it would be dangerous and scary in time of invasion. This is the water reservoir. It is so deep and even down there, there are much space to store water from the rain. 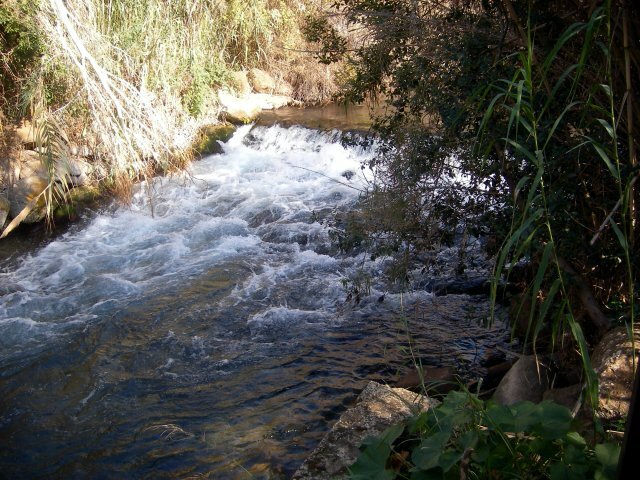 Then we went to Hagit Beck, a Jewish lady in the very nice town of Omer near Beersheba. She is an activist and volunteer member of Machsom Watch. We heard many interesting things from here. In the town of Bethlehem, I saw a Hyundai. It is always nice to see Korean companies doing well around the world. 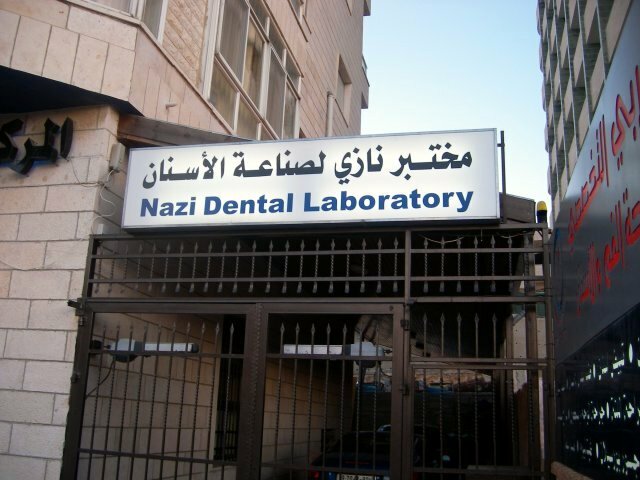 This is the dental lab right next to the Hotel. We all were surprised by the name of it. Is it what I think it is, or just a personal name. If it is just a personal name, is his/her name just happened to be like this or by purpose? This is St. Gabriel Hotel. It is very nice and beautiful. The dinner was buffet, a very very nice one. But my room mate experienced very bad thing here. Well…. Today was a Museum Day. 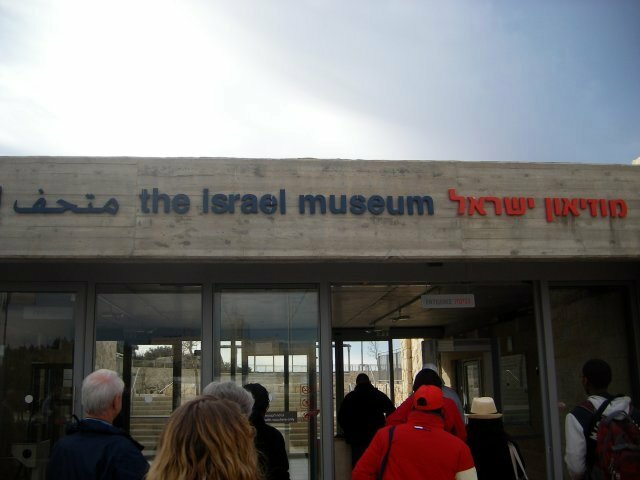 We went to Israel Museum, and just right after the gate, there was marvelous display of Jerusalem in around A.D 60s. 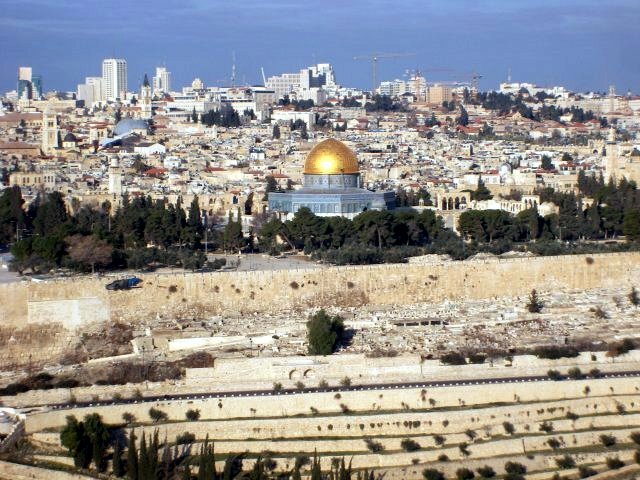 The centre is the Herod’s temple on the temple mount. 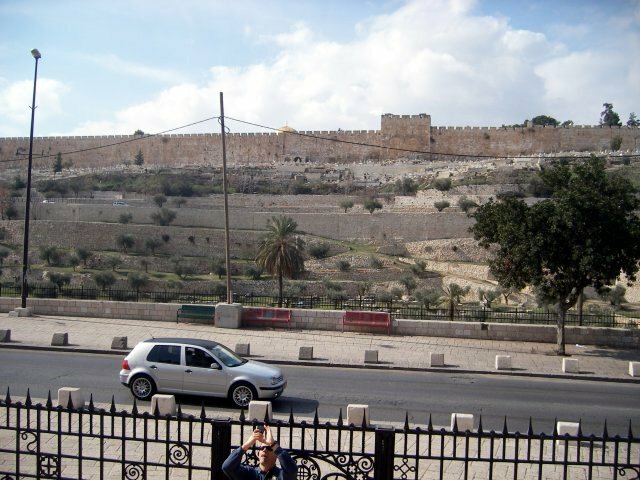 Right side of the temple mount is the pinnacle (both corners), and on the upper left of the temple mount is the Antonia Fortress where people think Pontius Pilate stayed, and consequently the Via Dolorosa begins here. We spent quite a long time there, and we headed to the shrine of the book. On the short way, where were a few displays and I was told the one above is from 2 century B.C. This is outside of the shine. 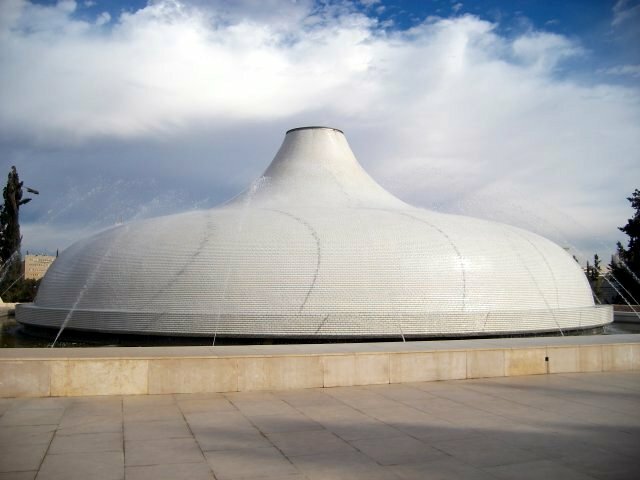 The white dome symbolises the sons of the light which is the Essenes of Qumran. But I think Israelis think it is for themselves. And the waters surrounding it means that they are ritually clean. The other side of the shrine is the dark wall which means the sons of the darkness. 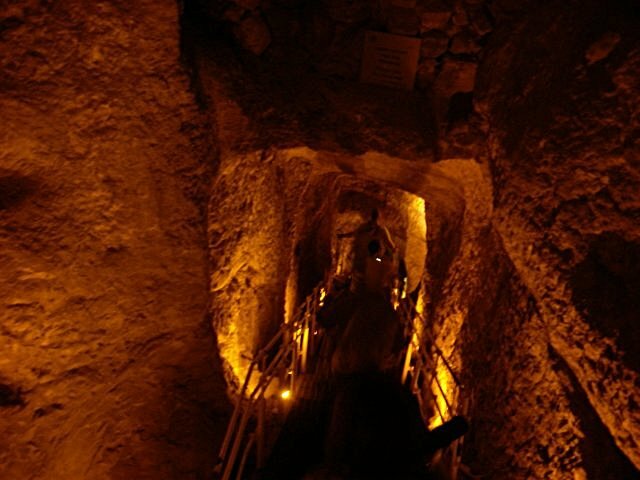 Inside of the shrine, some of the dead sea scrolls are displayed. There are also many cool things related to dead sea scroll and/or Aleppo Codex. But the photo shooting was not allowed. 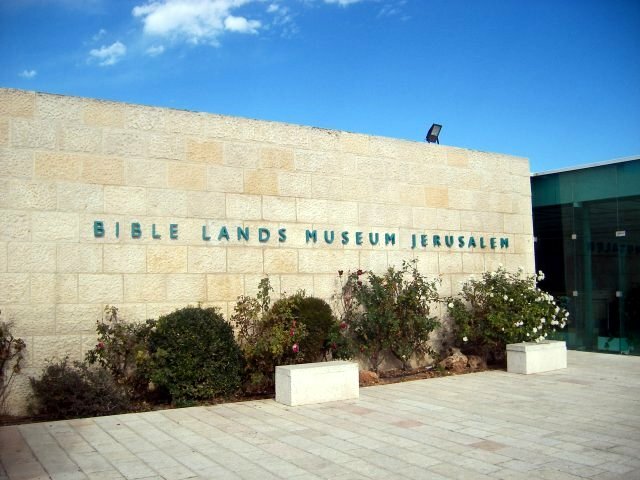 Then we went to Bible Lands Museum. They had special display for Biblical texts and books. We saw many earliest Bibles in various languages. I was told that their next display will be in Vatican. Again, the photo shooting was not allowed. 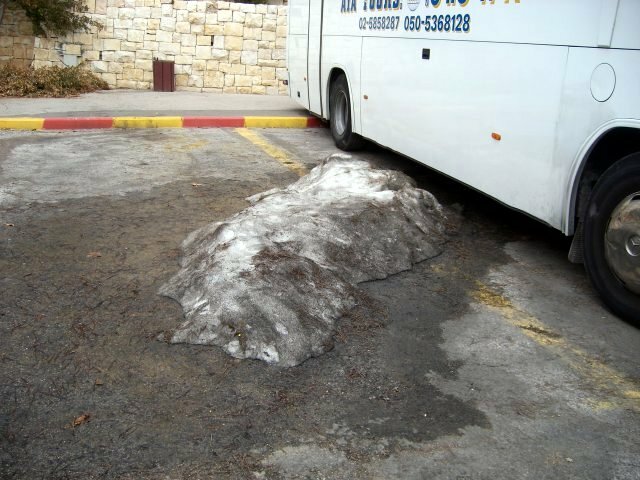 On the first day in Israel, I was told that Jerusalem had snow earlier which is very unusual. And today, I saw some of the remains. Well, in Winnipeg, Canada, snows remains until August in snow dump site. The other day at the St. Anne’s Church, the father said that he had hard time removing the snow because there was nowhere to buy or get shovel. 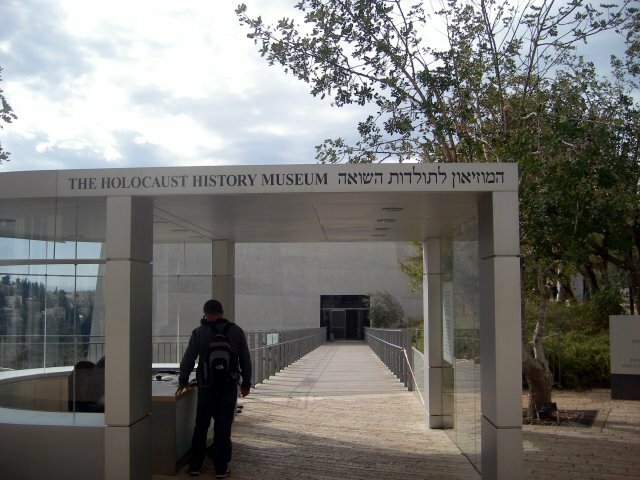 We went to Holocaust Museum. It was actually my second time in the holocaust museum since I’ve been to the one in Washington D.C. And over again, the photo shooting was not permitted. 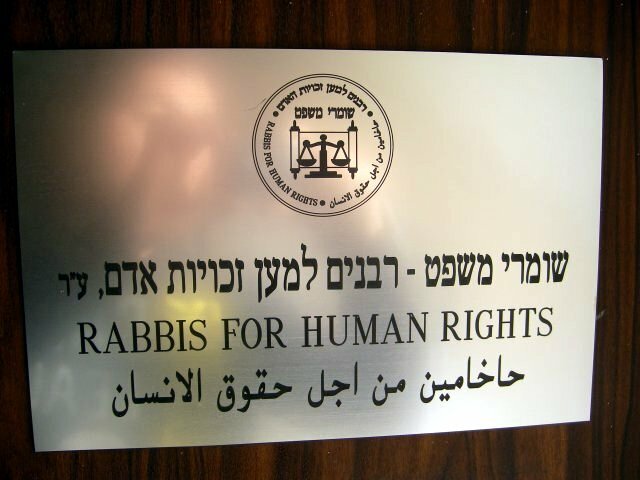 Our next visit was the ‘Rabbis for Human Rights,’ and we listened to Rabbi Arik Ascherman. It was quite interesting time. And it is so good to see some of the Jewish people working and fighting for the Palestinian. The problem is that they are just minority. If I have chance, I would like to write another post about my short research. I expected the Arab countries helping Palestinian a lot, because they always blame Israel and they speak same Arabic, and believes in same Islam, and the same race. But my expectation betrayed me. The surrounding arabic countries have been worse than Israel. Today we went to Mount Olive first time. 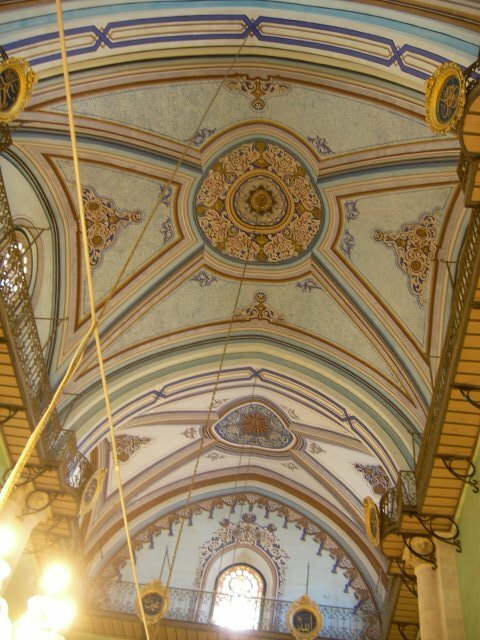 In the picture above, you can recognise the dome, and probably the temple wall. 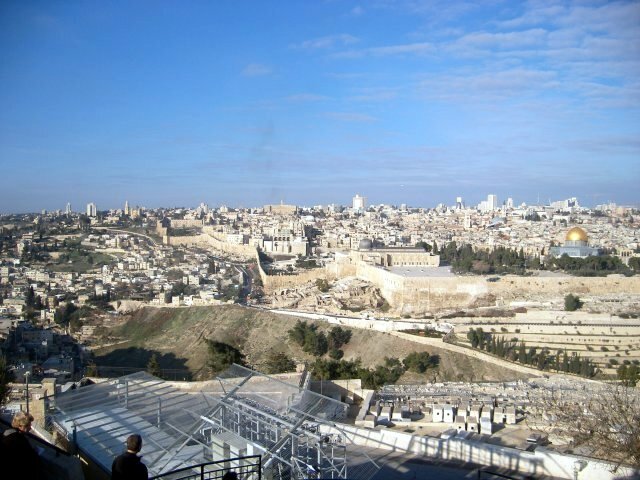 In front of the temple wall, you can see the Kidron Valley, and on the left side, you can see that famous Hinnom Valley. This is a nice view with the Golden Dome from the Mount Olive. Jesus probably saw the similar things, except the Golden Dome and the houses in the north and west. He saw and wept. I was awed at this sight. Living in Seoul and Chicago, I am very much accustomed to the skyscrapers and giant buildings, and still awed at this. I cannot imagine how much the ancient people would have been awed at this. 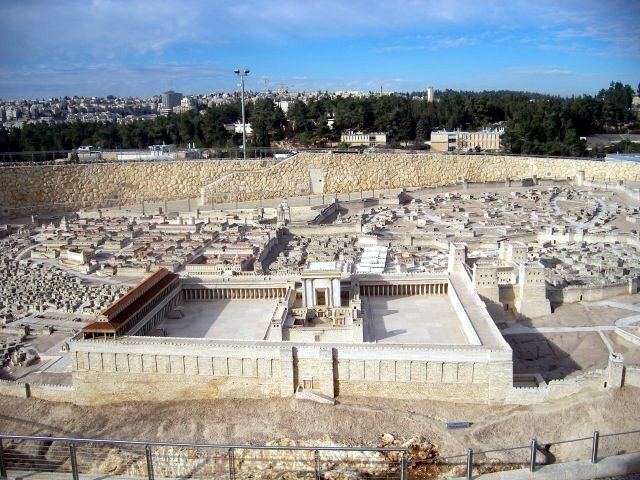 It is said that the Herod’s temple is the largest temple in the history (as a single platform temple). This view from Mount Olive is amazing. On the Palm Sunday, Jesus went into the city riding on a donkey. 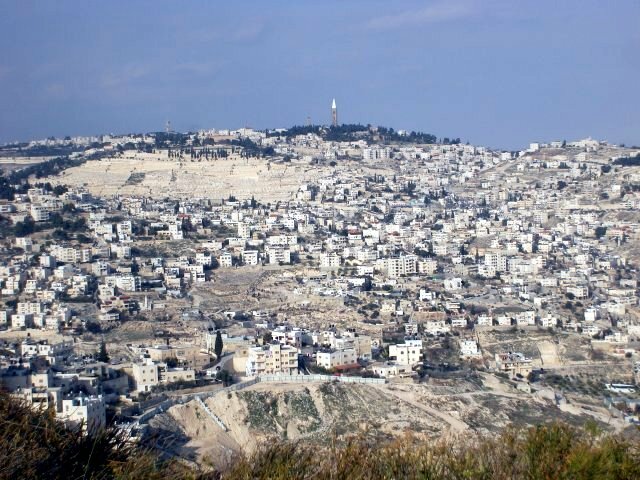 Mount Olive is on the east of Jerusalem. 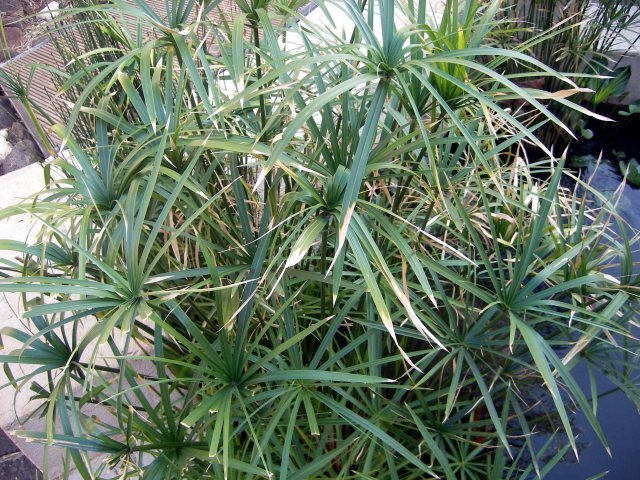 Shouting crowd, Palm branches, East, Sun on the back… everything indicates Messiah. 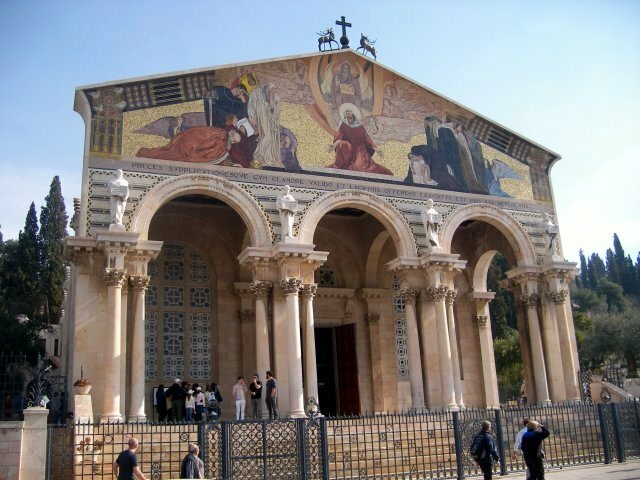 This is the Gethsemane from afar. 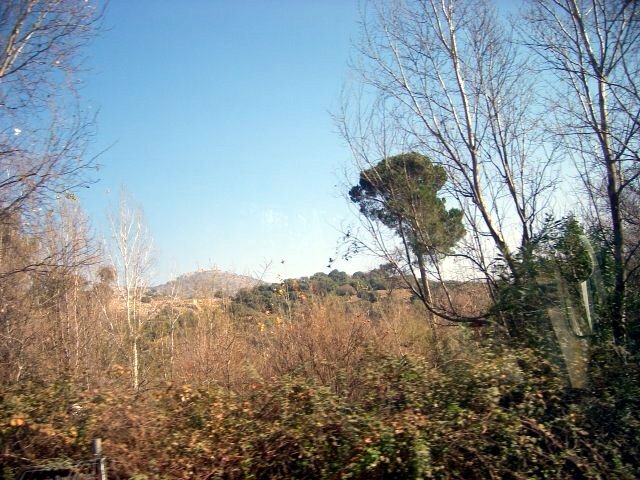 It is very close to the city. This is necropolis. 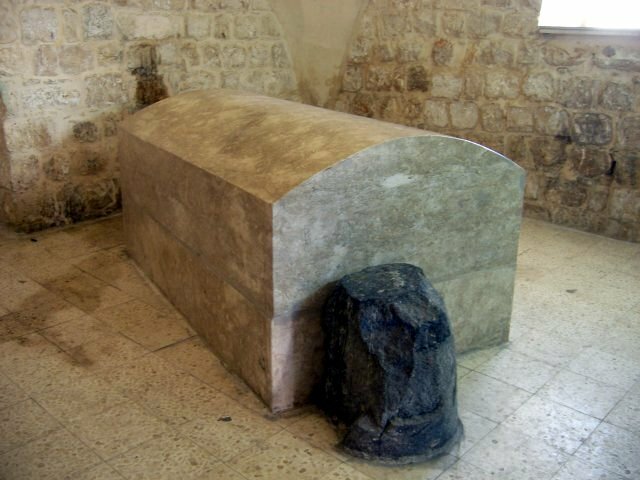 In Israel’s burial custom, they put the dead body in the tomb and wait until it is totally decayed leaving bones only. Then they collect the bones and put them in a stone box with the name. 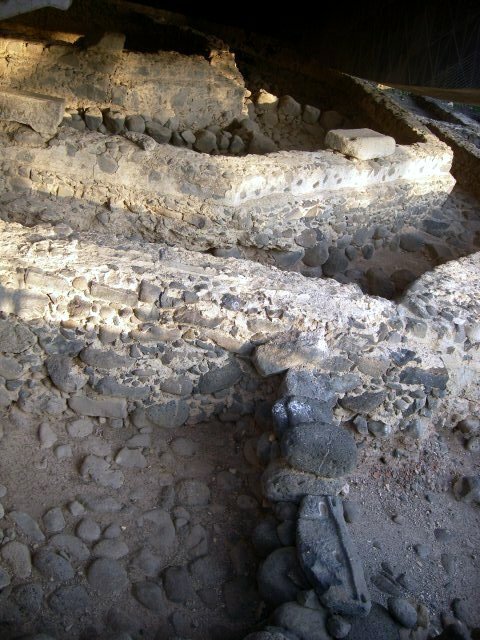 In the necropolis, you can see all the bone boxes. And they put some perfume on the dead body so that it does not smell too much when the family comes to collect the bone. That is why Jesus said the lady was preparing for his funeral when she put the perfume on him. Then we went to the south side of the temple wall, just under the Al Aqsa Mosque. 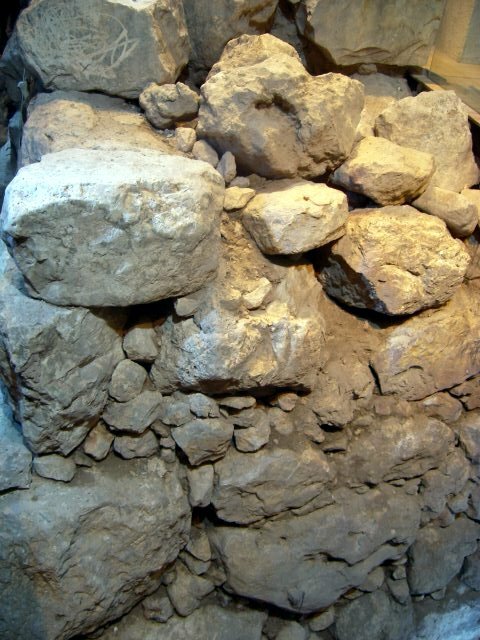 And this is the Solomon’s temple wall remains. City of David was our next destination. 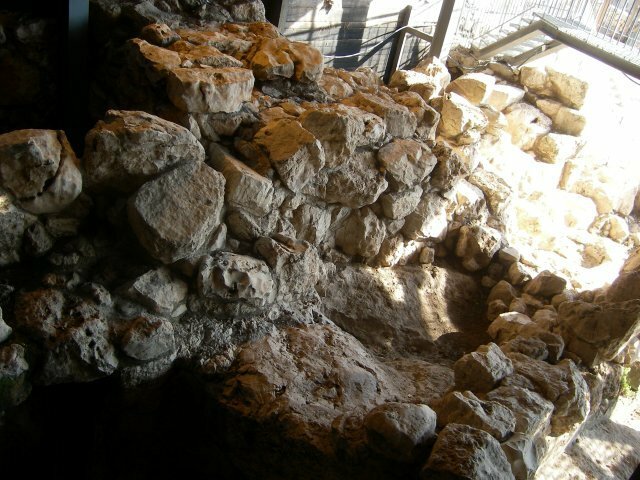 This is the toilet bowl from the Palace of David. It must be personal rest room for very important person, probably a king. You cannot say that David did not use it. It also has running water. 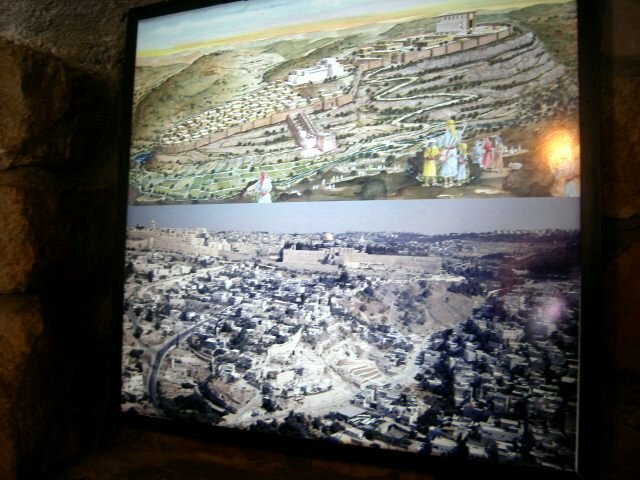 This is nice picture showing the City of David and the Temple in the OT times. The bottom half is the picture of modern-day at the same place. The white big thing in the middle is David’s Palace, and I can understand how and why David saw the bathing scene. And we went to the water system, kind of secret one. 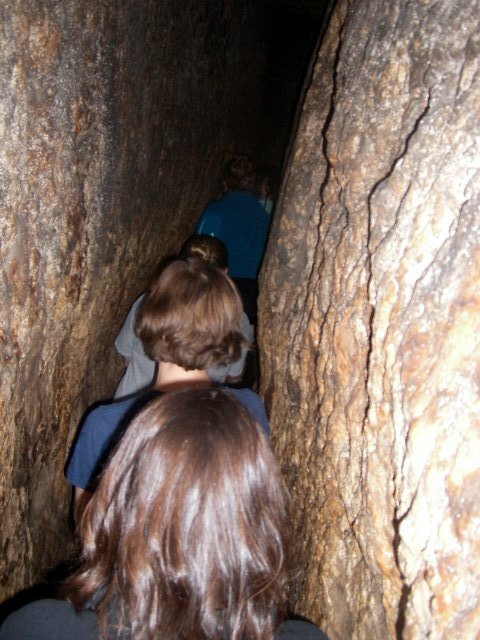 They went to this passage to carry the water. Then we saw the Canaanite Wall next to it. David and his commanders saw this wall. And the Canaanites stood a blind man and a lame man to mock David. 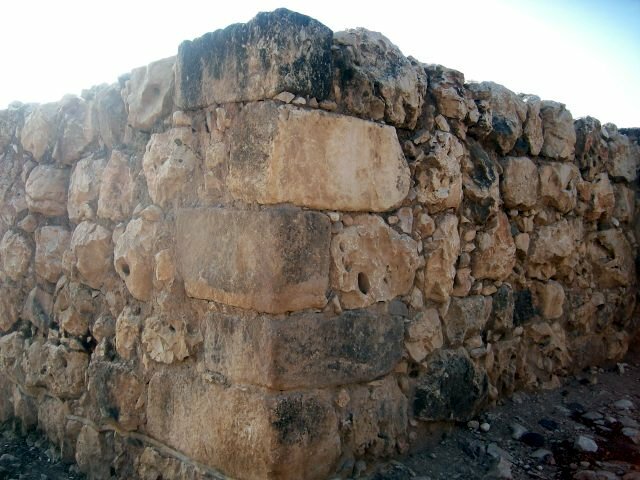 That means not only ancient Canaanites had crude sense of humour, but also they were so confident about their wall. 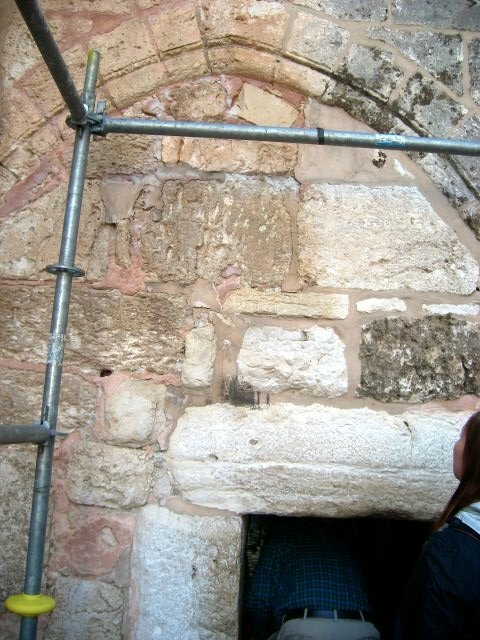 At the drawing above, the left side is Canaanite Wall. And the right is Hezekiah’s protection of the spring. 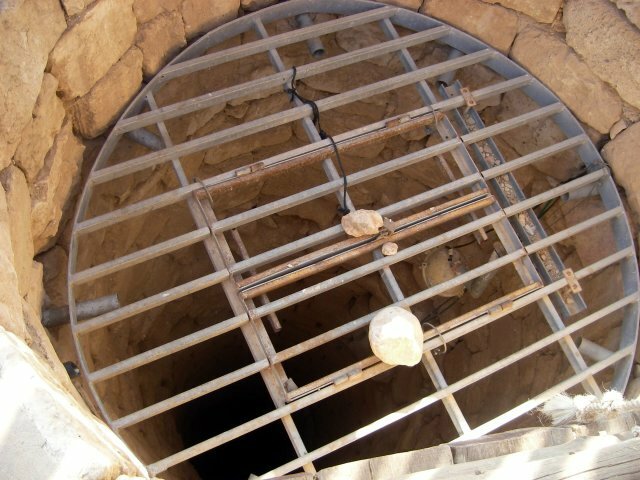 And the Hezekiah’s tunnel (for water) is underground from the spring into the city. David must went through this tunnel. Not all, but some of McCormick group went through the Hezekiah’s tunnel. It is actually water way. 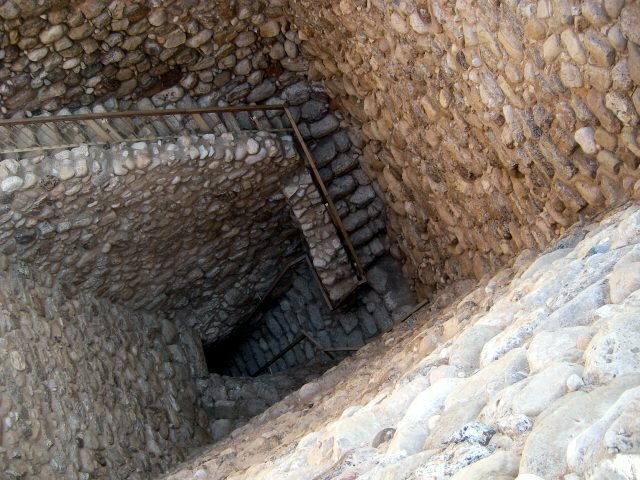 Hezekiah knew that the Assyrians coming, and the people inside the wall needed water, so he dug the water way so that they can get fresh water without going out of the city. You can see the water is still flowing, and I actually tasted – surprisingly it was good. 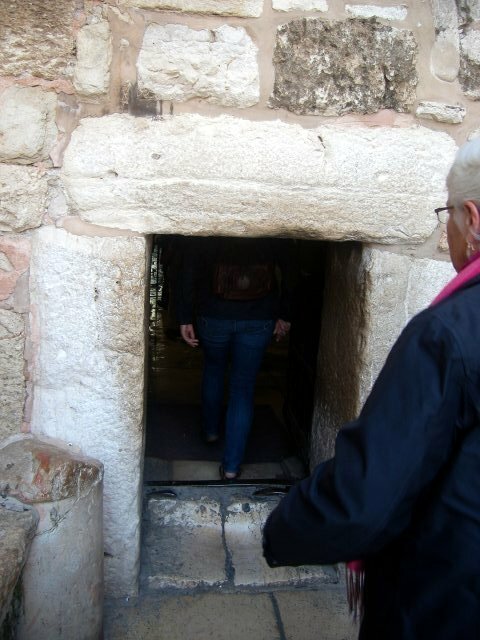 At the end of the tunnel, we met the Siloam where Jesus healed the blind man. Then we went to Gethsemane. It is the Basilica (or Church) of Agony. 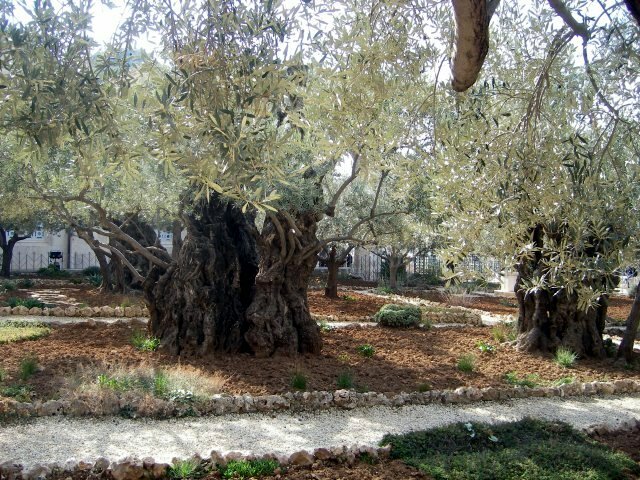 Next to the Basilica, there is still a garden, and the biologists say those olive trees are more than 2,000 years old which means, Jesus must have seen them. 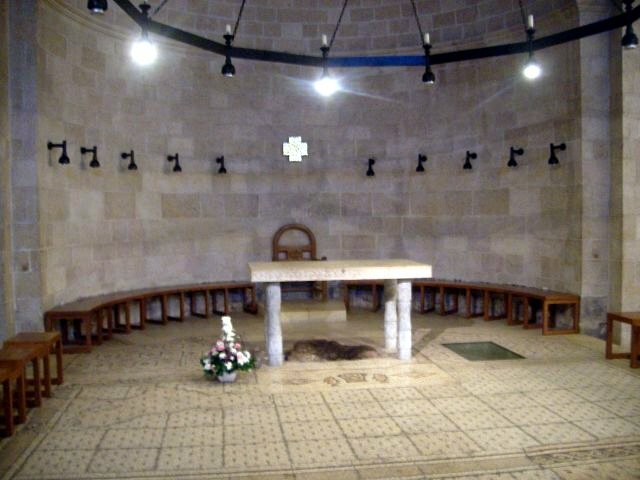 Jesus was arrested while he was praying here. Standing here, I realised that this Gethsemane is the middle point between the city and Judean wilderness. If he wanted, it is 100% possible for him to flee to where David fled. But he did NOT which means he meant his death and sacrifice. 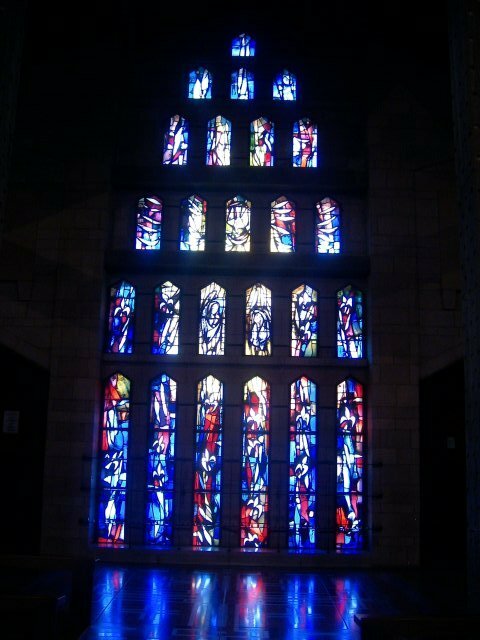 Inside the Church is so beautiful. The ceilings, windows, front patterns, drawings… and everything. 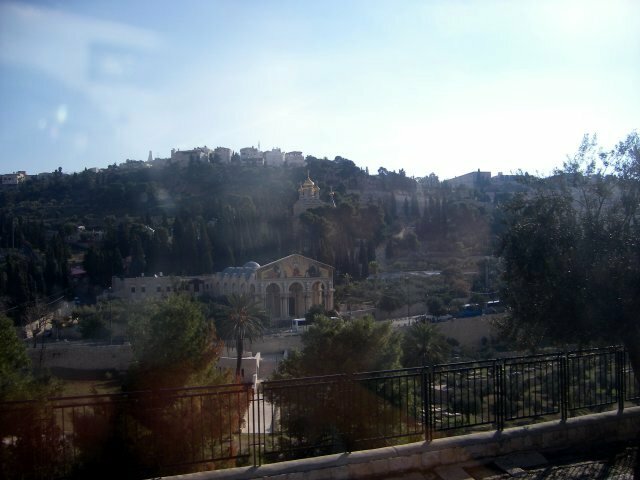 This is the view of the temple mount and the golden dome from the Gethsemane. It was not zoomed. It just shows how close it is to the temple. Until now, I had no idea when I was reading the Bible without any knowledge of geography even though I read the maps. When Jesus was taken from the Gethsemane to the temple, and to the Pontius Pilate, and to Herod, it sounded to me like from Kansas city, to Chicago, and to Washington D.C. How can they travel in ONE day? But now I experienced and knew the distance and everything, it makes sense. We went to Bethlehem and had lunch at Palestinian restaurant. 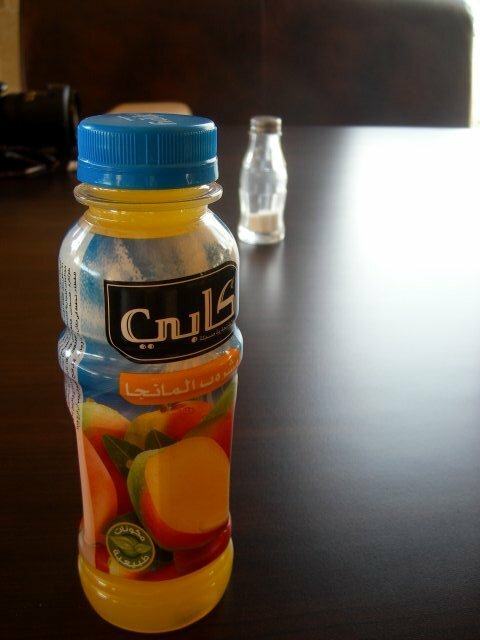 See the bottle that it is filled up to the top. In America, the bottles always has some room in case of freezing. And here, this means that there is no chance to freeze. This is chicken pita, and it was super delicious but pricier than that I expected – 40 NIS. I may skip the lunch tomorrow. 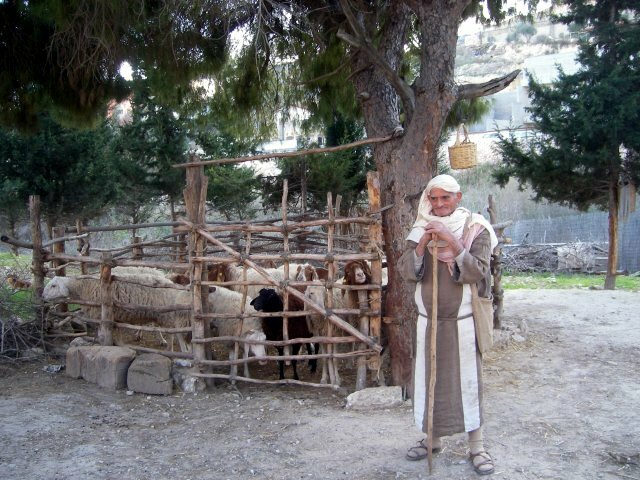 Then we went to Shepherds’ Field where the angels came and told the shepherds about the birth of the Saviour. There are three places recognised as shepherds’ field, but this is Catholic one. 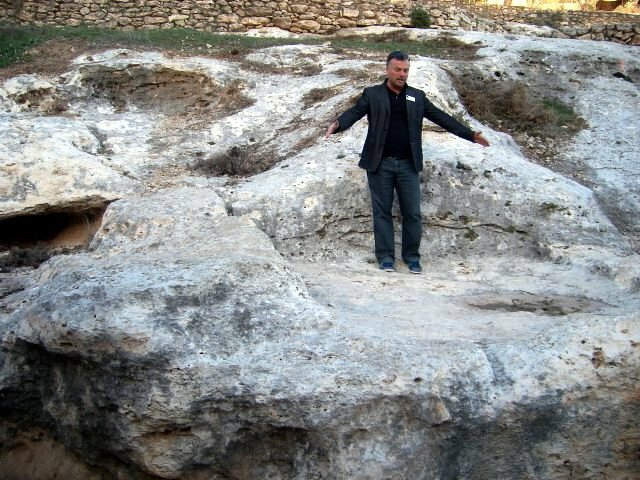 This is the rock where the shepherds rested and probably saw the angels. Inside the Church is quite beautiful and small. The acoustic is very good, but I think it was better at the St. Anne’s Church. In the shepherds’ Field Church, anything down is shepherd and anything up is angel. While we were moving on the bus, our local guide George explained us about the oldest way of agriculture. It was making a terrace as seen on the picture above. Here, the land is chalk. They dig the chalk in a row shape, and put good soil on it, and plant. And the chalk does not absorb the water, so the water flows down to the next terrace. Then you can just water only the top row. 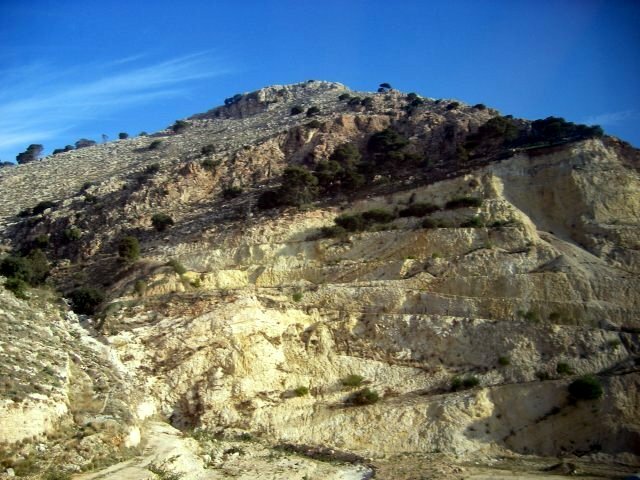 On the sites like this, it is easy to find some good soil, some chalk and bad soil, the rocks, some thorns. And this is perfectly fit with the parable of Jesus. Then we met Chaska(?) 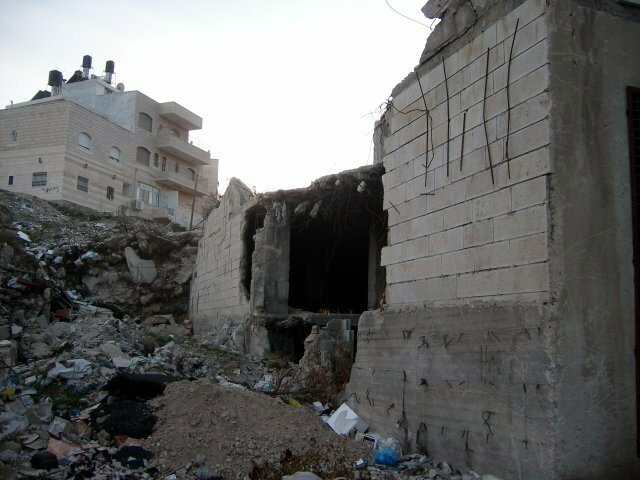 from the Israeli Committee Against Home Demolitions. She is very passionate and energetic Jewish woman who works and fights for the human rights of Palestinians. 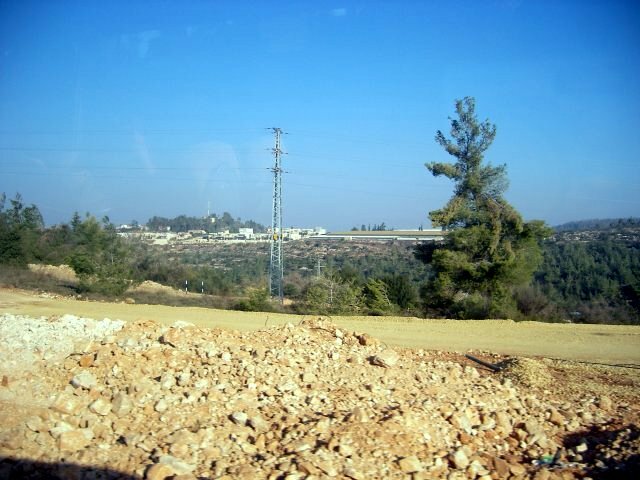 The photo above shows the ghetto Palestinian area without any trees. I actually drove through there, and it was so crappy, dirty, and all infrastructure was so bad, and not maintained by the government at all. This is Jewish area. There are lots of trees, and high buildings. And above all, she said, Jewish area anywhere is identified by the landmark of cranes which means continuous development. 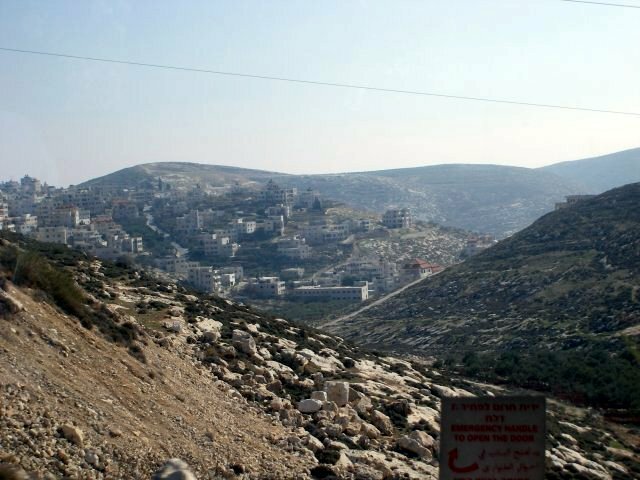 Israel government builds Jewish settlement in the heart of the Palestinian area. 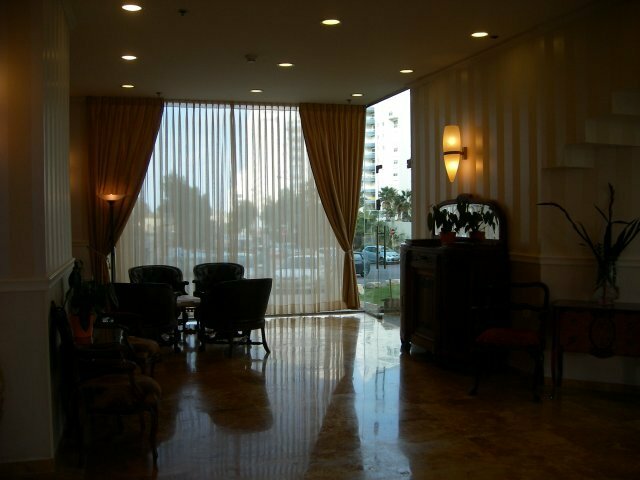 Here the front row is Jewish apartment which is nice and does not have any black water tank. They get enough water. Far back of the photo, you can see the small black dots which are the water tanks. Because the government does not work on the infrastructure, they have to connect the water by themselves while they pay the same amount of water bills. And mostly they connect too many on one pipe and the water pressure drops down. That is why they must install water tanks. 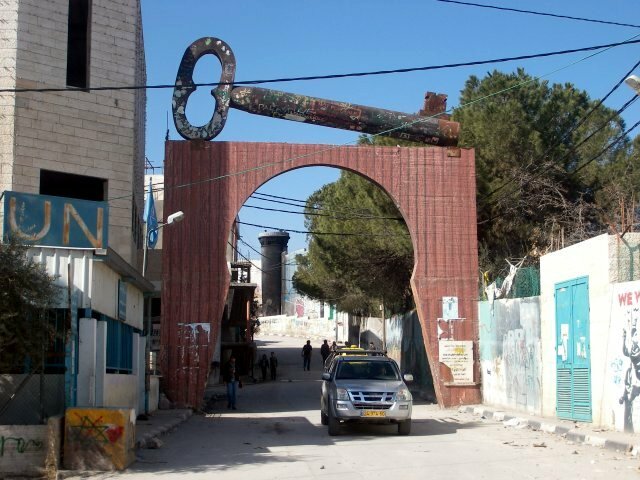 Many, actually most of the Palestine communities are separated by the giant walls and disconnected from the neighbouring community. And they don’t have the freedom to move. 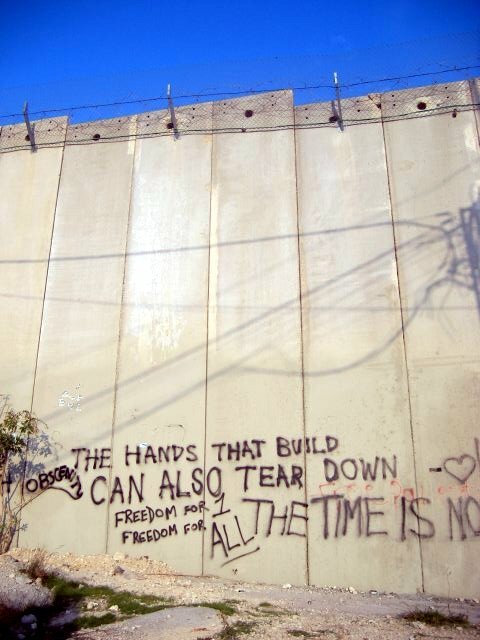 This is the separation wall in Jerusalem. This is the scene of home demolition. 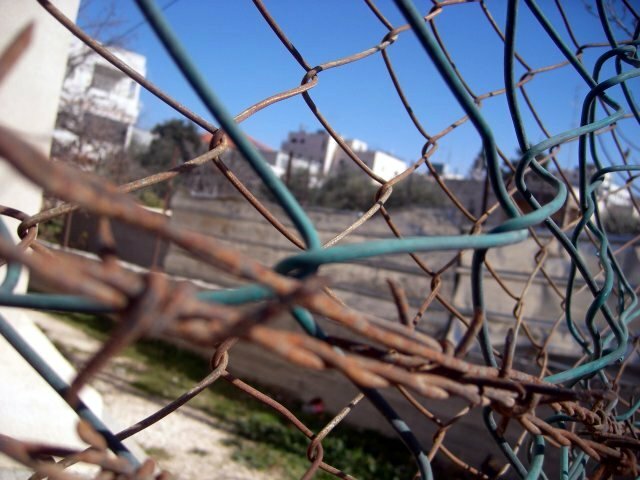 Israel government does not allow the Palestinians new house building permit. But they have to build. And later Israeli government give them warning of demolition. And then later suddenly they come around 1-3am and destroy the house. It is total operation with the demolition team, military, and police. In my opinion, Israel government simply want them just disappear.